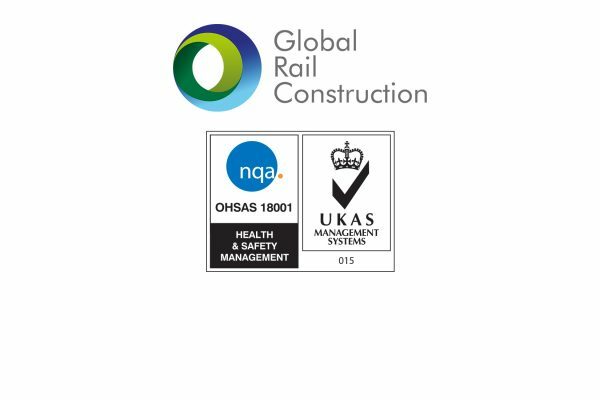 Global Rail Construction has successfully completed this year’s 3-day OHSAS 18001 [surveillance] audit of our Health and Safety management system. We are pleased to note that we did not receive any non-compliances. During the audit an opportunity for improvement (OFI) was identified, this will be addressed going forward as part of our continuously improving culture. A special thank you to Peter Coleman, Head of Compliance, for his hard work and dedication and to the rest of our teams for their continued support of our management systems. Global Rail Construction is committed to complying with legislation to ensure the highest standards of safety are achieved and maintained. Health and well-being is central to our approach. Global Rail Construction’s safety management ethos is based on risk assessment and control throughout our operations. We constantly endeavour to provide a safe place of work, with safe and maintained plant, equipment and systems of work. This approach is enhanced through the provision of appropriate information, instruction and training on and off site, ensuring safe use of materials and substances and by diligently working to prevent accidents. 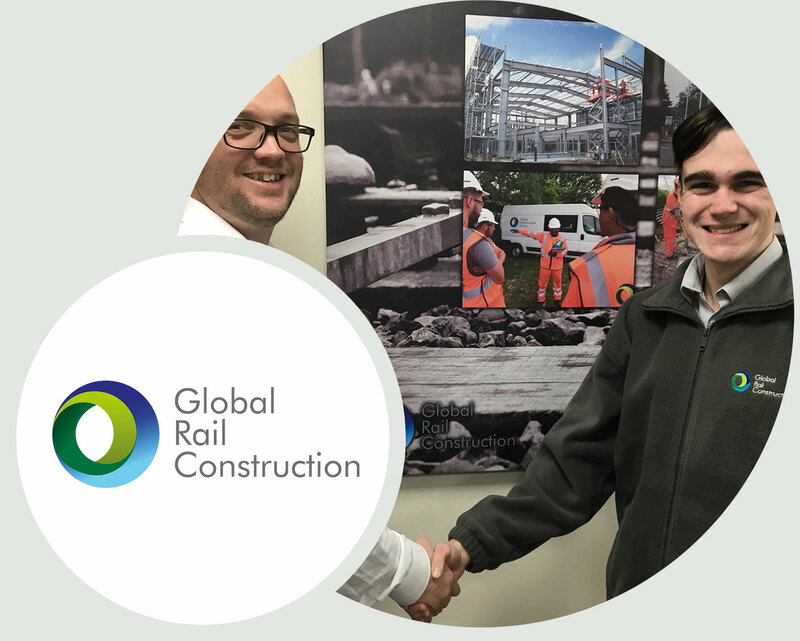 Global Rail Construction Limited (GRCL) are delighted to introduce our latest Apprentice, Charlie Rice, who joins our Global Family. Charlie will be based within our in-house design team where he will be taught by our experienced team of Draughtsman and Civil Engineers to give him the skills to progress. Alongside this in-house training, in September he will attend college one day a week, studying towards a BTEC HNC in Civil Engineering. Charlie has already achieved a Level 3 Extended Diploma in Civil Engineering with City & Guild. The BTEC HNC qualification comprises ten core units studied over a two year period, covering a range of subjects such as Applied Mathematics, Construction and the Built Environment, Engineering Geology and Soil Mechanics and Structural Analysis, Design and Site Surveying culminating in a Group design project that involves putting these learned skills into practice in a real world scenario. 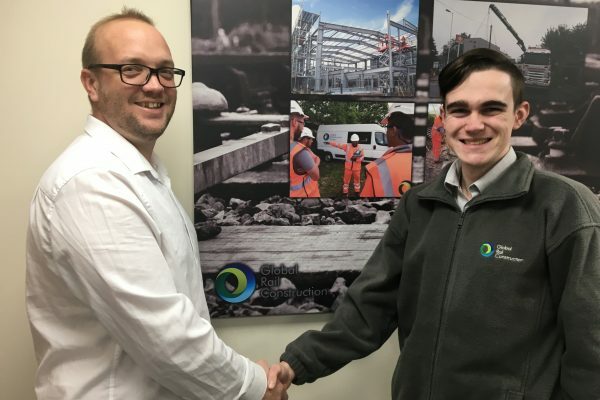 Hiring Apprentices is part of GRCL’s policy to build for the future and we are delighted to welcome Charlie and wish him every success. The health and safety of our employees and others who may be affected by our activities has always been of paramount importance to Global Rail Construction Limited (GRCL). This can be evidenced by a recent safety commendation at the S&C South Alliance, where the company were ranked in the top 3 for Period 10 in respect of their Signalling and Telecommunications (S&T) work. This is a monthly forum, where all supply chain partners attend, so it is great for GRCL to be recognised for its excellence in safety amongst our peers. Safety and well-being is central to GRCL’s approach. The continuous improvement in occupational health and safety management and performance is achieved through the implementation and maintenance of an occupational health and safety management system (SMS), which meets the requirements of OHSAS 18001:2007. Global Rail Construction’s safety management ethos is based on risk assessment and control throughout its operations. The company constantly endeavours to provide a safe place of work, with safe and maintained plant, equipment and systems of work. This approach is enhanced through the provision of appropriate information, instruction and training on and off site, ensuring safe use of materials and substances and by diligently working to prevent accidents. “It was great to receive such praise and this has been duly acknowledged by our client Colas, through a further extension of our current contract with them. What a fantastic effort from our Southern based teams”. 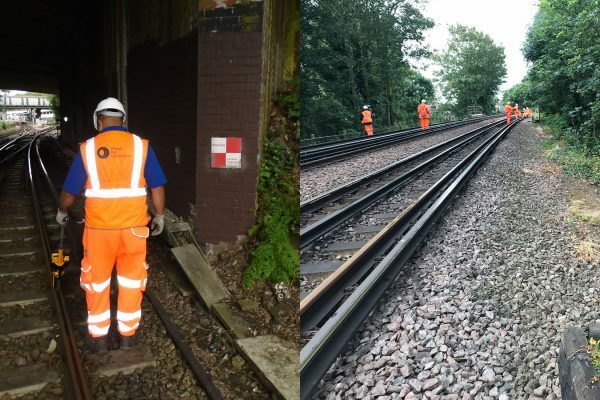 Global Rail Construction Ltd had another busy and successful weekend on their Feltham Resignalling Works (Week 42), completing and handing over another 6 signal structures. 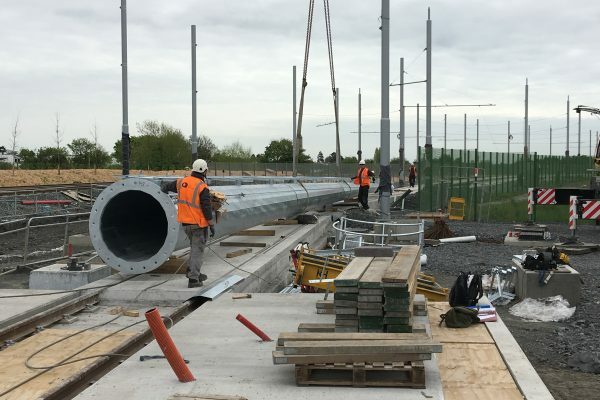 Having previously designed and installed the piled foundations, the company successfully installed 3 of the signal structures – including 1 gantry type – and undertook works to 3 other signal structures too. The team also installed ductwork at Norbiton Station, delivered materials to the PSP site and the Loc area at Norbiton, delivered troughing route materials between Hampton Wick and Shaklegate and installed ballast boarding and troughing route at a number of other locations. UK Rail infrastructure contractor and Principal Licence Holder, Global Rail Construction Ltd, are delivering the full GRIP 5-8 design and construct contract directly for Network Rail. The scope of work covers civil and structural engineering works on Network Rail’s Wessex Route and specifically covers: Area 1a – Shepperton Branch; Area 1b – Norbiton Sub Station to Fulwell Jct and Area 2 – Barnes to Whitton Jct, Hounslow Sub Station. The Feltham resignalling project forms part of the signalling renewals/National Operating Strategy (NOS) scheme, which is intending to renew the life-expired signalling infrastructure in Feltham and Wokingham areas to the modern equivalent form. The total scheme covers the renewal of 538 Signalling Equivalent Units (SEUs). The full geographical workscope, which covers over 80 miles of railway lines also included, for the first time, the introduction of Atkins’ brand-new signalling system – Elix. 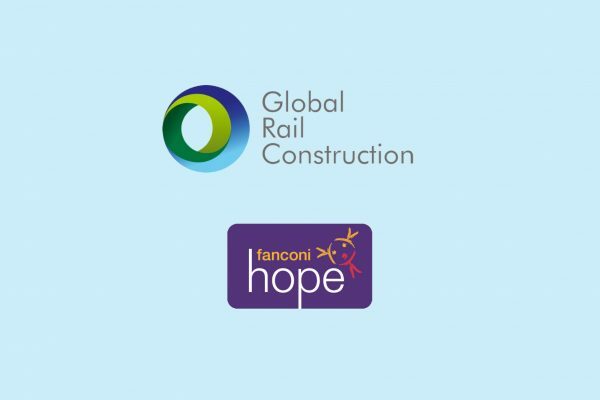 Global Rail Construction Ltd (GRCL) is part of the Global Infrastructure Group and is a leading UK provider of design and build services to clients in the rail and transportation sector. The company is a principal contractor for UK mainline and metro railways across a number of disciplines, which include signalling, mechanical, electrical and power (MEP), telecoms, civil and structural engineering, maintenance, renewal, providing a fully tested and commissioned service, on both Network Rail and Transport for London controlled infrastructure. You can read more about what GRCL does by clicking here. 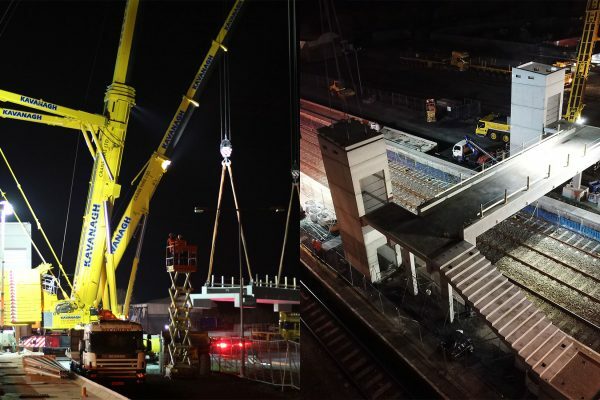 Global Rail Construction Ltd (GRCL) has been working in the lead up to Christmas, together with their customer Alstom and asset owner Network Rail, to complete a critical design and delivery milestone on the Paddington to Reading Project. The works are part of GRCL’s design and construct package of Civil Engineering and E&P works, form part of the wider Paddington to Reading Signalling works which are linked to HS2, who will be constructing an interchange station in the existing Old Oak Common (OOC) depot area, which has necessitated the need for these railway asset relocation works, to create the space required to construct and service the HS2 interchange station. 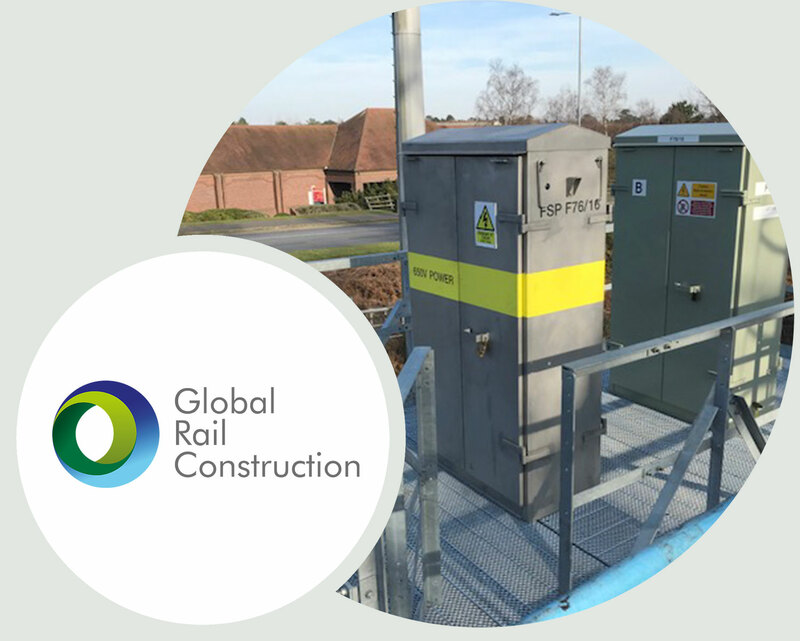 During the build-up to the Christmas commissioning, Global Rail Construction designed and installed 6No location case bases, replaced an existing Functional Supply Point (FSP) – including all necessary earthing and bonding works – and installed 5No signal bases and structures. The site was fully energised as planned on 23rd December 2018. “We are delighted that our team, working alongside long-term partner Alstom, has successfully completed this important project milestone. After a very busy period of testing and commissioning, Global Rail Construction Ltd (GRCL) has fully installed and energised 42 new Functional Supply Points (FSP’s) over a 13-mile stretch of the Felixstowe to Ipswich Branch line, including the supply and installation of a new Principal Supply Point (PSP) at Westerfield. 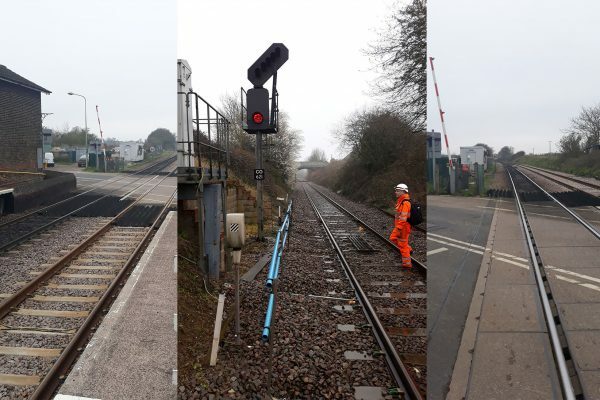 Works were carried out successfully and handed over to our customer Volker Fitzpatrick on time, at the start of the Christmas blockade, enabling them to bring into use new, improved signalling equipment. 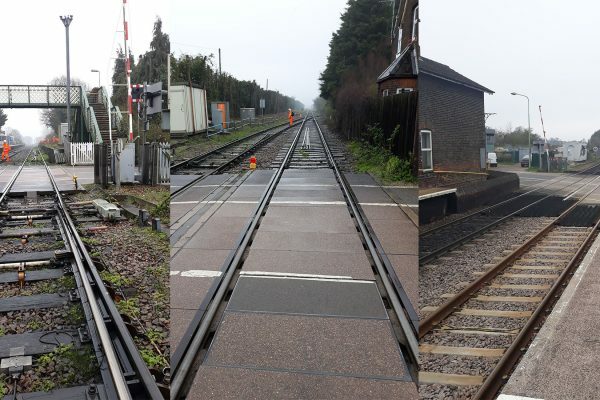 These works form part of GRCL’s significant package of Mechanical, Electrical and Power (MEP) works between Westerfield and Felixstowe on Network Rail’s Anglia Route. The Project is for Volker Fitzpatrick (VFL) as part of their ARC (Anglia Regional Collaboration) framework for CP5, which involves the double tracking of sections of Permanent Way – over approximately 20 Kilometres between North Ipswich and Felixstowe – to increase capacity for the main freight route from the Port of Felixstowe. There are also further railway systems works, including the upgrade of signalling and also significant ground engineering works to improve the line stability. Led by Operations Director Sean Donaghey, GRCL is delivering the full rail E&P 650v signalling power scope, which includes the new PSP at Westerfield, upgrade and modifications to other existing PSPs, the installation of 42No Functional Supply Points (FSP) and installation of 45km of new cabling. 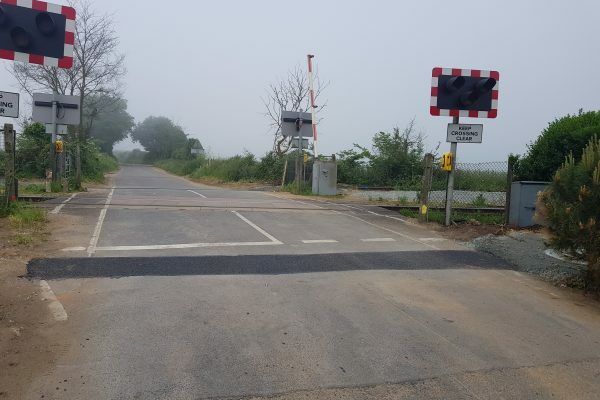 The works also covers the installation of direct power and lineside power supplies for a number of level crossings, as well as new level crossing lighting. Further works include the installation of 3No. PHCC (Points Heating Cubicles) to supply and install, points heating supplies, transformers and heating strips for point ends. 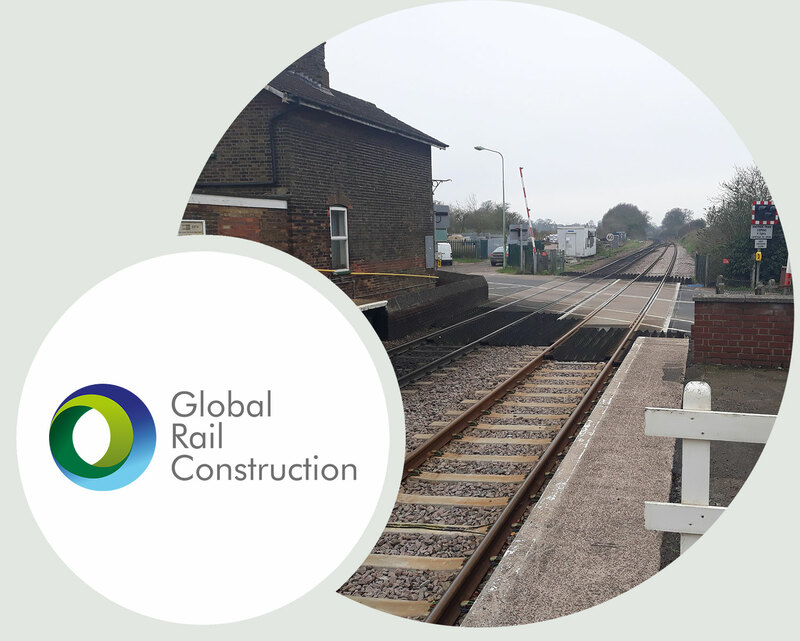 As part of the same Felixstowe Branch Capacity Enhancement Project, Global Rail Construction Limited (GRCL) is also delivering ancillary rail civil engineering works. “Delighted with the efforts and contributions of our team during the festive period. This energisation was a result of a concerted team effort, working in complete harmony with our customer VFL. 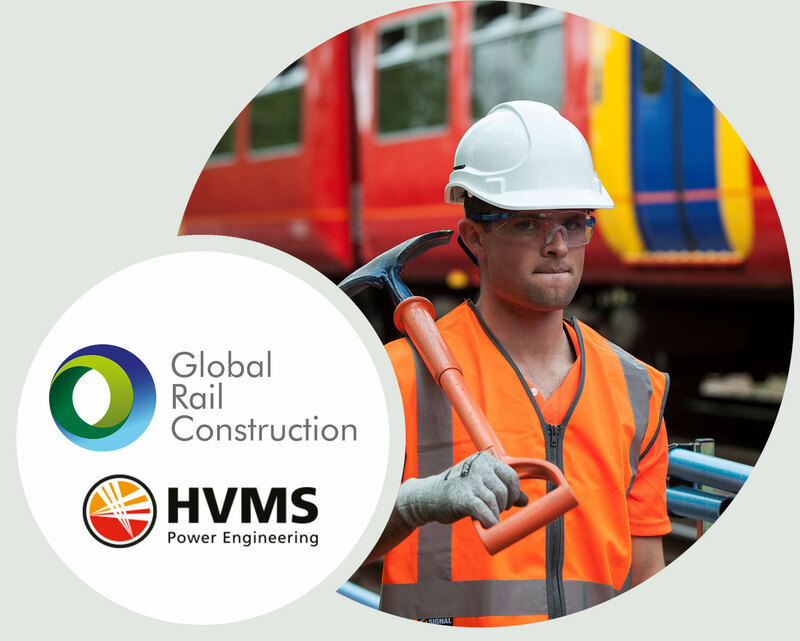 Mechanical, Electrical and Power services provided by Global Rail Construction are constantly upgraded through training and development and are consistently delivered to the highest specification. Design and Project Management of these specialist services are deployed on projects such as sub-station refurbishment and new build, station refurbishment and new build, signalling equipment room fit-outs, station platforms and car park lighting. The company provides electrical condition reports and undertakes the installation and testing of lineside feeder cabling, fire detection systems, CCTV/access/security systems, building management control systems, HVAC and cable installation and management including lighting control systems. 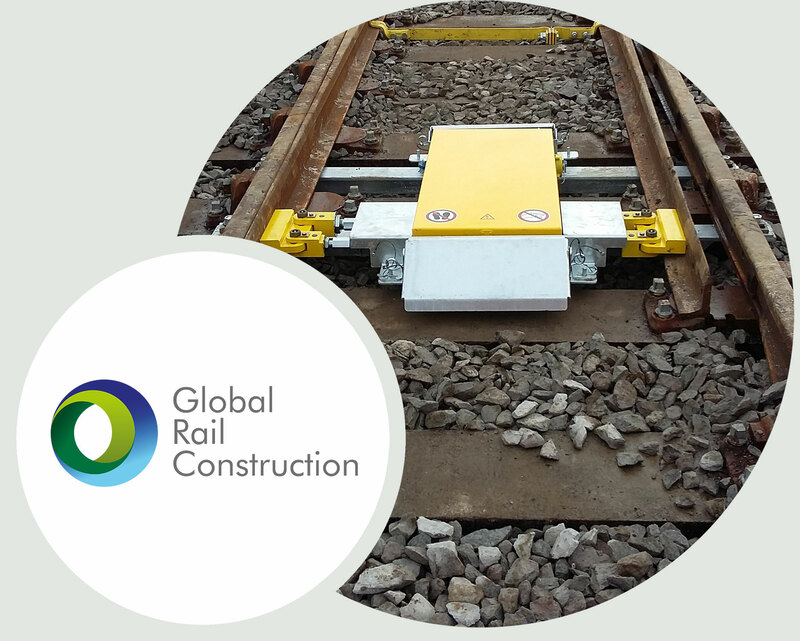 Global Rail Construction Ltd’s (GRCL) teams have successfully installed 3No UTX’s as part of the Christmas blockade at Potteric Carr in Doncaster. The first UTX was a 4-way 2 track UTX, the second a 4-way 1 track and the last a 12-way 2 track UTX. GRCL’s specific works here formed part of the overall package for the substation build. The works were carried out over 3 shifts starting on Christmas day night through to Boxing day night. Significant and in-depth planning and preparation for these works were required and undertaken by GRCL’s team, which helped the teams to complete all the works ahead of programme but more importantly the works were completed safely. The contract forms part of Network Rail’s strengthening of the 25kV traction power supply to the East Coast Main Line (ECML) to support the delivery of Hitachi’s new Intercity Express Programme (IEP) Depot at Doncaster in South Yorkshire. “A big thanks to our Northern teams for the thoroughly professional works you are delivering. These UTX installations were an important part of these works and we were delighted to see that all the detailed planning and preparatory works that were undertaken in advance with both our client and other project stakeholders enabled this achievement. Thank you for all your efforts during the Christmas period, it really was appreciated. 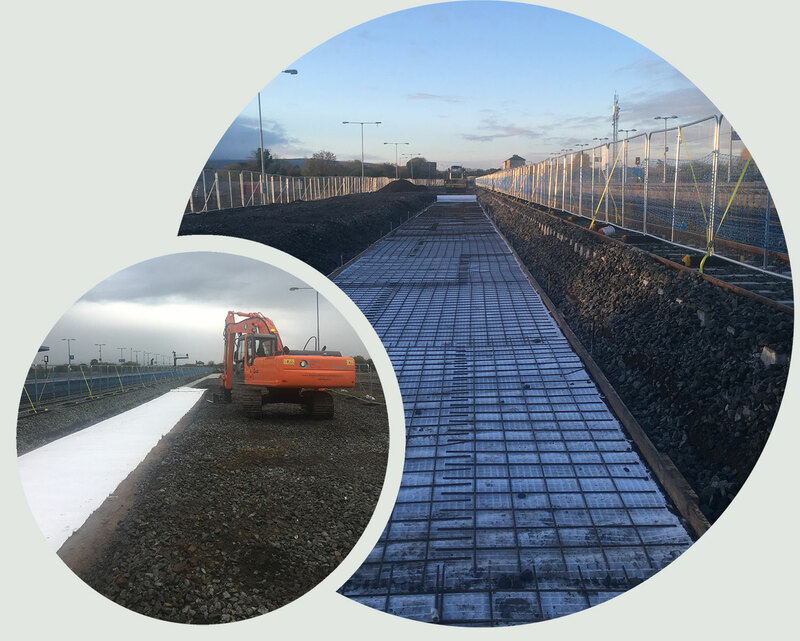 Global Rail Services has commenced works on a new €2.5m project at Limerick Junction on behalf of Irish Rail. The rail project involves construction of a new 260m precast concrete platform, the production, delivery and installation of a new 20m long Precast Concrete footbridge, stairs and lift shafts on piled foundations including all associated structural steelwork and all associated electrical and station/platform infrastructure at Limerick Junction Station. These important works will provide time savings for Down trains scheduled to stop at Limerick Junction of 4.8 minutes, which affect 13 Cork trains/day and typically and one direct Tralee train. There will also be an average time saving of 11 minutes for all Limerick passengers connecting to and from Cork services at Limerick Junction. Works will be completed both between trains and during railway possessions and are due to continue until June 2019. Global Rail Services have already set up a safe working compound and delineated the site from the railway corridor in order to commence works. Piling and Foundation works are nearing completion on both platforms. The delivery and installation of the new PCC Platform units will commence at the end of January. The new down platform will remove constraints and speed restrictions associated with the current single platform, which caters for Dublin to Cork/Kerry services in both directions. Global Rail Services offer rail infrastructure contracting services on a design and construct basis. Led by experienced professionals with in depth knowledge of these sectors and supported by skilled and dedicated in house teams, they offer a fully integrated solution, allowing us to provide clients with a unique turnkey offering that is value adding. This inclusive approach allows customers to benefit from expertise in a number of rail sectors and ensures they receive the most appropriate advice and solution for their schemes. 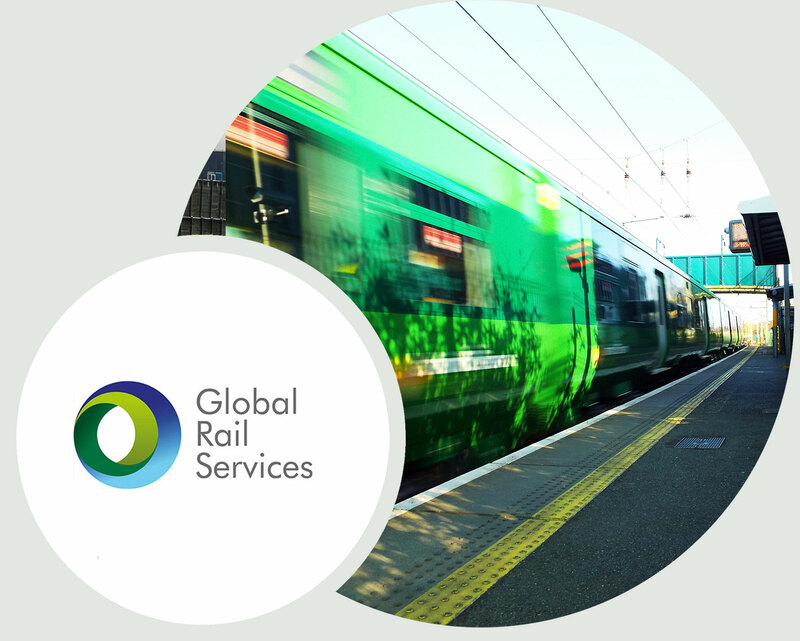 With a skilled, multi-disciplinary workforce providing a broad range of services and operating in tandem with a highly experienced management team, Global Rail Services is geared to meet our clients exacting demands. Bespoke solutions for individual client requirements are central to Global Rail Services offering which can deliver a fully planned and managed design and construct service, which includes materials procurement and logistics management. As part of the Felixstowe Branch Capacity Enhancement Project, Global Rail Construction Limited (GRCL) has been selected to deliver further ancillary rail civil engineering works on behalf of Principal Contractor, Volker Fitzpatrick. These works follow on from GRCL’s award of E&P works for the same project. The works will be undertaken during a combination of 36 hour continuous possessions and midweek working and will last for a total of 23 weeks. These works have been secured off the back of previously successful works in Week 6, in respect of the installation of under track crossings and a combined under road crossing with a under track crossing and more recently the delivery of 3No under road crossings, 2No under road crossings at Levington Level Crossing and 1No under road crossing at Morston Hall Crossing. The planning of the works so far has been particularly intense, however, the GRCL team has managed to provide a robust delivery plan to meet and exceed the clients expectations. The works completion date is 22nd March 2019. 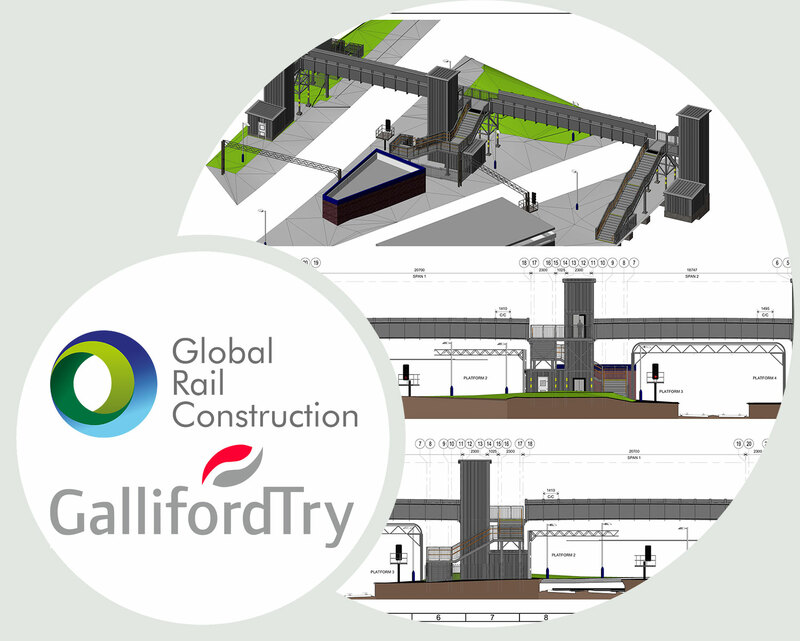 We are pleased to announce the award of a Railway Civil Engineering Works Contract at Kidsgrove Station, Staffordshire, on behalf of Galliford Try. Global Rail Construction Limited (GRCL) will manage, install, test and commission the full scope of their civil engineering works package. 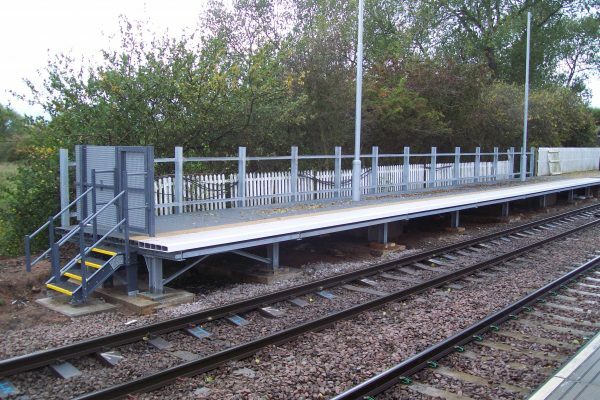 The Access for All (AfA) project was awarded funding under the DFT “Access for All programme” and is managed by Network Rail, with the aim of improving accessibility at railway stations. The full project scope will see the removal of the existing footbridge and a brand-new one installed with lifts, improving accessibility for all customers who use the station for connections to Derby, Stoke and Crewe, including those with reduced mobility, children, heavy luggage or shopping. Following feasibility, optioneering and scheme design development, the various stakeholder signatures for the ‘Approval in Principle’ (AIP) designs have been achieved for Civils, OLE, Telecoms and M&E. It is now required that these designs be progressed through the detailed design, construction, commissioning and handover of the project (GRIP stages 5 – 8). GRCL’s works programme has a mobilisation date of October 2018, with a proposed completion date of May 2019. This ties in with the aims of an overall project completion during the summer of 2019. 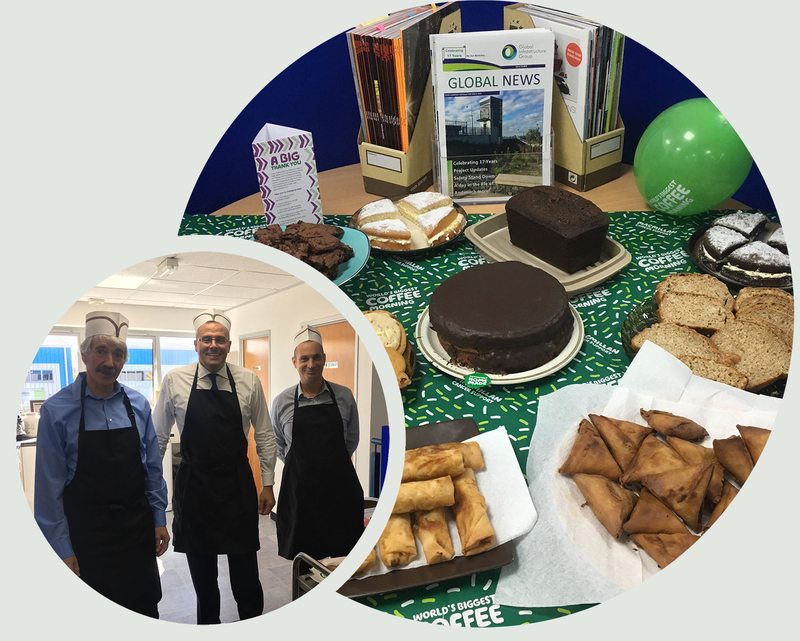 Global Rail Construction Limited has been raising money for charity this week, by holding a Coffee Morning in aid of Macmillan Cancer Support. 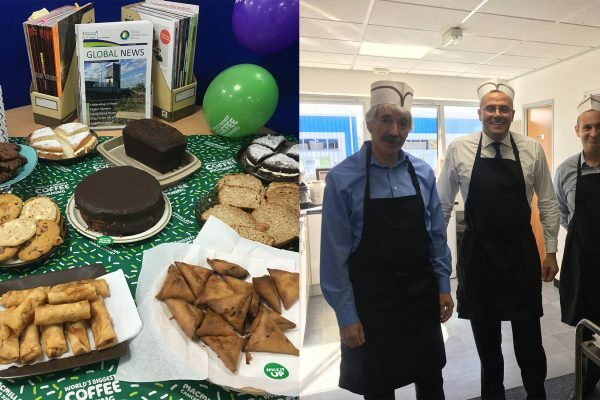 The Coffee Morning was held at both our Head Office and our Regional Office in Derby – with both teams having been busy baking a delightful range of sumptuous cakes and pastries – we simply could not stop eating them! Marco, Sean and Don (pictured) were the Hatfield Barista’s, helping us to raise to date around £200.00! Whilst the team at Global love any excuse to both bake and eat cakes and pastries, we are always looking to do our bit when we can. Coffee Morning is a fabulous way to bring our teams together for a fantastic cause and is so much more than just getting together for a cup of coffee. Last year was a record-breaking year for Coffee Morning with circa 250,000 people taking part, raising around £30 million, helping to aid the supporters, professionals, volunteers, campaigners and people affected by cancer. With the expansion of the rail industry in Australia, one of our biggest safety risks isn’t necessarily something you can see out on the track or the construction site. Fatigue is one of the major risk factors across the transport and construction industries today. It’s a leading cause of workplace accidents and has contributed to up to 30% of deaths on our roads. Fatigue is more than feeling tired and drowsy, it is a state of mental and/or physical exhaustion that reduces a person’s ability to perform work safely and effectively. In light of this, the team at Global Rail Australia has been working in collaboration with one of its key clients Metro Trains Melbourne (MTM), as part of their Fatigue Risk Management Working Group, to help put together some awareness videos on managing Fatigue in the workplace. Three videos have been developed which are aimed at Frontline staff, Site Management and company Executives, to show how this issue affects personnel at all levels, and also examine how fatigue is impacting our industry and what we need to do to stay on top of it. 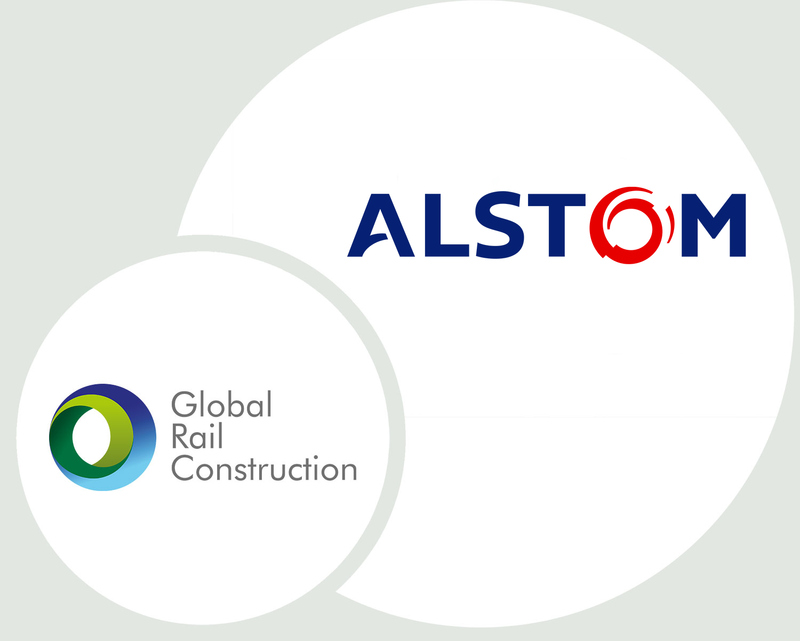 Global Rail Construction Limited (GRCL), is delighted to announce the award of a design and construct package of Civil Engineering and E&P works on behalf of their client Alstom. The works form part of the Paddington to Reading Signalling works which are linked to HS2 – the planned new high speed rail link connecting London to the Midlands, North East and North West. As part of these major infrastructure works, HS2 will be constructing an interchange station in the existing Old Oak Common (OOC) depot area. The proposed site for the interchange station is currently occupied by both Great Western Railway (GWR) and Heathrow Express (HEX) Train Care Depots. Both these depots will need to be decommissioned to create the space required to construct and service the HS2 interchange station. The decommissioning works are planned to be delivered in four stages, to facilitate a phased withdrawal of GWR and HEX operations from the OOC site. The relocation of Location suite R2/172 and recovery of R2/157, are required in order to facilitate the clearance for HS2 Stage 2 and in support of the decommissioning works and these works have been contracted to Alstom under a variation to the overall Crossrail Surface Signalling Crossrail West Christmas 2017 Signalling Interlocking Works. The Wycombe Line (Greenford), is also subject to clearance of Signalling and Power, in support of the HS2 decommissioning works and due to the severance of the running line from London, remedial Signalling alterations are required. The West Ealing works consists of remedial Signalling alterations and to provide automation to the signalling and control system for both inbound and outbound train movements, in addition to the provision of a Depot Protection System (DPS) to protect GWR staff from movements within the confines of and at the interface to, the sidings. Global Rail Construction’s scope for civil engineering includes the full survey including topographical and ground investigation, and then the subsequent design and build of five location suites and one FSP suite, including all necessary trough route modifications. The civils scope also includes new signal bases and also signal head modification works including bracketry. 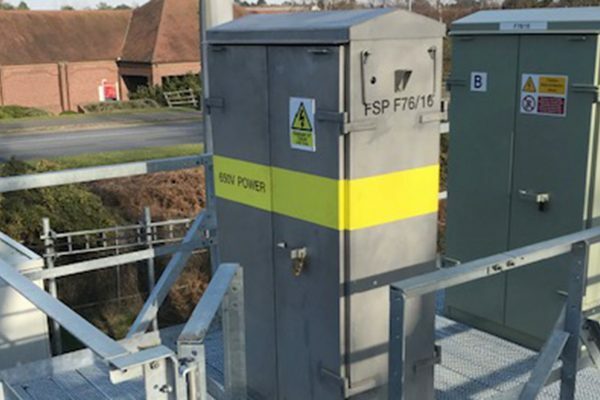 The scope for E&P is also provides for a full D&C solution from Global’s team and includes surveys and then the design and installation of the amended 650v signalling power supply, including connection to the existing return screen conductor. Additional complexities around interim power arrangements will have to be considered by the team including the replication of the necessary signalling loads. GRCL will define the signalling functional power circuit requirements and provide the proposed functional loads as part of their design work. The D&C scope also covers FSP recoveries and staged and final Feeder configuration and with all construction and installation work needing to be completed before the final FSP connections in advance of the signalling possession works to mitigate the signalling and operational railway disruption, it is no surprise that these works have now commenced. GRCL’s works are due to be completed in February 2019. Sean’s poignant words can be read below, which is why he has chosen to support this fantastic charity. 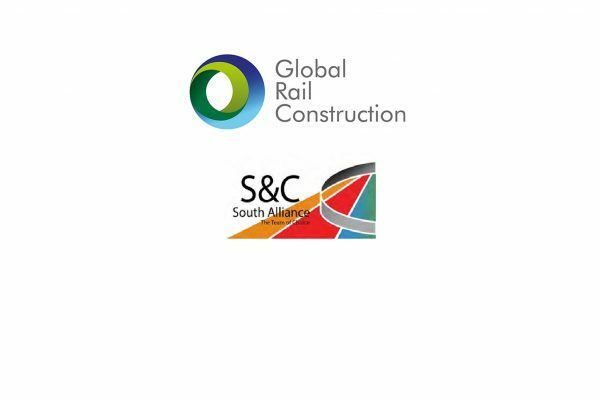 Global Rail Construction Limited (GRCL) has recently been awarded a package of design works on behalf of South East Multi-Functional Framework Contractor, BAM Nuttall. The contract includes the production of GRIP 4 and 5 designs for a cable management system, to provide a continuous and secure CRMS to support Power/Signal cables (Primary) and fibre optic cable (Diverse) between Gunnersbury Junction and Richmond Station on ELR SAR2. The wider contract also includes further cable management on ELR SAR1, heading towards Action Wells, and on the ELR ATG towards Turnham Green. Intensive site surveys have already commenced (during Week 12), to determine the route from Richmond towards Gunnersbury (ELR: SAR2) via Kew Garden. This includes the additional route from Gunnersbury towards Acton Well (ELR: SAR1) and Turnham Green (ELR: ATG). GRCL will produce feasibility reports including surveys of the existing route and option analysis which will be produced and submitted to BAM Nuttall for approval. Alternative solutions for those areas where the aspirations cannot be met. If there is an existing UTX with sufficient capacity to allow the traversing of the primary and diverse routes. If there is an existing URX with sufficient capacity to allow the diverse routes to pass below the RRAP. GRCL’s involvement is part of the wider Four Lines Modernisation (4LM) Project. Which will see the replacement of all the signalling equipment on all Circle, District, Hammersmith & City and Metropolitan lines, all of which will be monitored from a new control centre currently under construction in Hammersmith replacing the numerous signal cabins and service control centres across the four lines. The new signalling system uses a moving block system otherwise known as Communications Based Train Control (CBTC) which uses Wi-Fi to constantly let controllers know where trains are and how fast they are going. Precise speeds will be set by computers so trains will be able to run at higher speeds and closer together. This will provide Central London with a maximum service frequency of 32 trains per hour (every 2 minutes) by the time the upgrade is complete in 2023. We have successfully completed our transition audit to ISO 9001:2015 of our quality management system. The auditors recognised the work we do as a company, our quality programmes and acknowledged it was unusual not to receive any NC’s or OFI’s. This success is clearly attributed to all of us at GRCL. Thank you for your continued support of our management systems and a special thanks to those of you who were directly involved in the 3-day audit. As part of the Felixstowe Branch Capacity Enhancement Project, Global Rail Construction Limited (GRCL) has been selected to deliver civil engineering works on behalf of Principal Contractor, Volker Fitzpatrick. The work scope included the installation of under track crossings and a combined under road crossing with a under track crossing. The planning of the works was particularly intense, however, the team managed to provide a robust plan in time for works to commence. 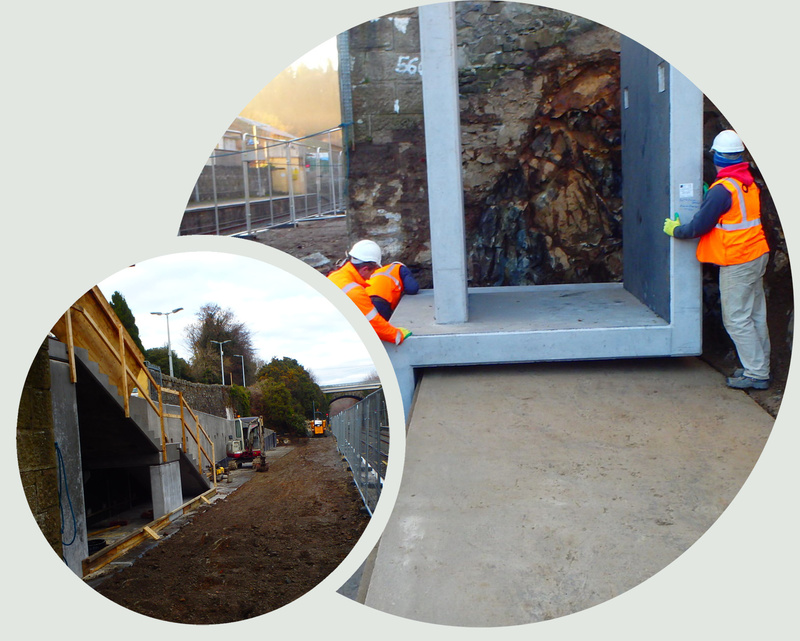 Works commenced during Week 6, where GRCL managed to deliver the under road crossing safely and on programme. 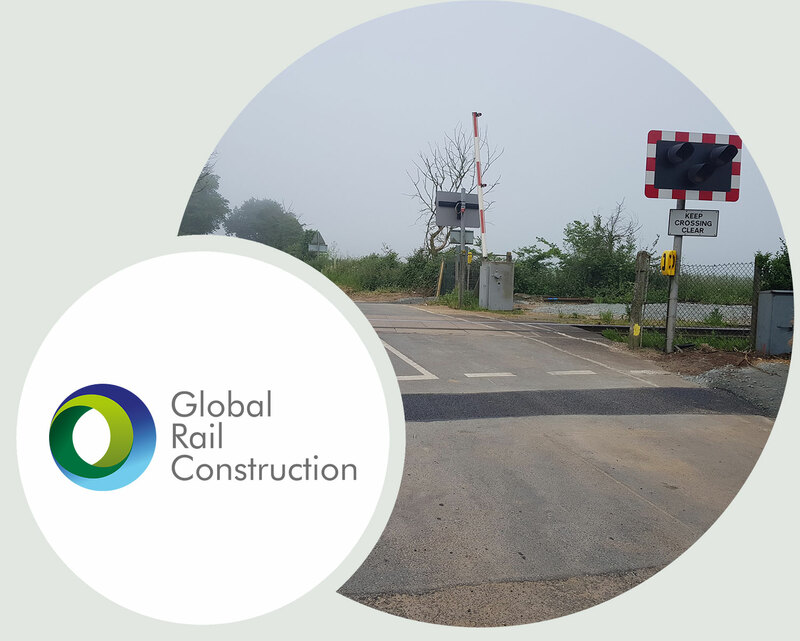 This weekend just gone, GRCL had to deliver another complex project, whereby the team were contracted to deliver 3 under road crossings, 2 under road crossings at Levington Level Crossing and 1 under road crossing at Morston Hall Crossing. Again our team has delivered the works safely and so far our client has been very impressed with the works achieved. Works continue, with an overall project completion date of 22nd March 2019. 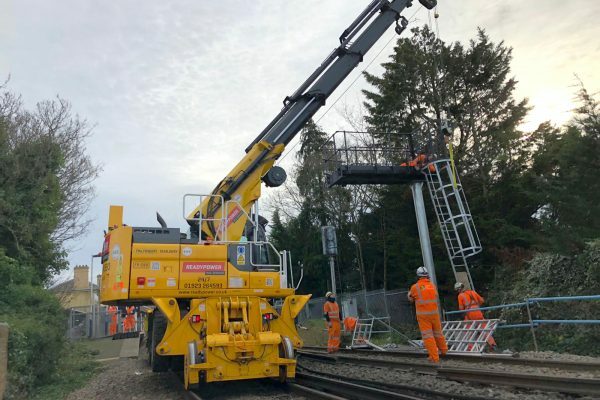 Global Rail Construction Limited (GRCL) is proud to announce an important success for its Mechanical, Electrical and Power (MEP) Division, having secured a significant package of Electrification and Power (E&P) works between Westerfield and Felixstowe on Network Rail’s Anglia Route. The project is for Volker Fitzpatrick (VFL) as part of their ARC (Anglia Regional Collaboration) framework for CP5, which involves the double tracking of sections of Permanent Way – over approximately 20 Kilometres between North Ipswich and Felixstowe – to increase capacity for the main freight route from the Port of Felixstowe. There are also further railway systems works, including the upgrade of signalling and also significant ground engineering works to improve the line stability. Led by Operations Director Sean Donaghey, GRCL provided a most compelling offering and was selected as the E&P partner of choice by VFL to deliver the full signalling power scope to include a new Principal Supply Point (PSP) at Westerfield, upgrade and modifications to the existing PSP, the installation of 42No Functional Supply Points (FSP) and installation of 45km of new cabling. 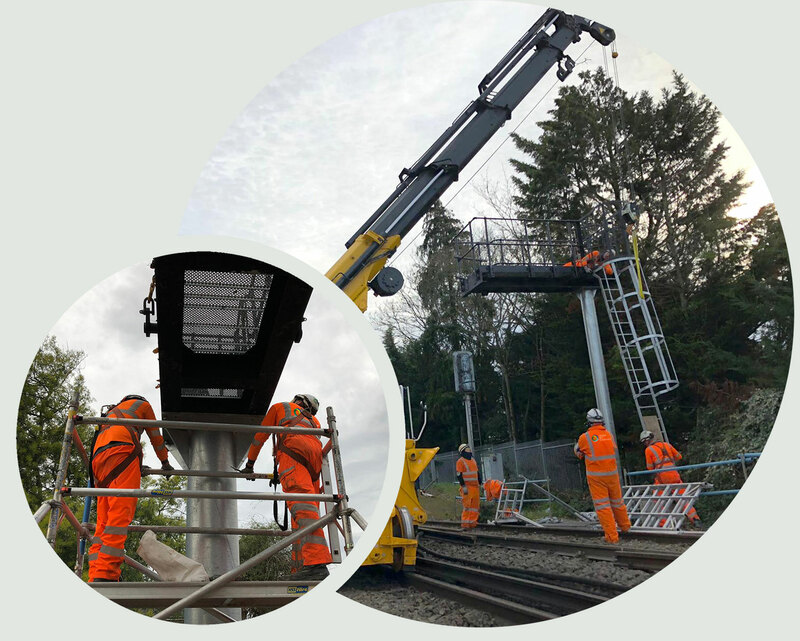 The scope also covers the installation of direct power and lineside power supplies for a number of level crossings, as well as new level crossing lighting. Further works include the installation of 2No Points Heating Cubicles (PHCC), points heating supplies, transformers and heating strips for point ends. GRCL are working towards a target of completion and commissioning of the two PSP’s along with the new diverse 650v signalling power by Christmas 2018, which will allow resignalling commissioning. All points heating works are to be completed out of points heating season between April and September. 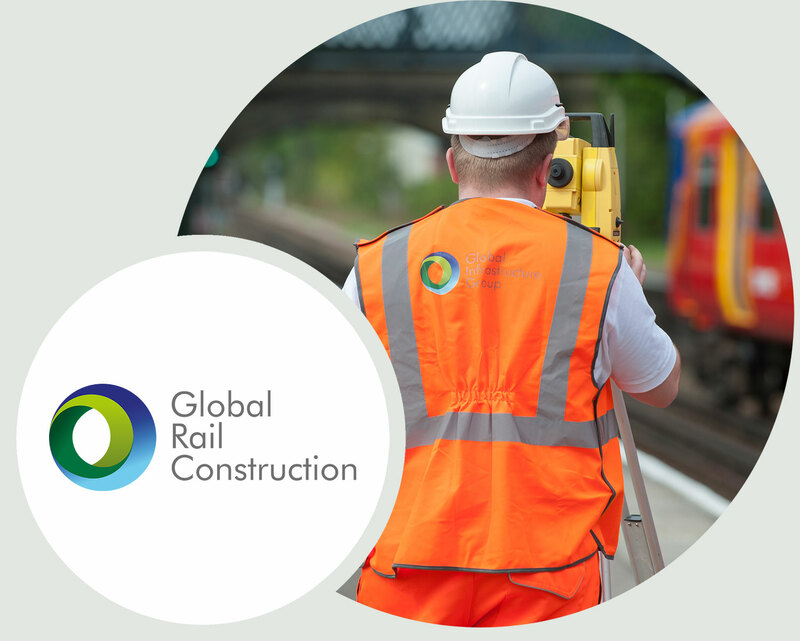 Mechanical and Electrical services provided by Global Rail Construction are constantly upgraded through training and development and are consistently delivered to the highest specification. Design and project management of these specialist services are deployed on projects such as sub-station refurbishment and new build, station refurbishment and new build, signalling equipment room fit-outs, station platforms and car park lighting. 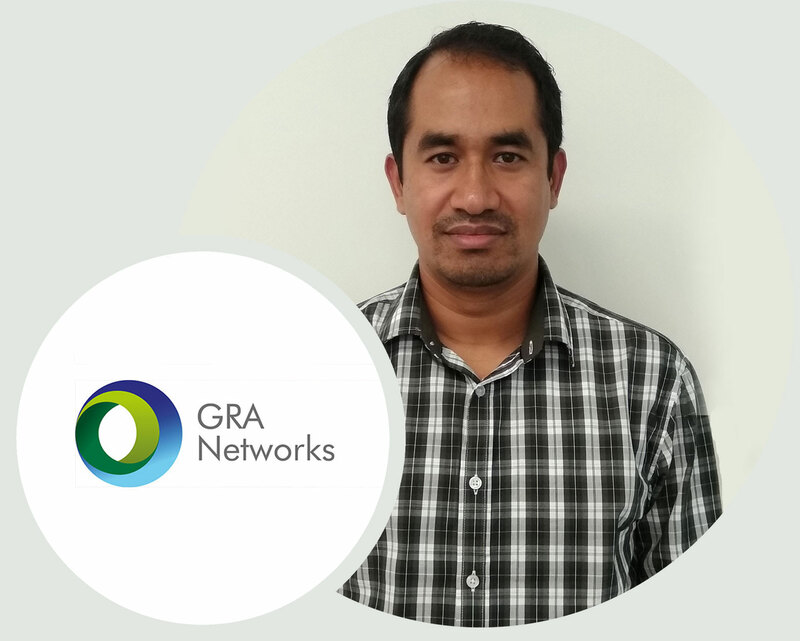 As part of GRA Networks continued growth and expansion, Sachendra Shrestha has recently joined our New South Wales (NSW) division and will manage our Telecommunications Operations in the state. 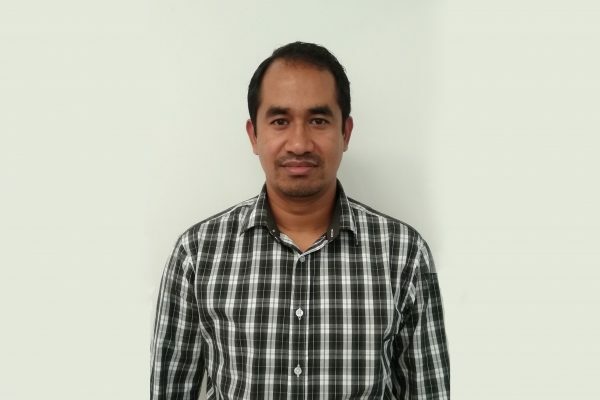 Sachendra is a very experienced Telecommunications Professional with nearly 15 years industry experience, having worked on a range of projects overseas and locally. He has a Master’s degree in Electrical Engineering in addition to a Bachelor’s degree in Electrical and Electronics Telecommunications. We would like to take this opportunity to welcome Sachendra and wish him every success. Global Rail Australia is pleased to announce two recent contract wins which form part of a much larger program being undertaken by the Level Crossing Removal Authority (LXRA), involving the removal of over 50 level crossings in Melbourne. The Northern Eastern Project Alliance is being completed by Laing O’Rourke/Fulton Hogan and MTM. Global Rail Australia has been engaged by this Alliance to work on the sub-station upgrade at Fairfield. Global Rail Australia’s scope of work involves the demolition works, combined service route installation and the construction of the substation substructure. The works are currently under way and are due for completion by the end of April. Global Rail Australia is delighted to be involved in this prestigious project. The Western Program Alliance is being undertaken by John Holland and MTM. 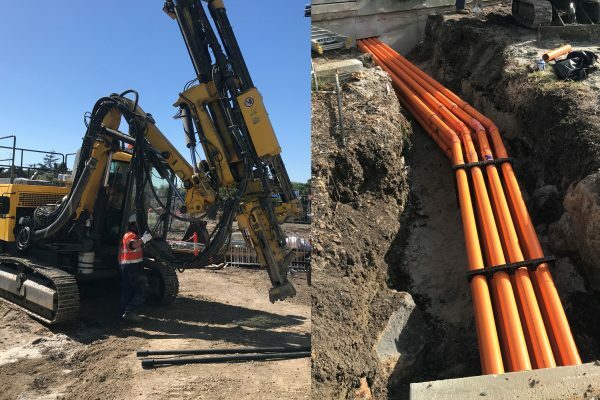 Global Rail Australia has recently commenced its work on the Combined Service Route (CSR) and Service Duct installation package as part of the works to facilitate the removal of the level crossing at Skye Road. 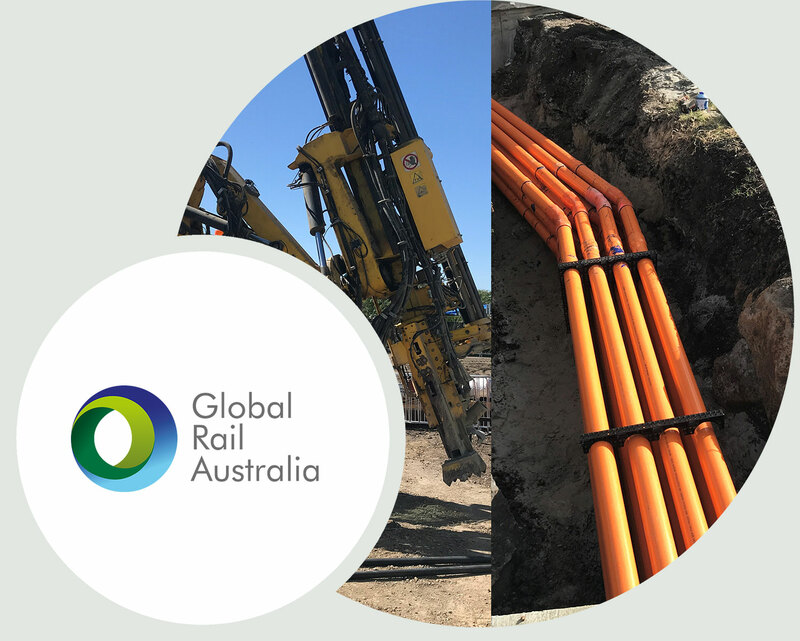 Global Rail Australia’s scope of work involves the excavation of nearly 800m of trenching and the installation of service ducts and pits. The purpose of the Level Crossing Removal Project is to remove some of Victoria’s most dangerous and congested level crossings for safety purposes. Global Rail Construction’s Head of Resourcing Mick Walsh, will be supporting The Hundred Days Offensive between 10th – 14th October 2018, to commemorate the Centenary of the First World War, whilst helping to support the soldiers and veterans of today. He will be taking part in the Frontline Walk – a 100km trek across the battlefields of WWI, which will be a physically and emotionally tough challenge, as he follows in the footsteps of those who fought so bravely 100 years ago. In his research of the event, it led Mick on a personal discovery to locate the details of his Great Grandfather, Edward Bentley, who bravely fought and succumbed on 9th July 2016, which makes this event even more poignant for Mick and his family. Supporting good causes is part Mick’s DNA. His great work over the years has raised funds for a number of charities, from hosting the home coming ball for the Royal Marines to supporting the ex-Forces back into work. Mick will be doing it all for ABF The Soldiers’ Charity, the National Charity of the British Army, who support soldiers, veterans and their families when they need it most. 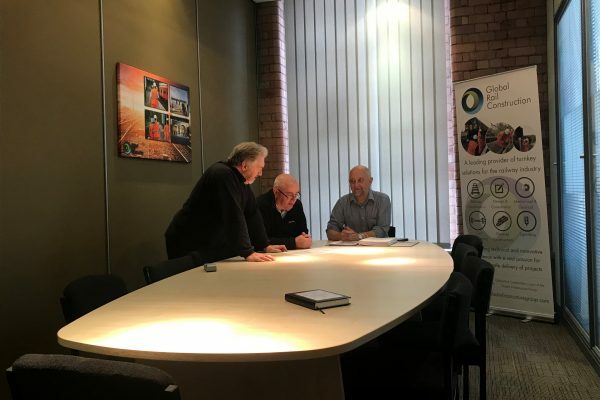 Global Rail Construction Limited (GRCL) has opened an office in Derby to facilitate a new core business offering around the supply of labour, which has been featured in RailStaff Magazine. The new strategically placed office will be used to meet external client demands for labour including safety critical personnel, as well as supporting GRCL’s own current and future rail projects in the Midlands and North of the UK. The company has assembled an experienced and committed management team to run this new labour division, whose industry reputation in the rail sector precedes them. 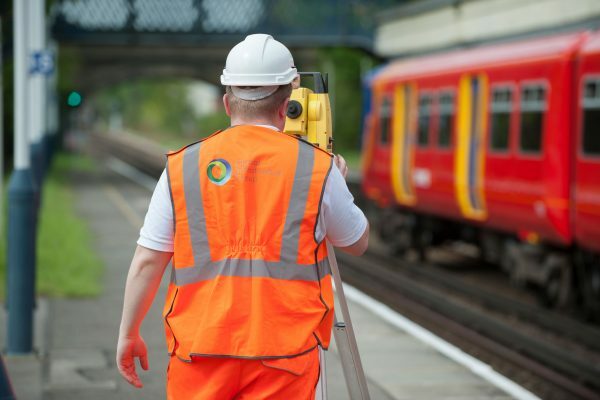 As a safe and trusted partner for clients working on some of the UK’s biggest rail infrastructure projects, GRCL know it is not just about providing people with the right skills, it is also about providing people with the right approach. The company is fully committed to the rigorous requirements of the rail industry. As an employer, GRCL continuously ensures the health, safety and wellbeing of all its workers and always verify their competencies. The company has an outstanding reputation for staff retention, underpinned by the quality and diversity of its resource and its commitment to world-class training and development of its staff. GRCL’s new office in Derby is a signal of its growth and success across its rail infrastructure sectors of operation, which encompass civil, structural engineering and building, E&P and signalling works – as well as this new exciting labour supply arm. The company has a great track record of achievements across the country and is no stranger to the Midlands area, by virtue of its significant contribution to the East Notts Resignalling project. 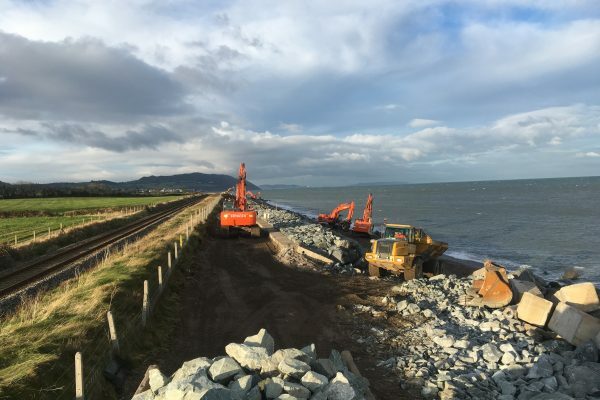 Global Rail Services has secured a further contract success with its latest contract award comprising Coastal Defence works for Iarnród Éireann (Irish Rail). 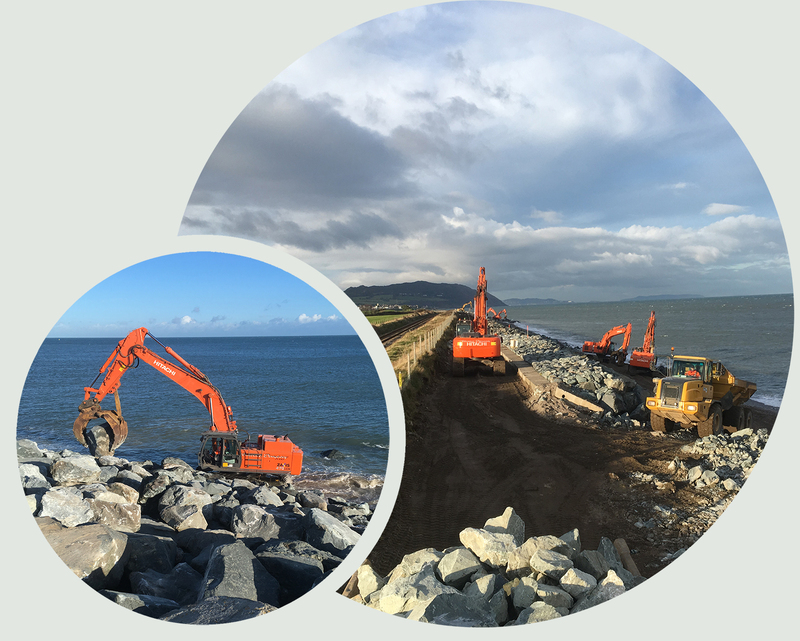 The overall objective of the project is to reinstate coastal protection elements adjacent to the Dublin ‐ Rosslare Railway Line by February 2018. This involves removing and replacing the rock armour and reinstating/replacing the geotextile underlay along with any granular sub-layers. 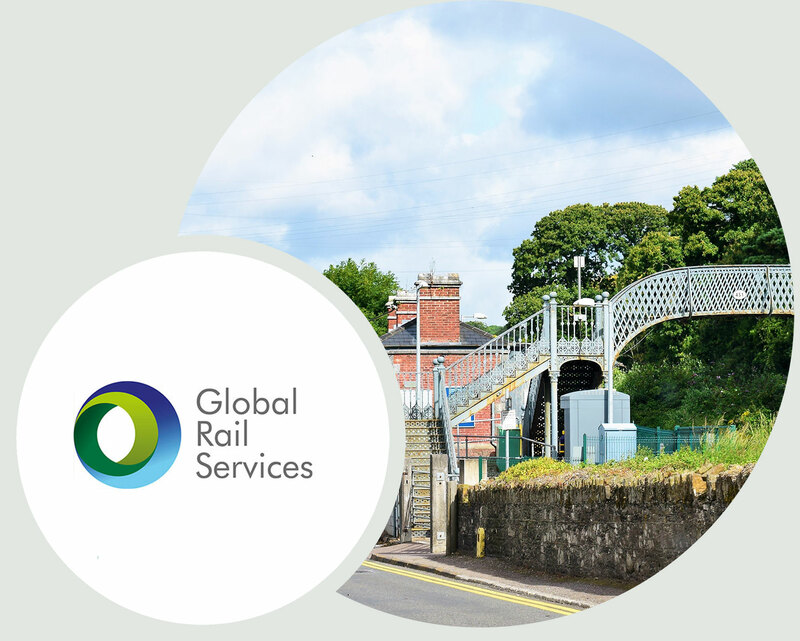 Global Rail Services experienced railway site teams – led by Project Manager Eoin Shortt – will set up work sites, pedestrian and traffic management as required, whilst collaborating with operational staff from both Irish Rail and Wicklow County Council. The company will deploy two fully kitted crews, consisting of 2nr 50t track machines, 1nr 35t machine, alongside 1nr moxy. The teams will work simultaneously in order to intensify the project to meet the fast-track completion date. There will also be another available moxy floating between both crews, which will be used as conditions dictate. In addition, a 25t track machine will be at the access point, which will load all moxy’s – servicing both crews as required. “This is testimony to the Irish team for their continued hard work, skill and endeavour. This is the fourth contract success in a matter of weeks. Not only are we winning work at a rate of knots, we are also competently delivering them. The total construction period will be approximately 16 weeks for these works. 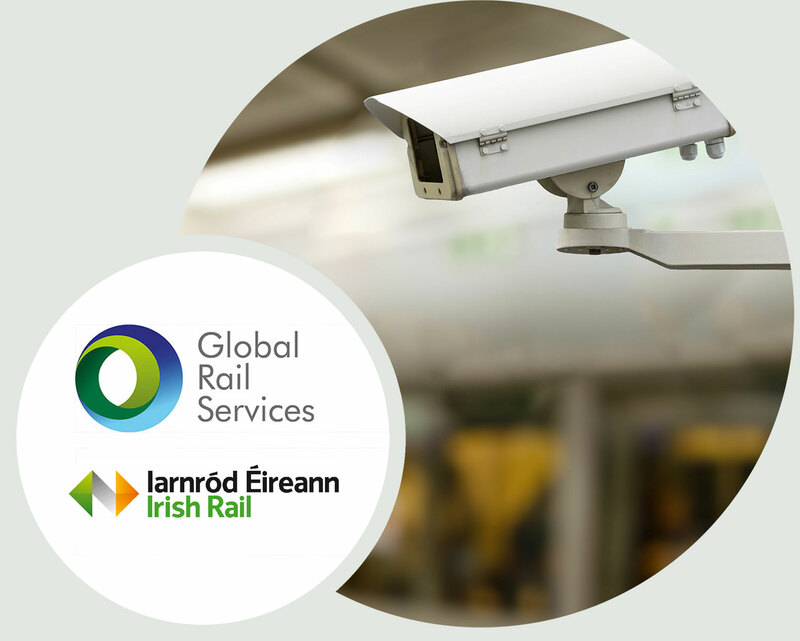 Global Rail Services has been awarded a new contract with Irish Rail for the provision of CCTV for Permanent Way (Per Way) Compounds at Dundrum, Limerick and Nenagh. 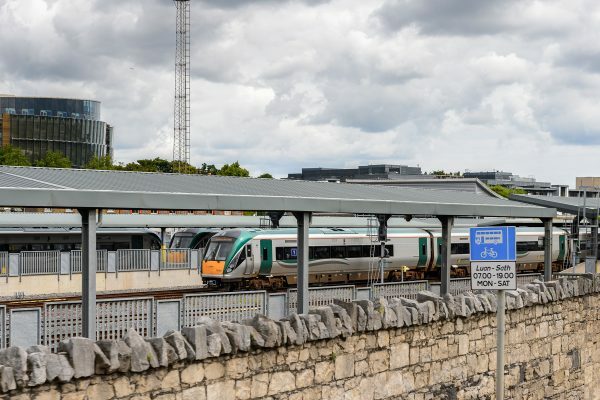 Irish Rail has sought to improve security at its facilities, due to an increase in vandalism and break-ins over the past number of months in Per Way Compounds in the Tipperary region. 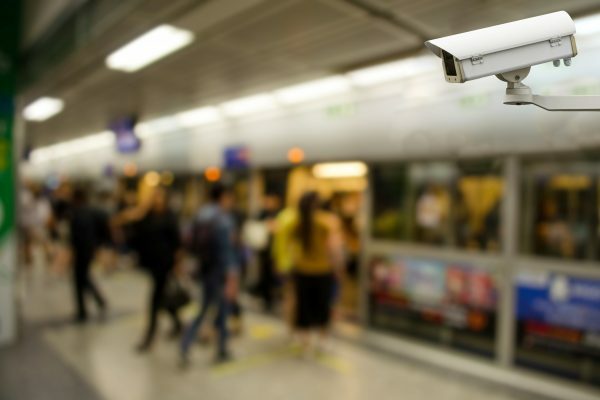 In order to do this, Irish Rail has engaged with M&E expert – Global Rail Services – and specified a new IP CCTV installation at the three Per Way Compounds mentioned above. The CCTV works will involve the installation of new ducting, the installation of new 8m hinged poles and the installation of POE fixed cameras and anti vandal dome cameras. At each location all cameras are to be cabled back to a new DVR located in a new 15U comms cabinet, which will be installed in the Per Way stores container or office. All cameras are to be cabled in Cat5e. Power for the comms cabinets is to be cabled using 3 x 4 sq. NYMJ or SWA and to be fed from an existing local DB. There is also a requirement for additional cable containment to the final position of each camera. All completed works will be required to be tested and commissioned by Global Rail Services and along with the provision of all necessary handover documentation. These works will take place in Per Way Compounds and in Per Way Buildings, which are near the running rail. 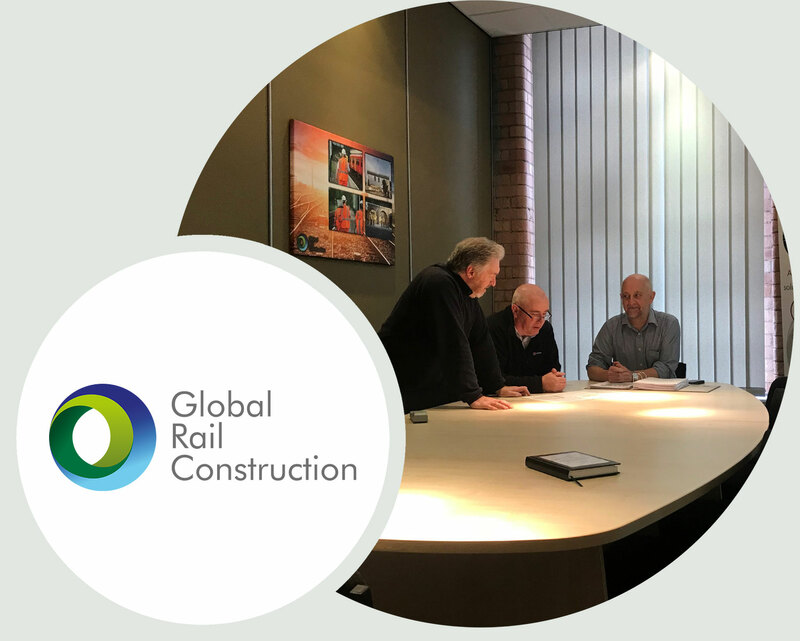 Global Rail Services’ in-house M&E division – led by Aidan Kelly, will manage the project and will utilise its in-house accredited personnel who have all undertaken PTS training. GRSL’s M&E offering is constantly upgraded through training and development and is consistently delivered to the highest specification. 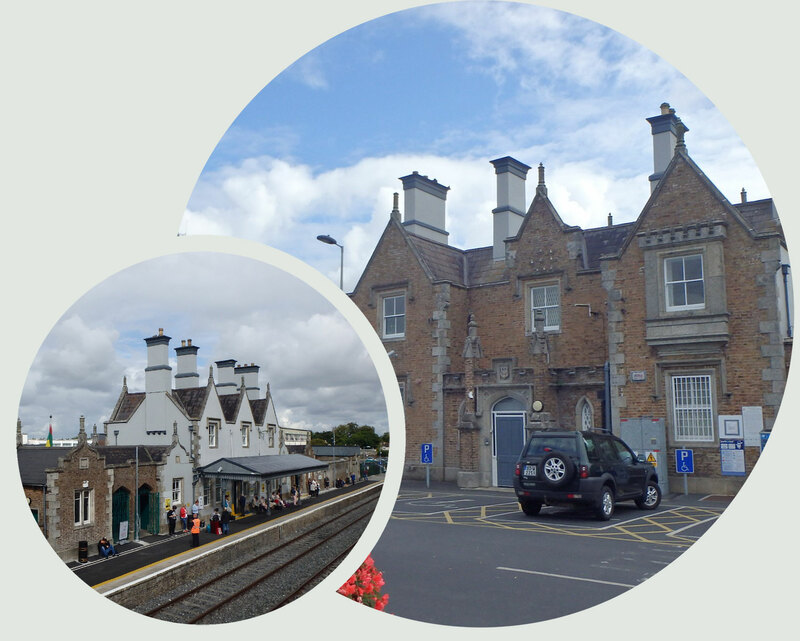 GRSL has been awarded a heritage roof renovation project on behalf of Irish Rail at Carlow Station. 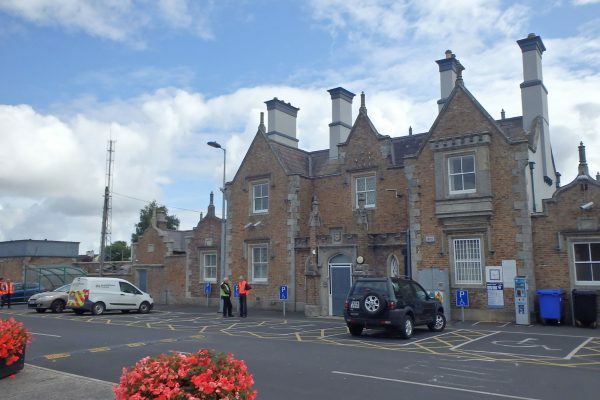 Carlow is a historical and listed railway station built in 1848, which serves the town of Carlow and is a station on the Dublin to Waterford intercity route. The station has two platforms. The far-side platform is only used when two trains are in the station at once, as it is not accessible other than by footbridge. In order to ensure that the listed building is protected from the elements, GRSL must set up the site and erect scaffolding that is both fully compliant and also provides total protection in respect of weathering. The station will remain open during the works, so due consideration will be given to both the public and Irish Rail staff. This is particularly important, as the booking office is also to remain operational. GRSL’s will then set about removing the existing slates and ridges – putting them aside for re-use. This will allow for appropriate access to remove and dispose of the defective rainwater goods, lead-work and the timber fascias, soffits and bargeboards. Once the strip out has been completed, GRSL will treat all existing roof timbers and install new felt and battens to the entire roof area. They will then supply and fit all new lead-work, cast iron rainwater goods, roof timbers and then relay the slates. In addition to the re-roofing works, GRSL has also been awarded the station painting works. 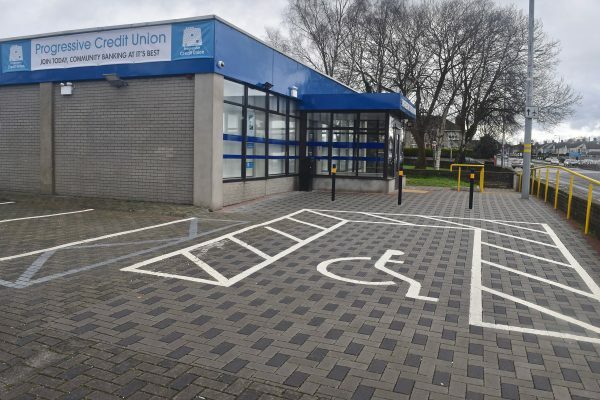 Global Rail Services – the Dublin based Railway Civil Engineering and M&E specialist – has secured two packages of accessibility works covering fourteen stations for Irish Rail. The Disability Act 2005 is a key part of the National Disability Strategy launched by the Government in 2004. The Act requires that Public bodies make their public buildings accessible, to people with disabilities. 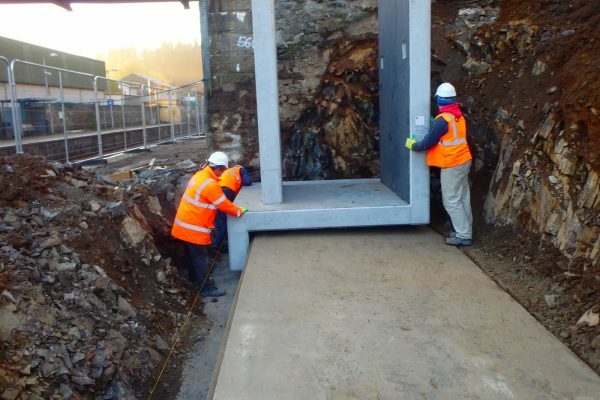 Global Rail Services has previously delivered significant works for Irish Rail and is set to implement further accessibility works to improve accessibility for people with mobility impairments. The works include setting up a safe and secure compound area at each station and providing necessary traffic management. Global Rail Services will be completing works at operational stations, so will also need to ensure that safe pedestrian access is maintained for commuters in and around the station, on the platforms and across the footbridge at all times throughout the works. 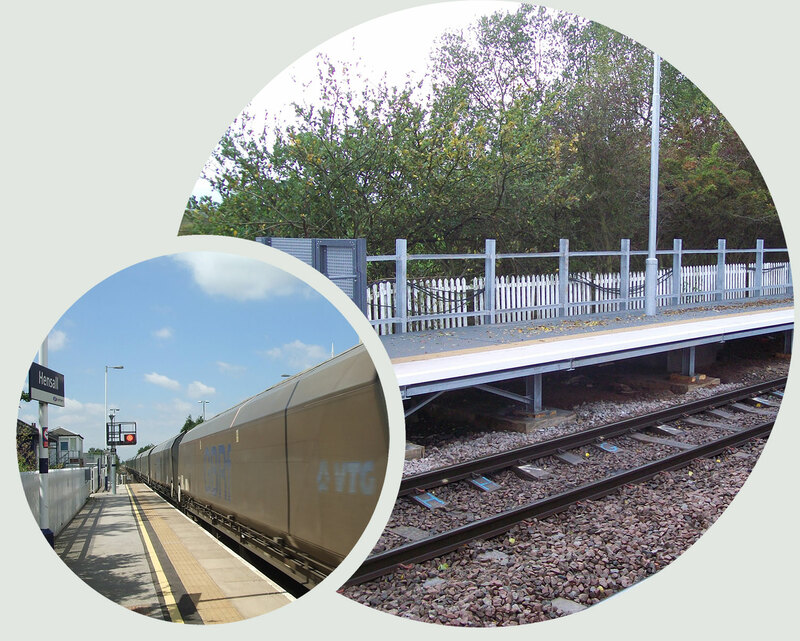 Works at each station have a slightly varied scope, however typically include modifications to platform walls, surfacing, tactile paving, new thermoplastic markings, amendments to fence lines and installation of new fencing and gates. Some locations also require improvement works to station footbridges including new handrails and nosings. There is also the requirement for new station lighting, painting and site signage works. Global Rail Construction (GRCL) is pleased to announce it has secured a multi-disciplinary design and build contract at Greenwich Generating Station, and will comprise the design and construction of housings and enclosures to support the static VAR compensator (SVC) assembly from Siemens Plc. Greenwich Generating Station stands on the south bank of the River Thames and provides emergency back-up power for the underground in case of a substantial failure in the National Grid. 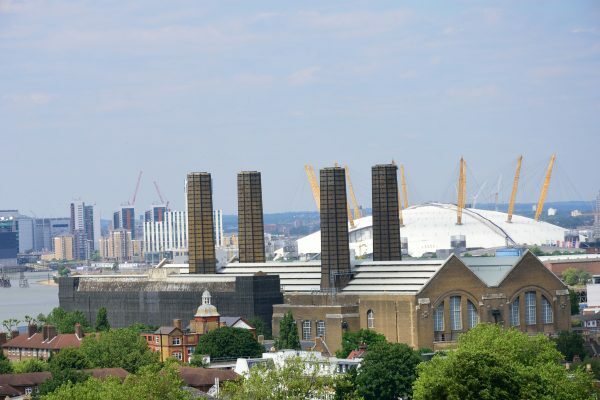 As part of London Underground’s power upgrades, Greenwich Generating Station has been identified as a suitable location to install equipment that will improve the quality of the power feeding the distribution network. Following significant changes to the site and its associated infrastructure the original turbine hall is now mostly unused and has available space. It is intended to use the available space by installing equipment to improve power quality and to generate low carbon electricity to the London Underground (LU) network. Construction of an extension to the first floor 22kV switch room. “This project is a fantastic opportunity for us to display our extensive multidisciplinary design and construction capabilities for a prestigious client. It will be a challenging scheme with many technical difficulties involved, particularly around planning and making space available to accommodate the site’s SVC assembly equipment layout. 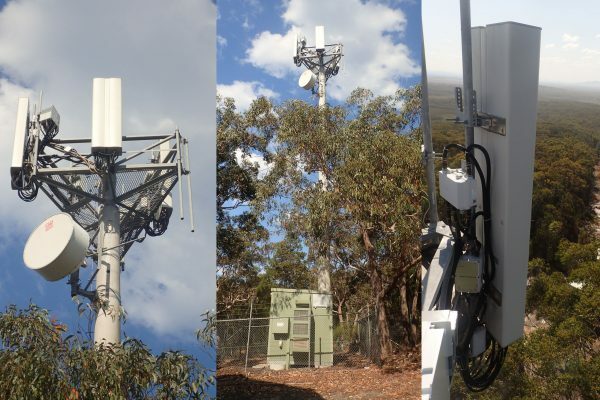 GRA Networks has completed its first telecommunications job in NSW, the site is located in Hat Head which is on the coast and is 5 hours north of Sydney. The work was completed on behalf of Huawei for Optus and is part of the RANCAP Project. 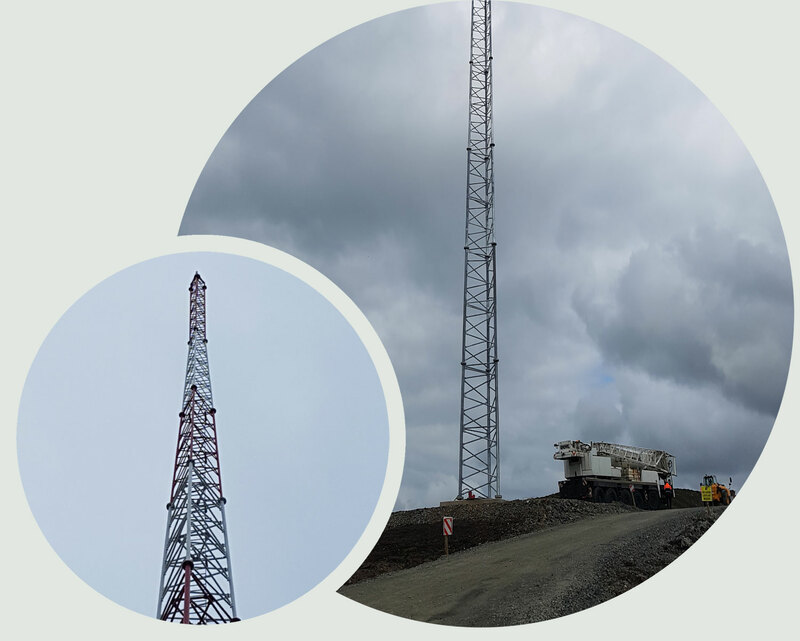 GRA Networks deployed a skilled team to complete the works onsite, the work involved the upgrade of an existing Optus site and included the installation of new Remote Radio Units (RRU’s) on an existing triangular head frame. The work also included the installation of a new trunk cable from the shelter to the monopole and antennas. 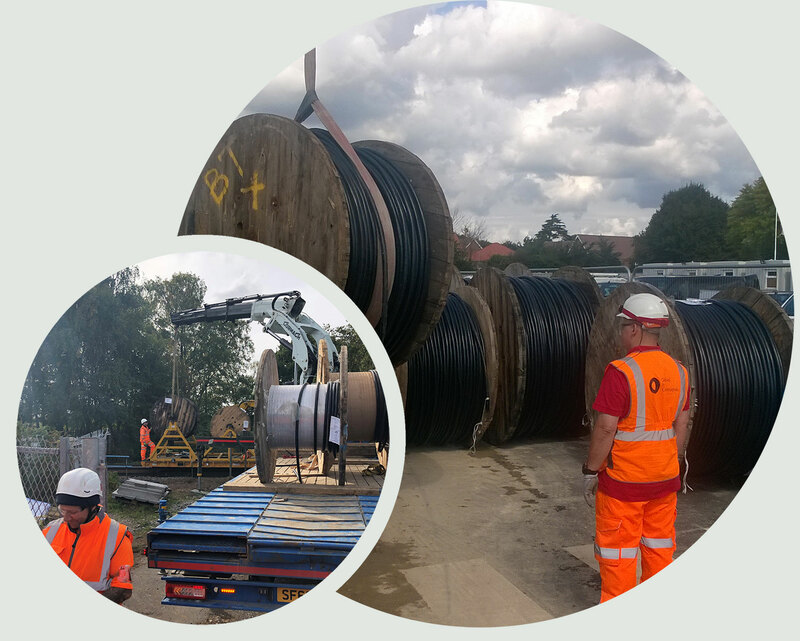 The works form part of a geographical extension to the existing Victoria contract held by GRA Networks, which provides their client Huawei with a fully project managed telecoms service, creating a delivery solution for the upgrade and installation of telecoms equipment. 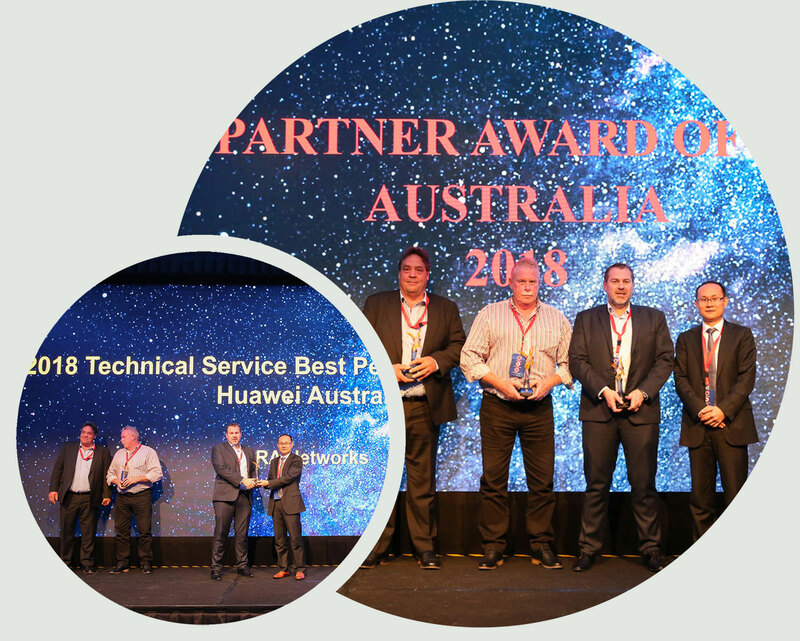 Huawei are the largest telecommunications manufacturer in the world, employing 170,000 people – working on behalf of Optus, one of the largest telecommunications providers in Australia. 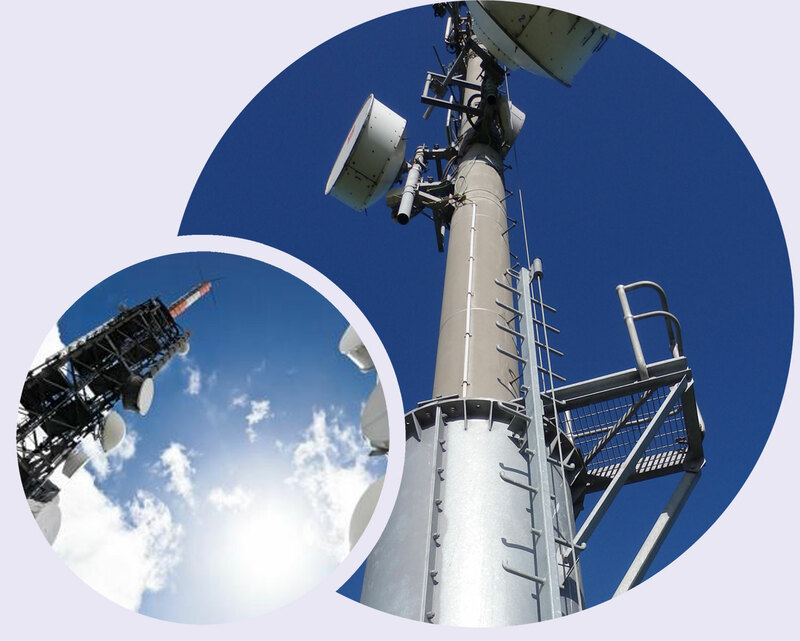 As a full service telecommunications contractor, GRA Networks provides a comprehensive range of services from upgrading existing infrastructure, to building new mobile phone towers and other wireless network infrastructure. Our team of highly skilled telecommunications professionals includes project managers, telecommunications engineers, telecommunications riggers, fibre splicers, electricians and technicians. 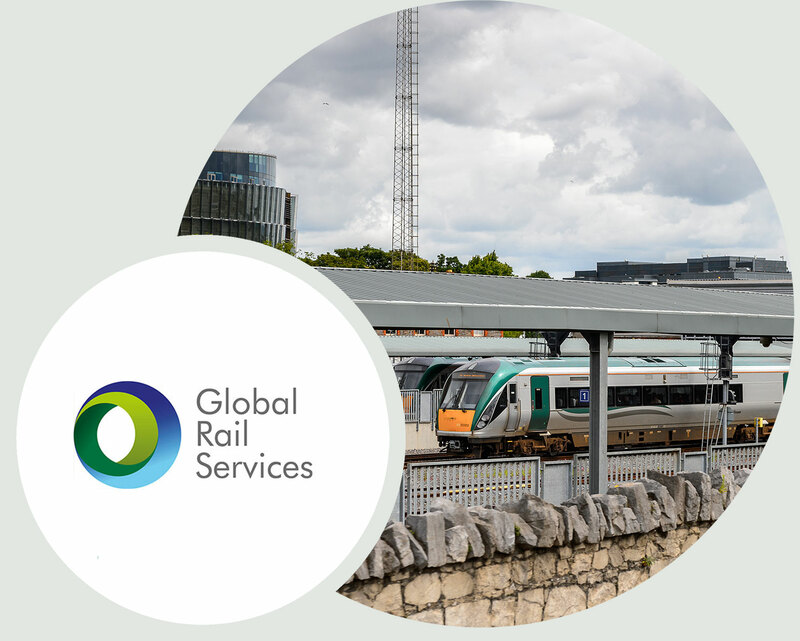 Global Rail Services is delighted to announce it has been awarded another contract with Irish Rail as part of its Mechanical and Electrical framework agreement. The project specifically consists of works at Irish Rail’s Dublin Connolly Railway Station to upgrade the station’s boiler systems. The existing life expired oil-fired heating boilers will be replaced with new modulating gas units, and the plant rooms will be refurbished and fitted with gas and fire detection systems. The Plant room refurbishment will involve the installation of new radiator units, pipework and all associated mechanical, electrical and associated builder works in connection. The works will also require careful management of various stakeholder requirements during the works, to ensure that the programme is fully co-ordinated to meet the requirements of station staff and passengers. Aidan Kelly, M&E Manager at Global Rail Services, said: “This is the latest in a trio of significant contract wins for us on the Irish Rail M&E framework, and further solidifies our excellent relationship with this very important client. “The boiler replacement scheme at Dublin Connolly Station will require a full turnkey delivery solution from our experienced in-house M&E team, and will be a challenging project to complete, requiring us to utilise a full range of our in-house capabilities. Works on the project are currently underway and are due for completion by the end of October 2017. 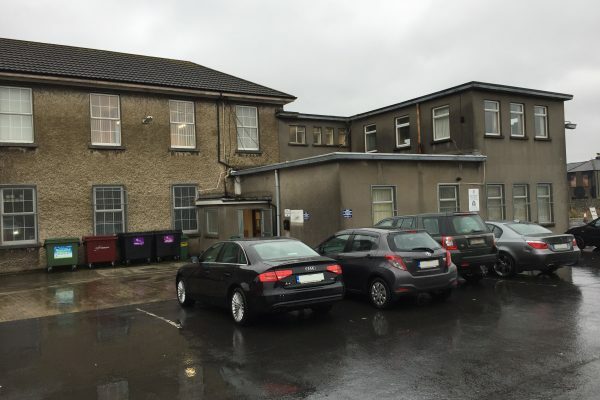 Global Rail Services (GRSL) has been awarded a contract with Irish Rail to complete the re-roofing at its Telecoms Workshop based at the Railway Works in Inchicore. Inchicore, west of Dublin’s city centre, is the principal locomotive and carriage works of Irish Rail, where locomotives, diesel railcars and rolling stock are maintained. The Telecoms Workshop is an industrial building dating back to the 19th century, and is located within the Railway Works yard. GRSL was awarded the scheme through competitive tender following a successful pre-qualification process. Discussing the contract award, General Manager Tom Staunton, said: “This is another fantastic contract win for GRSL and is further evidence of our growing reputation as a leading multi-disciplinary rail infrastructure contractor for Irish mainline and metro rail systems. 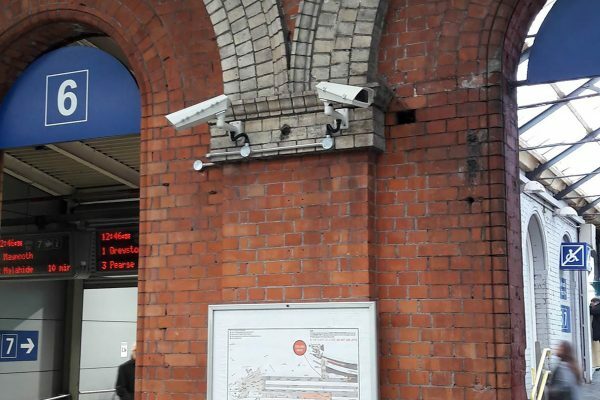 Global Rail Services is pleased to announce it has been awarded a contract with Irish Rail to provide upgrades to its DOO CCTV at Kildare line and the Northern line under the project DOO Image Enhancement. “We are delighted to have secured this significant contract with Irish Rail, which is a further addition to our framework delivery. 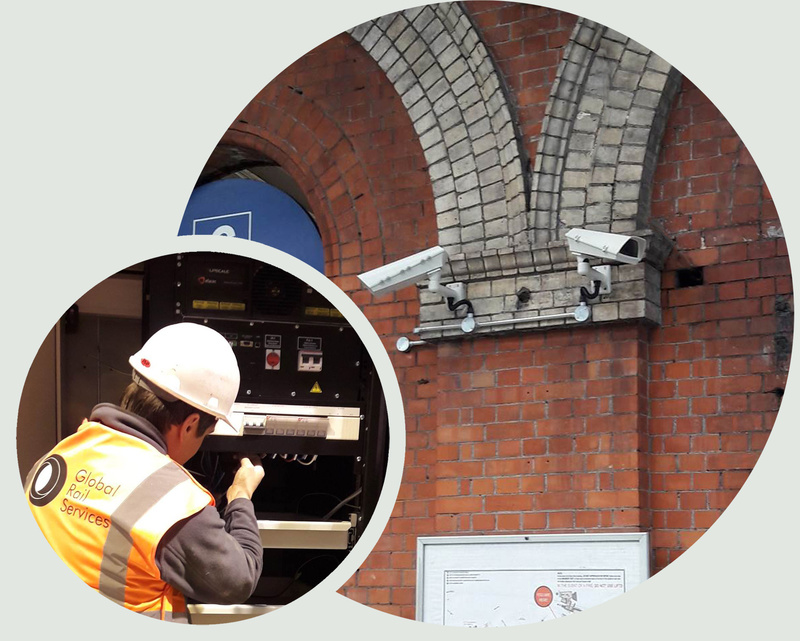 Our vast experience of safety-critical M&E projects in the rail industry will help us with the completion of this scheme, which will provide robust and modern Driver Only CCTV systems at both of these heavily used locations. 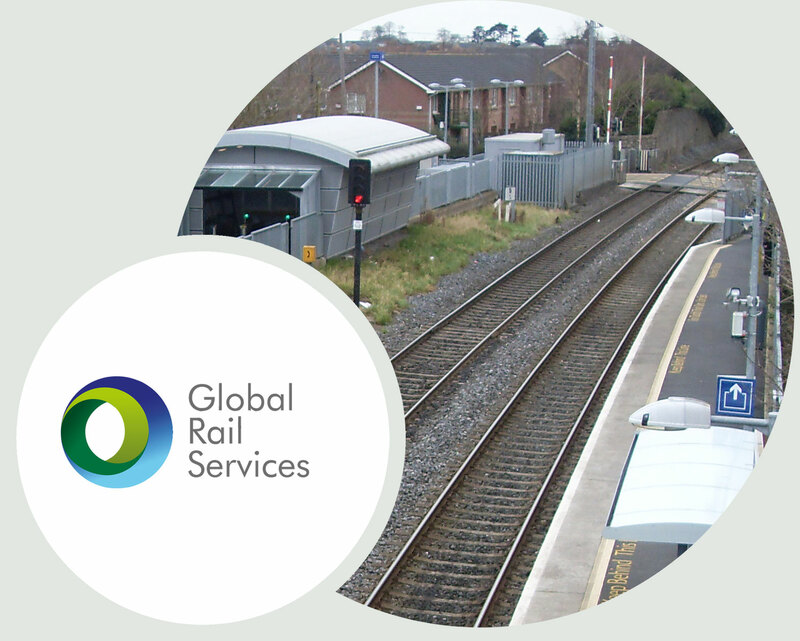 Global Rail Services is a leading Irish multi-disciplinary contractor that offers a one-stop building and refurbishment solution, using a combination of their in-house Project Management, Building and M&E workforce. Global Rail Services has been awarded a contract to deliver a retrofit efficient lighting scheme to an extensive range of advertising displays for transport companies Irish Rail and Bus Eireann. Both Irish Rail and Bus Eireann have an extensive range of advertising displays across their networks. The lightboxes are illuminated by fluorescent tubes and are mixture of single-sided, double-sided units and others with internal support bars. Supply of alternative lighting package to convert the existing system to a low energy/low maintenance solution, whilst maintaining the existing illuminance levels. Supply of energy efficient (LED) luminaires to replace existing fluorescent tubes, while maximising light uniformity & colour vibrancy on the displayed posters. The project is part of Global Rail Service’s Maintenance and Replacement of Mechnical and Electrical Systems framework collaboration with Irish Rail. Aidan Kelly, who manages all M&E works undertaken by Global Rail Services, said: “Our team will deliver this challenging scheme across a large number of locations for the clients. It will result in an upgraded low energy and low maintenance solution which provides cost-savings while maximising light uniformity and colour vibrancy on the displayed posters. 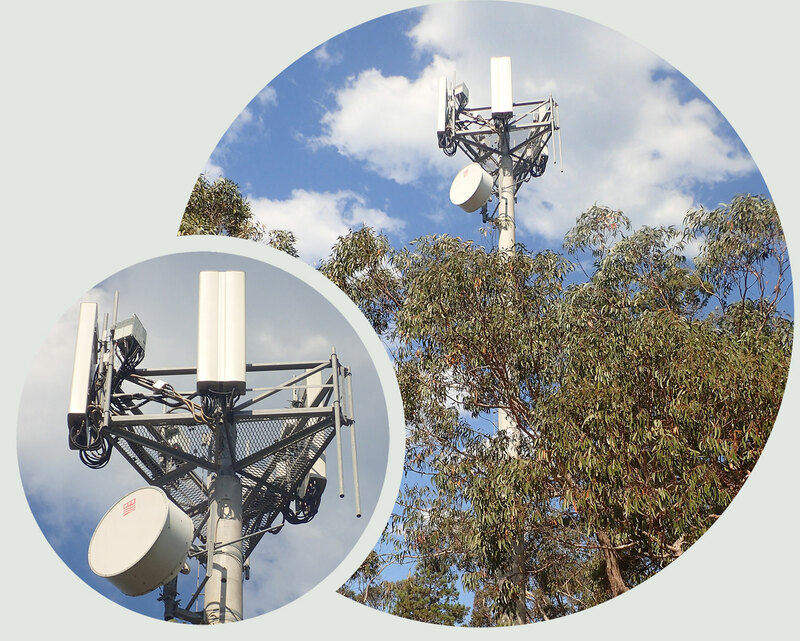 Despite some of the harshest weather conditions, Australian Telecoms Infrastructure Contractor GRA Networks, has achieved some incredible success on behalf of their clients Huawei and VHA with the completion of two mast sites in Victoria: Falls Creek and Bright. Falls Creek and Bright are resort towns in North Eastern Victoria, Australia and well known as alpine and cross-country ski centres. Not only was the weather extremely challenging, these high-profile projects were also logistically challenging due to the mountainous location. Delivering the works, GRA Networks Project Manager Craig Gibson, used all of his twenty years’ major telecoms project experience and knowhow to devise and deliver a unique and ‘out of the box’ solution. Due to the difficult terrain, snow patrol equipment was used to transfer materials and equipment to the mast location at night, when the ski slopes were closed. The field team could only access the work site via the resort ski lifts. Once the equipment had been finally delivered, installation works then commenced. The battle with the conditions was intense, ice and snow had to be removed from the monopole and equipment daily. The timeframe was extremely challenging for GRA Networks’ specialist rigging team, particularly as all of the equipment was installed using only slings, ropes and pulleys, and with these carefully planned and brilliantly effective techniques, the installation progressed successfully, whilst also ensuring that no damage was caused whatsoever to any of the existing equipment above the work zone. 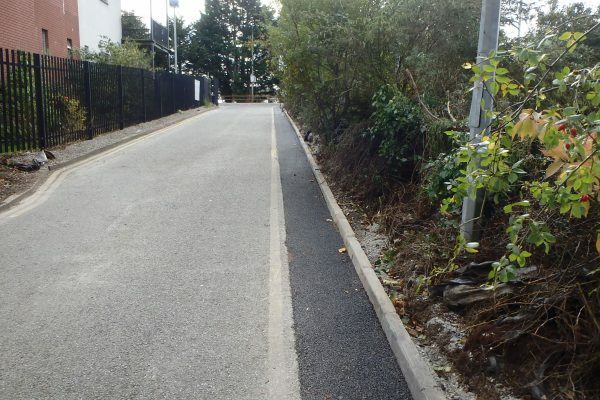 Site welfare and site safety as always was the highest of priority for GRA’s staff – and this project was no different. 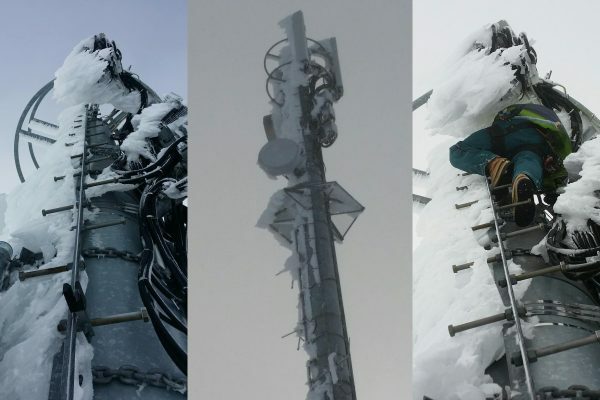 Close monitoring was kept by Craig and his site supervisory team, to ensure that staff wellbeing and workforce safety were monitored every hour, with regular breaks and shift changes taking place more frequently than other typical telecom sites, mainly due to the freezing weather as well as the altitude. “I would like to thank you all on behalf of Huawei as without the team effort made with these sites they would not have been completed. Make no mistake guys, your efforts to deliver these sites and others is recognised and very much appreciated. We do not say it enough but trust me it is thought about every day, as every day has its own challenges. GRA Networks offers infrastructure contracting services on a design and construct basis. We operate in the telecommunications, utility and energy sectors working on multi-disciplinary projects to meet the needs of our clients and provide cost-effective solutions to complex problems. Led by experienced professionals with in depth knowledge of these sectors and supported by skilled and dedicated in house teams, we offer a fully integrated solution, allowing us to provide clients with a unique turnkey offering that is value adding. This inclusive approach allows our clients to benefit from expertise in a number of sectors and ensures they receive the most appropriate advice and solution for their schemes. With a skilled, multi-disciplinary workforce providing a broad range of services and operating in tandem with a highly experienced management team, GRA Networks is geared to meet our clients exacting demands. Bespoke solutions for individual client requirements are central to GRA Networks’ offering. We offer a fully planned and managed design and construct service, which includes materials procurement and logistics management. UK Rail contractor, Global Rail Construction Ltd, is delighted to have secured the Principal Contractor (PC) role for the design and construction of the advanced civil engineering works on Phase 1 of the Feltham resignalling project – having submitted a most detailed and comprehensive offer to do so. 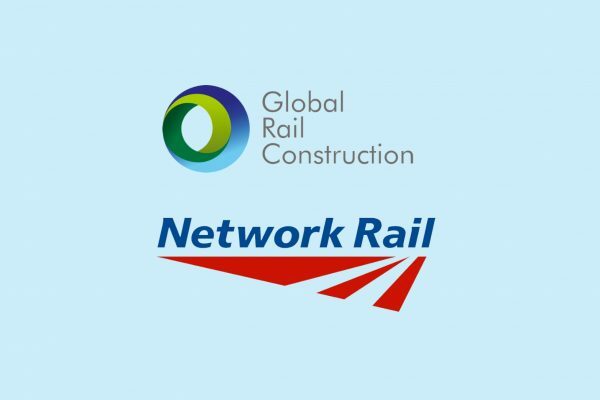 As PC, Global Rail Construction (GRCL) will deliver the full GRIP 5-8 design and construct contract directly for Network Rail Infrastructure Limited (Network Rail). The scope of work covers civil and structural engineering works on Network Rail’s Wessex Route and specifically covers: Area 1a – Shepperton Branch; Area 1b – Norbiton Sub Station to Fulwell Jct and Area 2 – Barnes to Whitton Jct, Hounslow Sub Station. 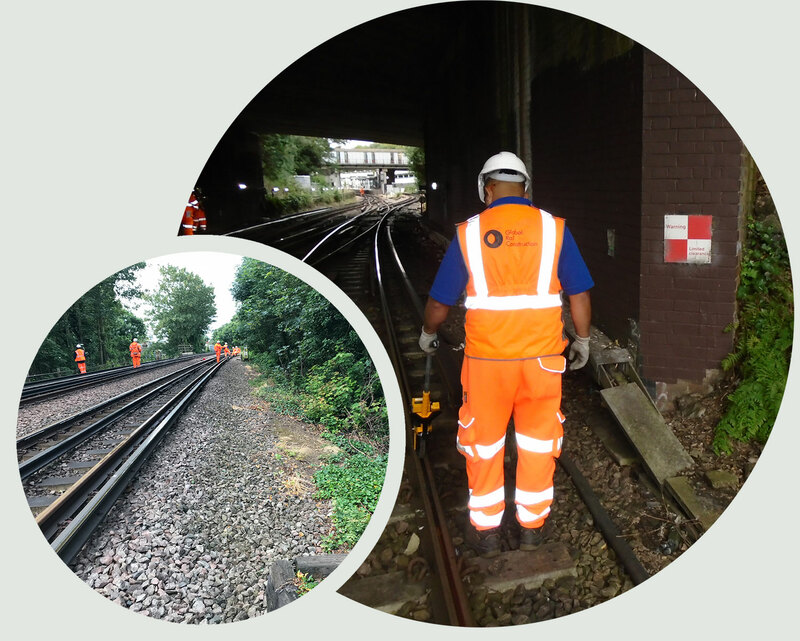 “This PC contract award comes off the back of our previous sub-contract work on the Feltham resignalling scheme, whereby civil and structural engineering works were undertaken along the Shepperton branch and successfully completed at the end of 2016. 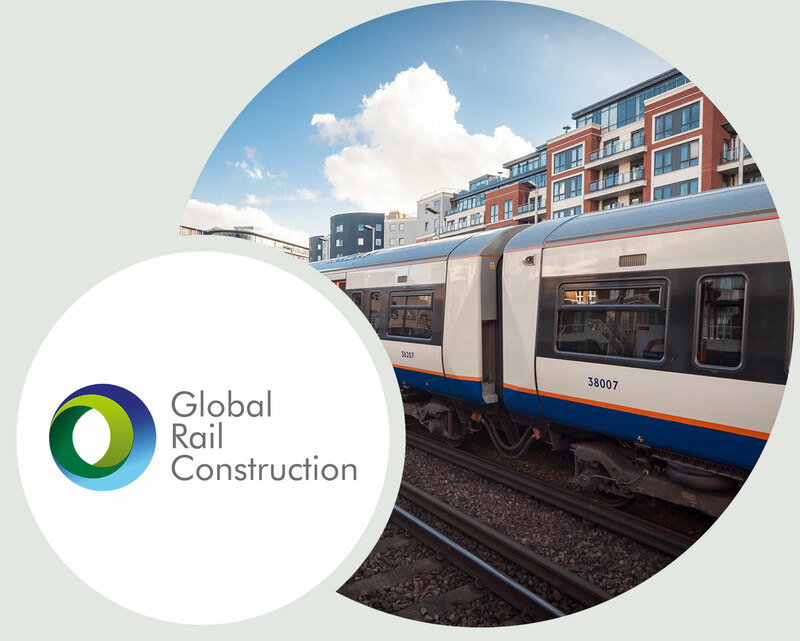 Global Rail Construction Ltd is part of the Global Infrastructure Group and is a leading UK provider of design and build services to clients in the rail and transportation sector. The company is a principal contractor for UK mainline and metro railways across a number of disciplines, which include signalling, mechanical, electrical and power (MEP), telecoms, civil and structural engineering, maintenance, renewal, providing a fully tested and commissioned service, on both Network Rail and Transport For London controlled infrastructure. You can read more about what we do by clicking here. 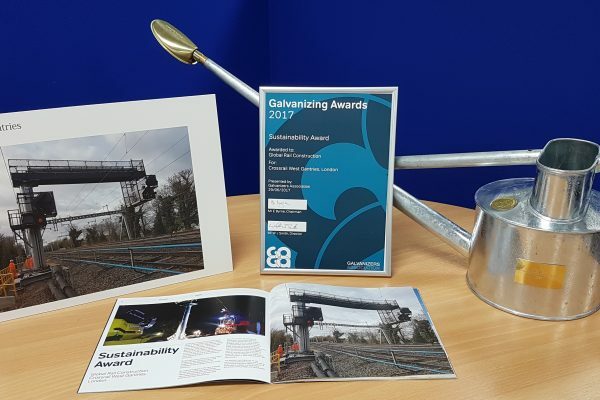 Global Rail Construction Ltd has been awarded the Sustainability Award at the Galvanisers Association’s GAGA Awards 2017 for its work to design, supply and install of several large galvanised steel signal structures for Network Rail at Crossrail. The company was commended for its efforts to achieve significant cost and programme efficiencies while including new strategies for sustainability at the end of the installation’s life. GRCL’s engineering team offered a thoroughly sustainable approach to the project lifecycle, allowing them to consider all aspects of material construction and deconstruction. They proposed the use of hot dip galvanised gantry and cantilever structures with galvanised steel support grillages, which allows the equipment to be easily reused or recycled when removed at the end of its useful life. The decision to move away from traditional methods was a key success of this project. Current end of life scenarios for steel and concrete show that 93% of steel is recycled and 6% is reused – a growing natural resource as opposed to concrete which is 20% recycled and 75% downcycled. 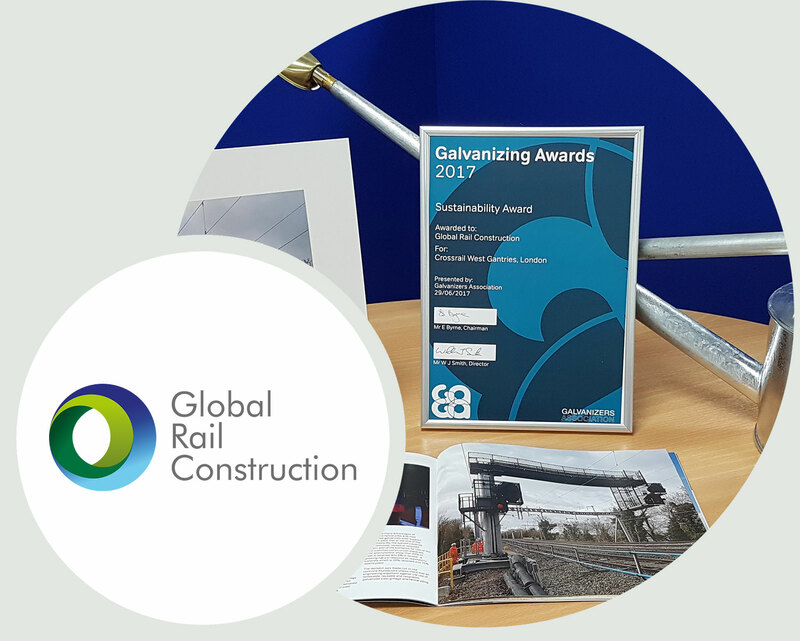 David Vine, Principal Design Manager of GRCL said: “We are delighted to have been recognised for our efforts to provide innovative solutions for the galvanising industry with this important award. To read more about the rail infrastructure projects Global Rail Construction undertakes, please click here. 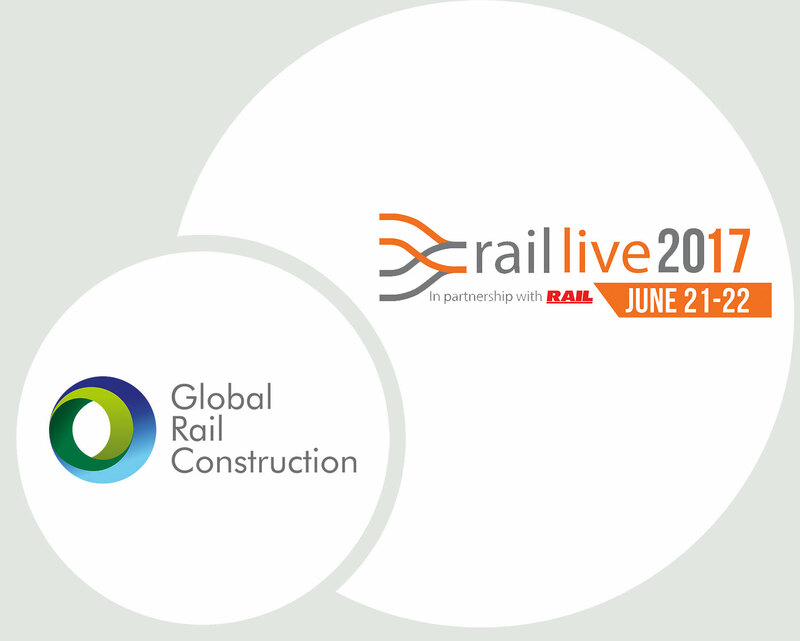 Visit Global Rail Construction at Rail Live today! 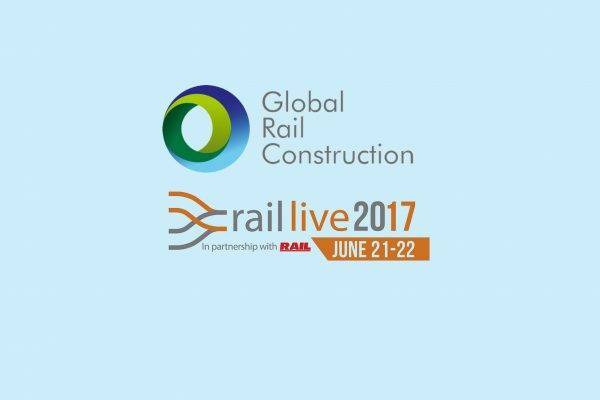 Global Rail Construction is currently exhibiting at Rail Live, one of the largest rail exhibitions in Europe. Rail Live has been recognised as the ‘highlight rail event of the year’, and hosts hundreds of exhibitors from across the industry. It is taking place at the Quinton Rail Technology Centre in Warwickshire, and is a fantastic opportunity for customers and suppliers to meet face-to-face, sharing best practice solutions, demonstrating new products and networking with high-profile industry leaders. 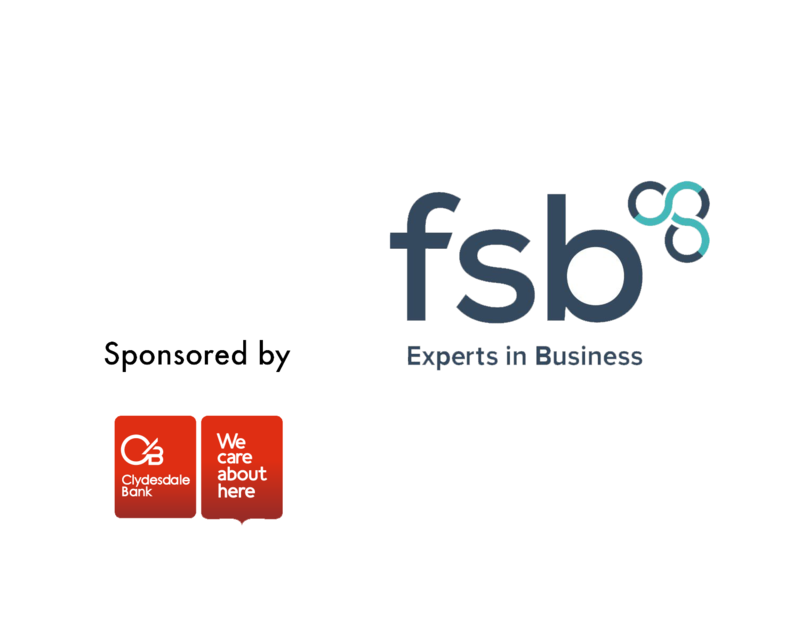 Global Rail Construction is exhibiting alongside foundation solutions business Van-Elle, and we will be showcasing our in-depth knowledge of UK rail systems, while meeting and greeting our industry peers. The event will allow us to present our expertise in turnkey design and construction projects, and help us in exploring new opportunities. Rail Live is taking place today between 10am and 4pm. 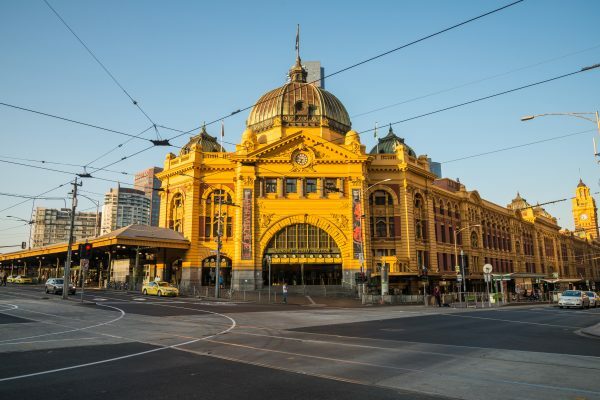 Global Rail Australia has won a significant project at Flinders Street Station (FSS), on behalf of Metro Trains Melbourne (MTM). Flinders Street Station is Victoria’s busiest railway station and used by approximately 200,000 passengers on an average weekday. 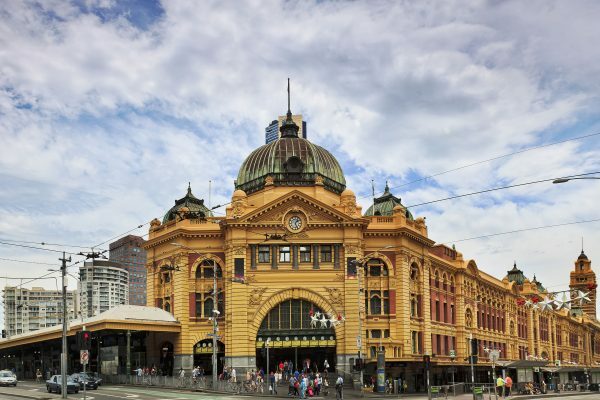 The Victorian State Government has committed to invest $100M to repair and refurbish Flinders Street Station, with these works forming part of their commitment to deliver works, which provide improved customer experience benefits. Global Rail Australia has been awarded a package which includes the construction of a new station entrance and also the refurbishment and upgrade of the public toilet amenities. 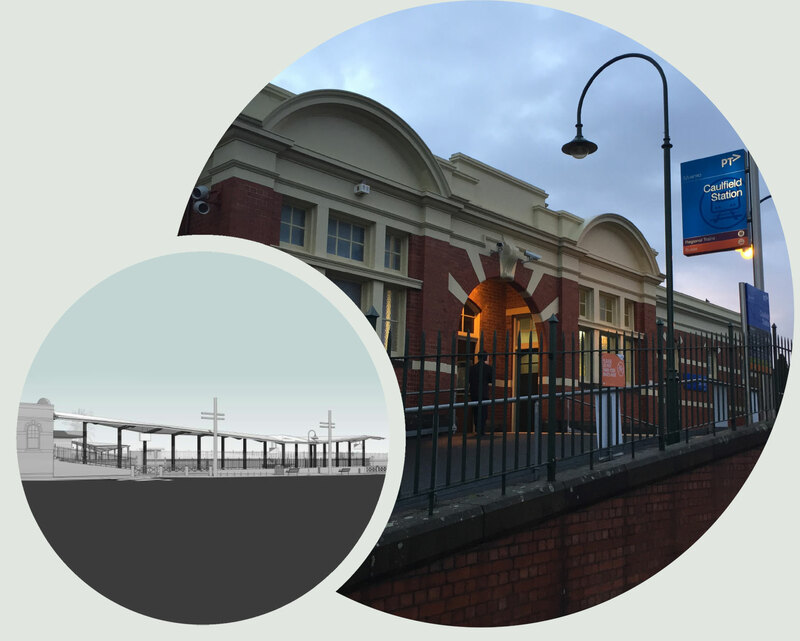 The new entrance will be located adjacent to the Yarra River and will include a new canopy adjacent to Platform 10. 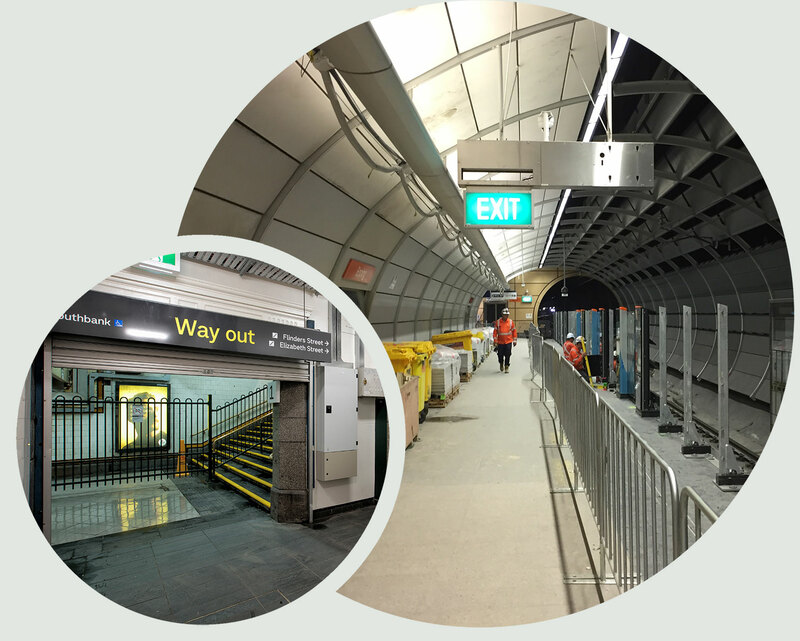 This new entrance will improve access and reduce congestion by creating a direct and more accessible entry to the station and platforms, which will allow for faster passage through ticket gates. The works include the construction of all substructure works, erection of the structural steel frame, installation of all roofing and cladding, construction of DDA compliant access ramps, installation of ticket validation turnstiles, installation and commissioning of all services. 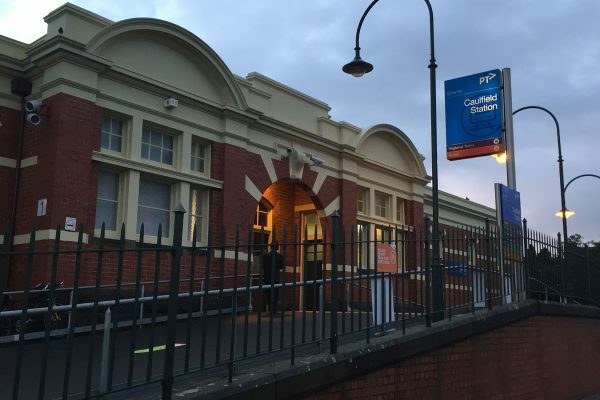 Global Rail Australia will also be refurbishing the public toilet amenities at Flinders Street Station. 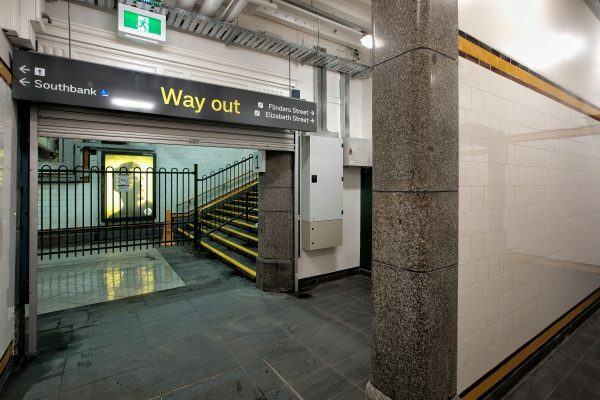 These works will include the refurbishment of the Male and Female toilets located in the Elizabeth Street Subway, including the provision of new DDA compliant facilities. The company will also be refurbishing the subway access stairwell, to provide a new access point to station platforms. The works include all structural alterations, floors, wall and ceiling finishes. The works also include the installation of all building, mechanical and electrical services. 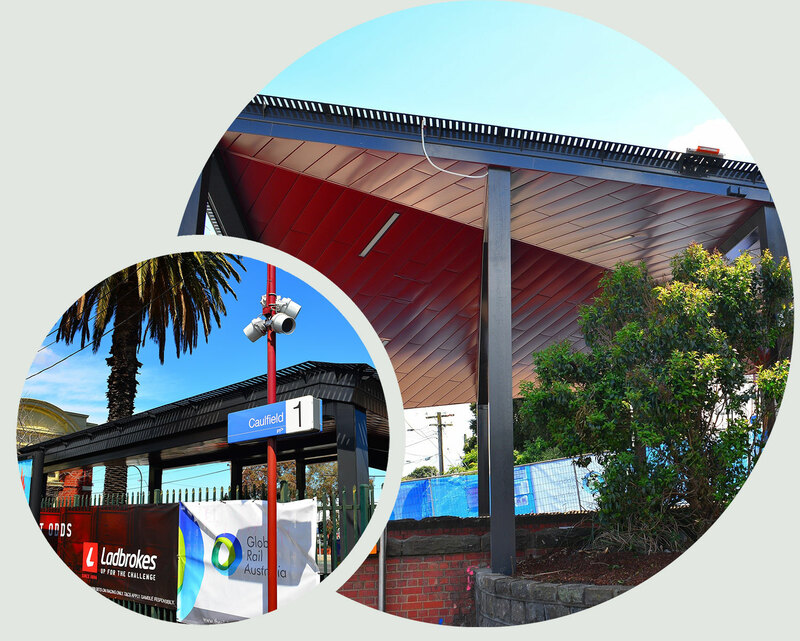 Elements of the building fabric are heritage listed and as such Global Rail are required to re-paint, re-tile and renew these fixtures and fittings in accordance with Heritage Victoria requirements. 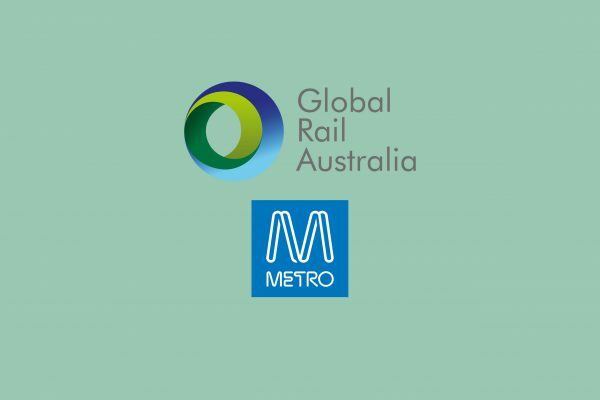 Global Rail Australia is part of the Global Infrastructure Group and is a leading Australian provider of design, construct and commission services for clients across a wide range of engineering and infrastructure industries. The company was selected as the preferred contractor on this project for its rail capabilities, previous successful work for MTM and its supply chain partnerships. The Galvanising Association has been providing an authoritative guidance and information service on hot dip galvanising since 1949 and has specifically recognised and commended its use since 1994, via its annual awards ceremony the “GAGAs”. 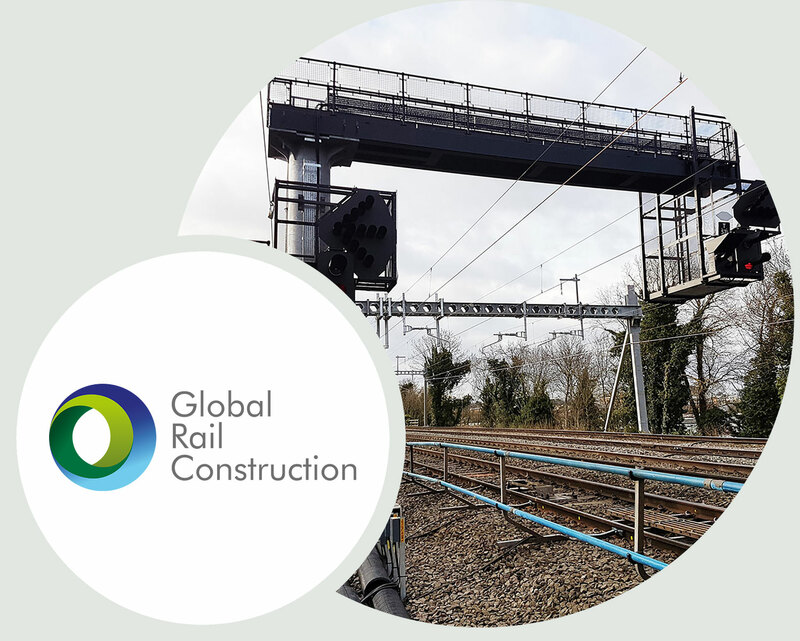 Global Rail Construction Ltd (GRCL) is delighted to have been shortlisted for a construction award in respect of the installation of their large hot dip galvanised (HDG) steel signal structures and foundations for Network Rail at Crossrail. 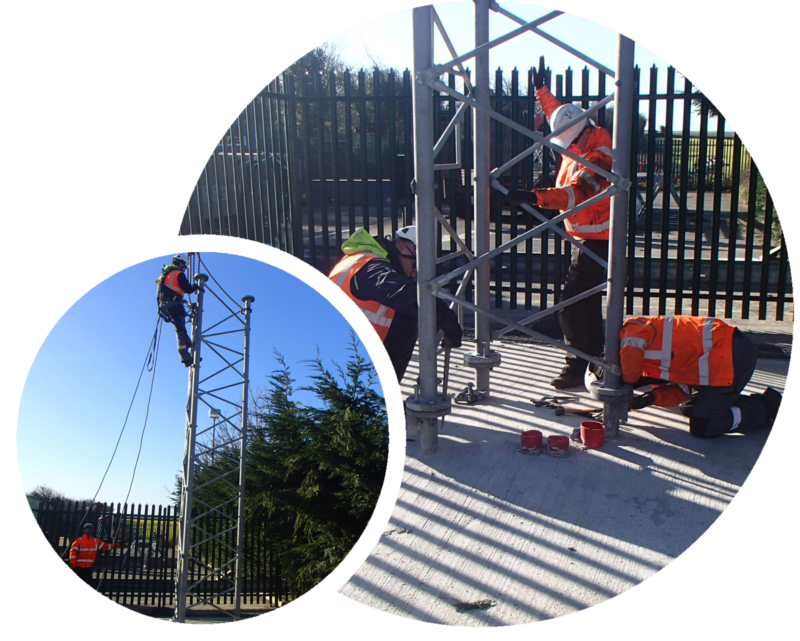 An in-house design and build team has enabled GRCL to construct many galvanised signal support structures for the UK Rail Infrastructure over the years. GRCL’s contract specifically covered the design, supply and installation of several large HDG steel signal structures including a five-track gantry signal and a large HDG steel two-track cantilever structure, plus several smaller HDG steel lightweight gantry and cantilever structures. The use of HDG delivers many advantages over more traditional methods and also allows HDG at the end of the installation life, to be easily removed and either reused or recycled. GRCL’s engineering team offered a thoroughly sustainable approach to the project lifecycle, allowing them to consider all aspects of material construction and deconstruction. 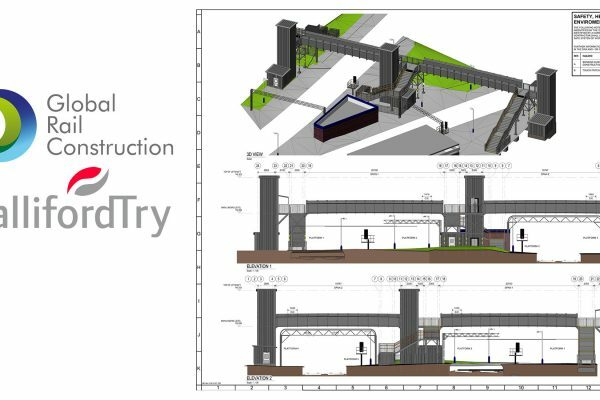 This approach helped to ensure that all the constituent parts of the project were either easily recovered for reuse or recycling. Directly employed GRCL staff installed all HDG foundations and structures. 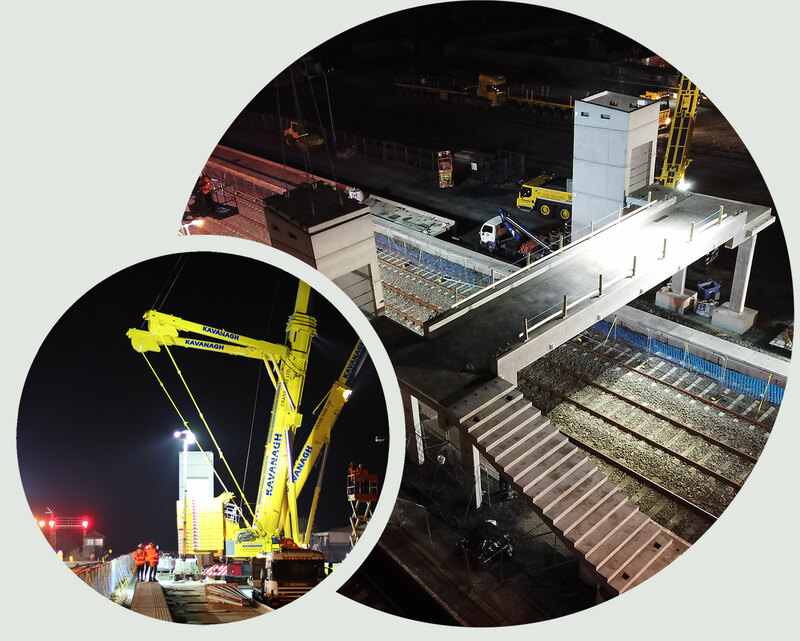 The lightweight “no access” cantilever and gantry structures were installed during midweek night shifts and isolations using RRV cranes. 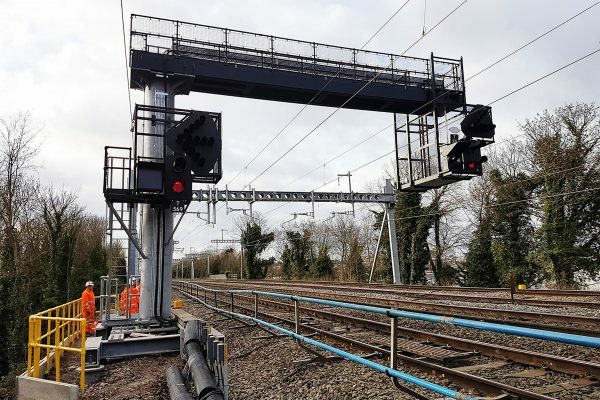 The large two-track access cantilever at Maidenhead was installed over several weekend possessions, which was complicated by the early running of the new Overhead Line Wires (OLE) in the area. Careful planning of the lifts enabled the structure to be installed between the wires, which allowed all works to be completed and handed over on time and to budget. Hot Dip Galvanizing has protected steel across UK and Ireland for more than 150 years. It bonds itself metallurgically to steel imparting toughness and abrasion resistance through its alloy layers. Its unique characteristics help provide a long maintenance free life for steel. 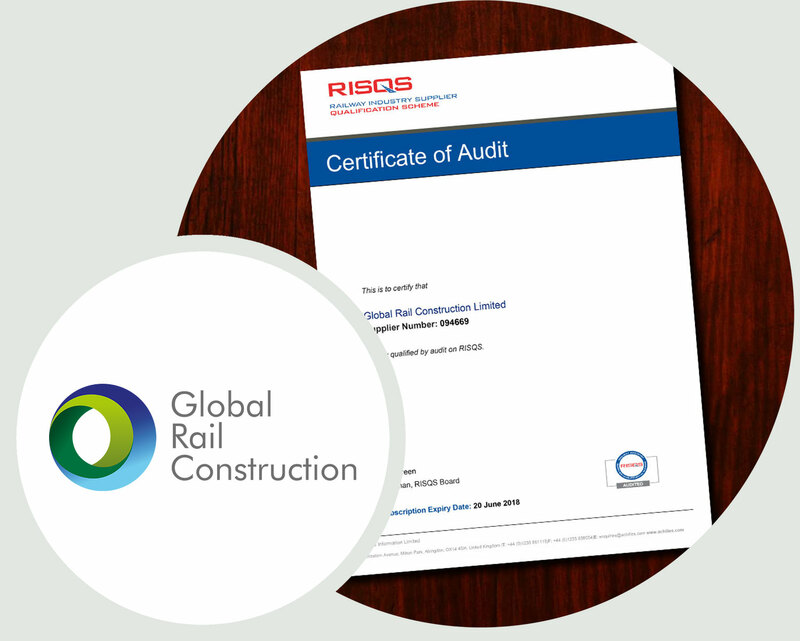 It has been a busy time for Global Rail Construction’s Quality and Compliance Team, having had consecutive months of external accreditation audits. May saw the business pass its annual RISQS audit with the highest rating of 5 stars last month. RISQS is the railway industry supplier qualification scheme, and is the preferred route for suppliers to engage with their customers through a fair, open and transparent third-party qualification process. 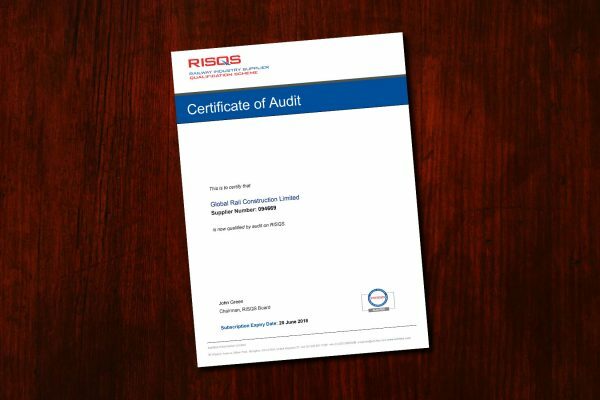 In June, the team has overseen the successful completion of an audit of the company’s ISO9001:2008 accreditation – the international standard for Quality Assurance. 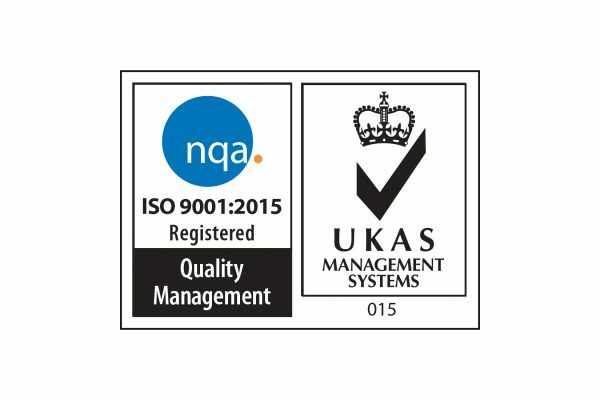 This surveillance audit of the quality management systems was undertaken by NQA (part of NTS), which is one of the leading independent providers of accredited certification, training and support services to help organisations perform better in quality, environment, energy, sustainability and health & safety management. During the three-day audit, there were no NC’s (non-compliances) raised however, one opportunity for improvement was identified with reference to the collection of customer feedback. “Special thanks again to all those who participated in the audit both in the office and also at the 820 Romford Project. 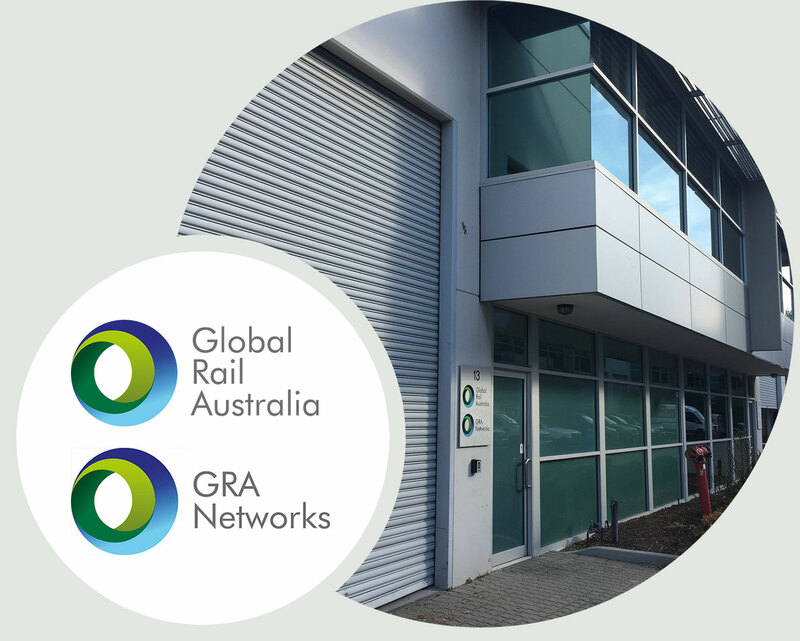 Global Rail Australia Pty Limited and its sister telecommunications operation GRA Networks are pleased announce that their new regional office and Warehouse in Sydney has opened on the 6th June 2017. The fully contained facility will support its rail and telecoms contracts to help deliver Sydney’s multi-modal transport regeneration plan. The company has assembled a vastly experienced management team to run this operation, whose rail and telecoms industry reputation precedes them. 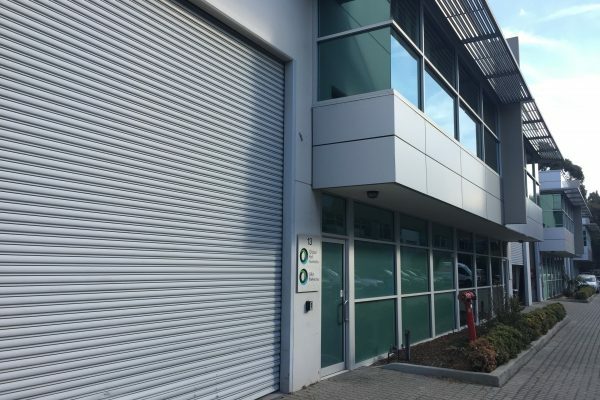 Their new office in Sydney is a signal of its regional expansion, which is heralded from recent successes across its rail infrastructure sectors of operation, which encompass civil and structural engineering, M&E and Railway Signalling. The company has an outstanding record throughout the state of Melbourne and will be delivering this offering in Sydney, off the back of some important contract wins. 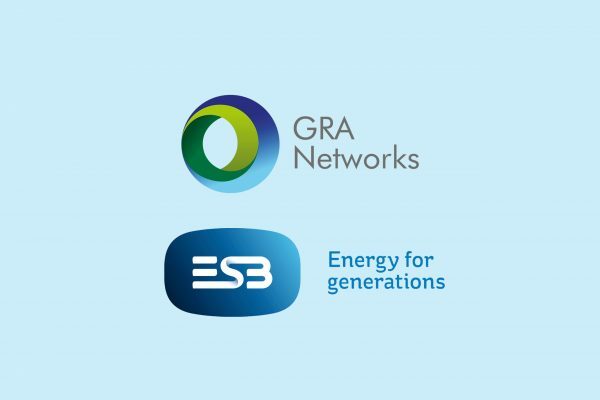 We are proud to announce news of a long-term framework that has just been awarded to GRA Networks, in respect of ESB Telecoms Tower Build’s and Maintenance Services Programme. The works will be on behalf of ESB Telecoms Ltd (ESBT), who were established in 2001 as a wholly owned subsidiary of ESB Group, and are Ireland’s leading independent telecoms infrastructure and bandwidth solutions provider. ESB (Electricity Supply Board) itself was founded in 1927 as a statutory corporation in the Republic of Ireland, and is currently 95% owned by the State. It is a vertically integrated utility, generating and delivering electricity to customers all over the Republic. ESB Group employs approximately 7,150 people. GRA Networks was formed in 2011 as a result of an opportunity to supply a more comprehensive and effective delivery model in respect of Wireless Telecoms Services to Main Telecom Providers. Since its inception, GRA Networks has secured significant packages of work based on its expertise in various disciplines and by providing flexible management and skilled resources on a project-by-project basis. As a result, the company has successfully completed projects for a variety of clients ranging from state bodies and local authorities to major infrastructure organisations and network providers. 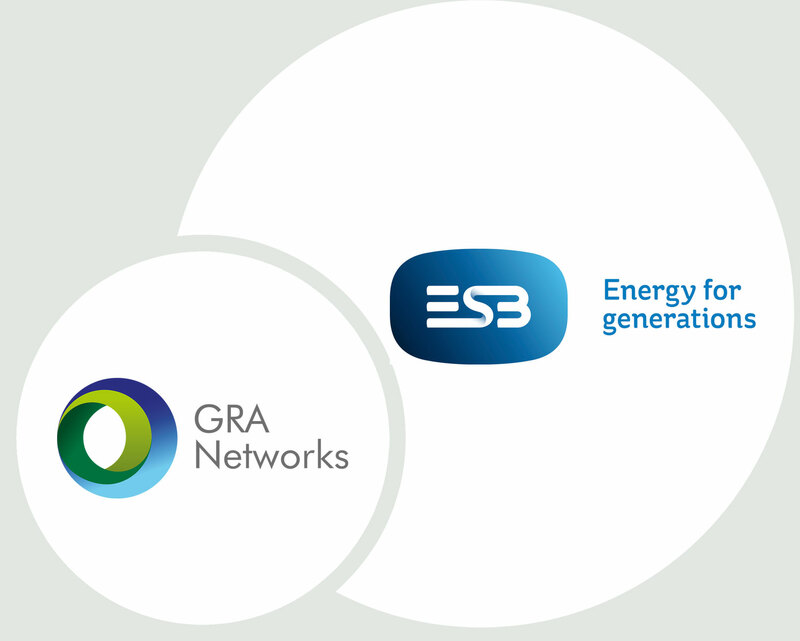 In addition, GRA Networks has worked as a supplier on various high profile projects in partnership with some of the most respected names in the telecoms, rail, construction and energy sectors. 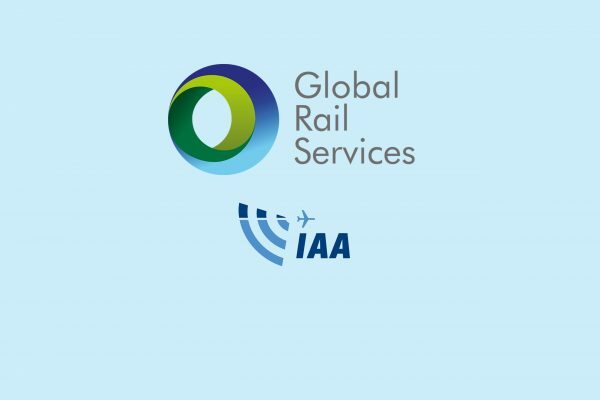 Global Rail Services has been awarded an exciting new contract on behalf of the Irish Aviation Authority for the design, supply and installation of an Antennae Mast together with all associated building works and site development works at their facility in Rosslare, Co. Wexford. 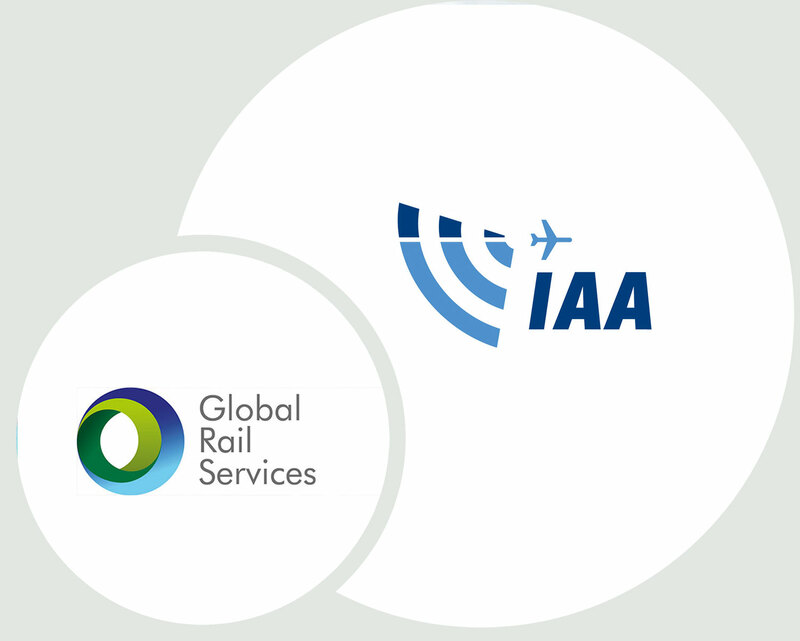 Global Rail Services will be working with their specialist subsidiary GRA Networks to deliver these works. GRA Networks is a full service telecommunications contractor and provides a comprehensive range of services from upgrading existing infrastructure, to building new mobile phone towers and other wireless network infrastructure. 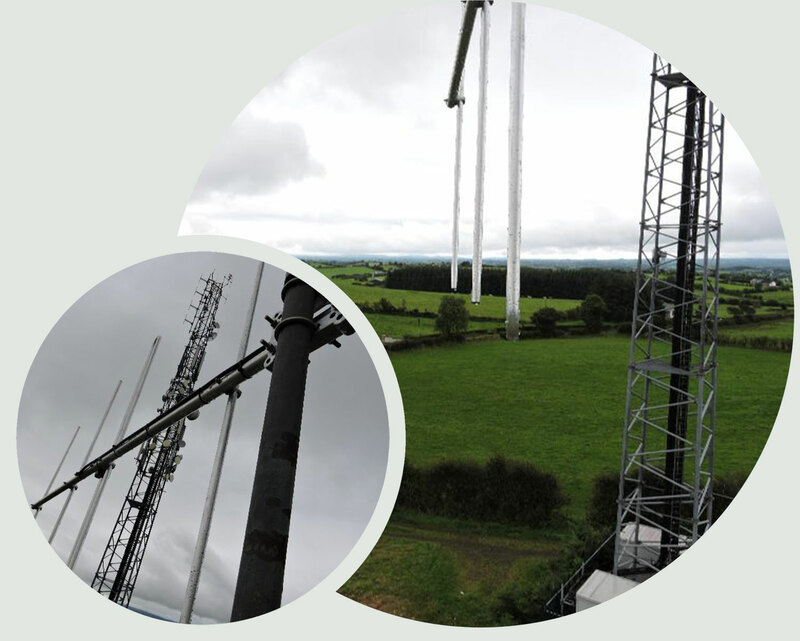 “Global Rail Services has a strong pedigree in the design and build of Antennae Masts throughout Ireland. Our experience working in highly regulated industries such as rail and transport infrastructure provides our clients with the necessary confidence to place contracts of this complexity with us. “Global Rail Services and our subsidiary GRA Networks are delivering on our promises throughout Ireland, including current mast installation contracts on behalf of Irish Rail. 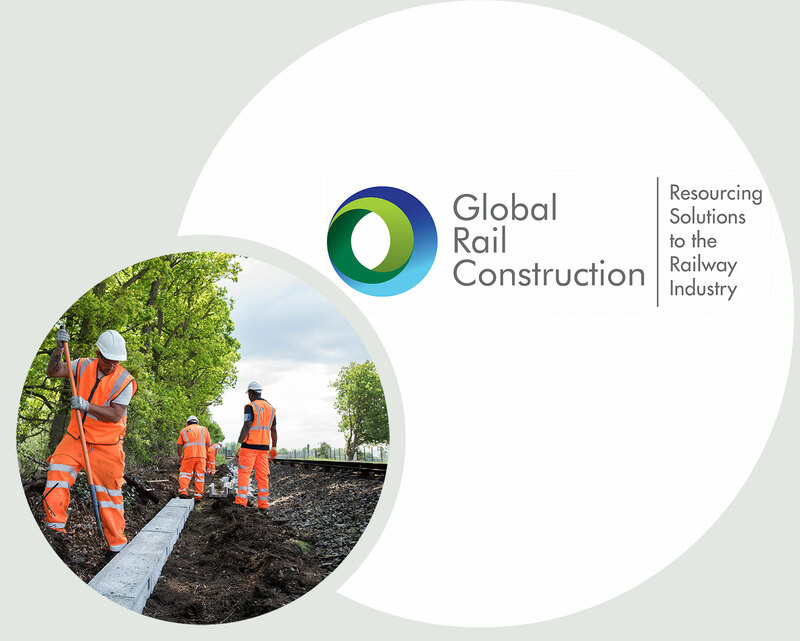 Global Rail Services is part of the Global Infrastructure Group of companies, who are an internationally focussed; leading specialist organisation, delivering civil engineering, signalling, telecoms, mechanical and electrical design and build solutions within a number of core industries. We are pleased to announce the successful installation of a 40m monopole at the Broombridge radio site, as part of our ongoing signalling, electricial and telecommunications works for the LUAS’s BXD project on behalf of Efacec Portugal. 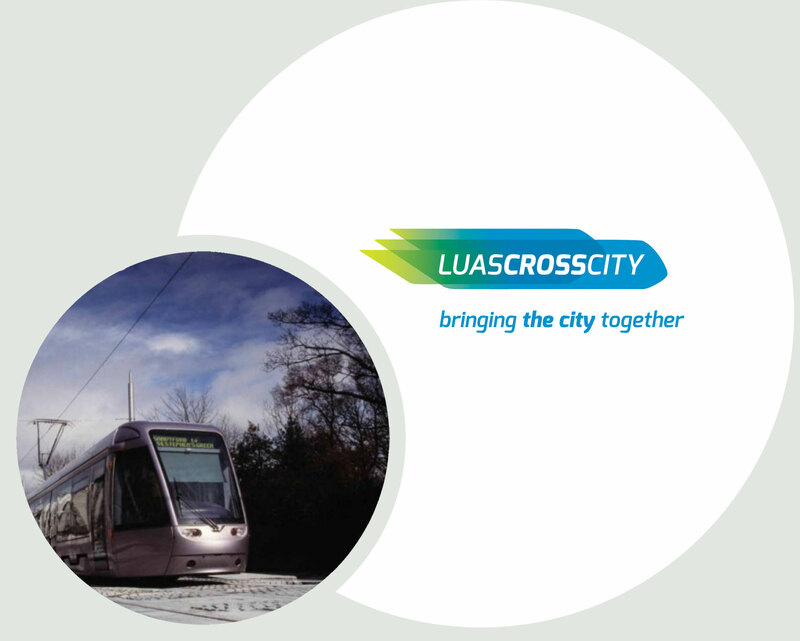 Luas Cross City is a new 5.6km light rail line that will run from Dublin city centre to Broombridge in the North West of the City. The main purpose of the new Radio Transmission system is to provide radio voice and data communication services that will extend the existing Motorola Dimetra IP TETRA network in order to provide coverage to the new LUAS BXD Line. 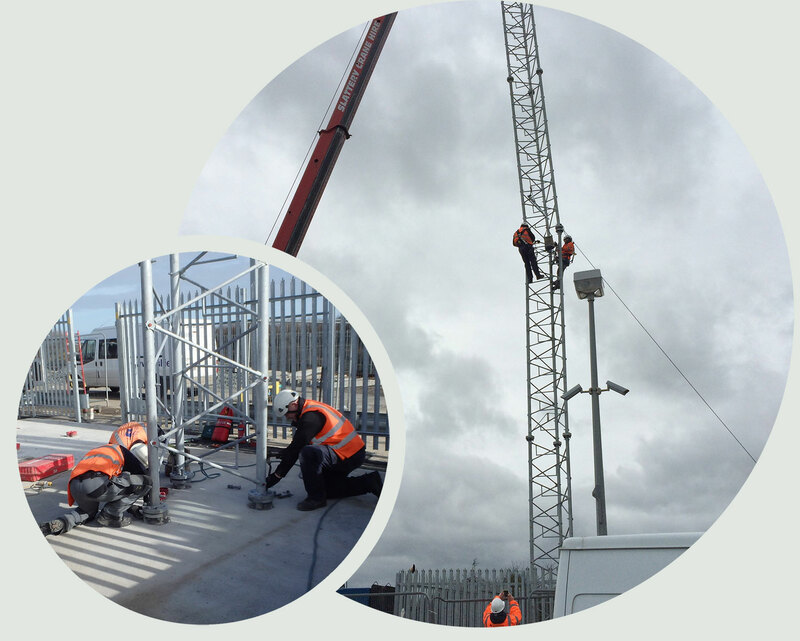 The specific scope, at Broombridge Depot, covered the installation of a new MTS Base Station and a 40m monopole to support the antennas of the MTS. The combined talent of Global Rail Services and GRA Networks – a division specifically formed to supply a more comprehensive delivery model in respect of Wireless Telecomms Services for major telecommunications projects and providers – fully managed the logistics in respect of the monopole components and carefully assembled them ready for the installation. The monopole works were completed on time and to the satisfaction of Efacec. The full LUAS project is due for completion at the end of the year. “Our partnership with Efacec continues to go from strength to strength. It is Global Rail Services ability to provide a fully managed and integrated service with our telecom division GRA Networks that really sets us apart. We look forward to further project milestones being achieved over the coming year”. 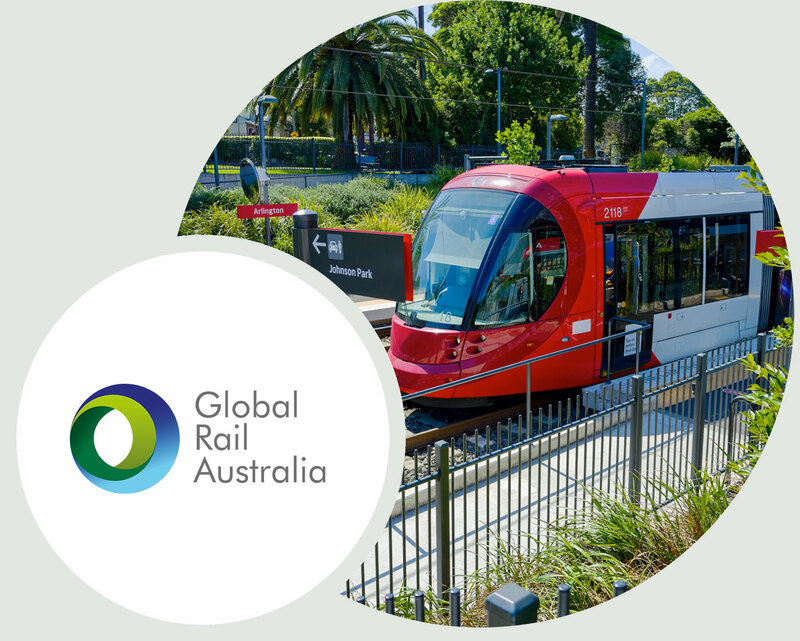 Global Rail Services is a rail infrastructure contractor operating on both mainline and light rail systems, with in-house capabilities across Civil Engineering, M&E, Building and Permanent Way. They offer a fully managed and cohesive service for their clients. GRA Networks is a leading provider of services to clients in the transportation, telecommunications, utilities and energy markets, providing either sector specific services or a fully managed turnkey solution. They specialise in the design, installation, commissioning and testing of critical infrastructure in both Ireland and Australia. We are very pleased to announce that Global Rail Australia has been awarded the rail signalling installation works on the Sydney Light Rail Project. The CBD and South East Light Rail is a new light rail network for Sydney. The 12km route will feature 19 stops, extending from Circular Quay along George Street to Central Station, through Surrey Hills to Moore Park, then to Kensington and Kinsgford via Anzac Parade and Randwick via Alison Road and High Street. Construction is due to be completed and services will start running in 2019. Global Rail Australia will be working with rail systems engineering giant Alstom on behalf of Transport for NSW, to help them in their mission of developing a safe, efficient, integrated transport system that keeps people moving, connects communities and shapes the future of our cities, centres and regions. The CBD and South East Light Rail will cost approximately $1.6 billion to complete, funded from the transport budget and a PPP arrangement. Construction on the project will take place in stages, with city streets closed in sections to minimise disruption to residents, businesses and commuters. Once completed, light rail will significantly benefit businesses along the route. Construction is likely to take between five and six years to complete. Global Rail Australia will also assist Alstom with final testing and commissioning works. “This is a significant signalling installation contact award for the company. Playing our part in Sydney’s transport regeneration plan, we are delighted to be involved in this major light rail infrastructure project. Global Rail Construction Limited (GRCL) has opened an office in Derby to facilitate a new core business offering around the supply of labour. The new strategically placed office will be used to meet external client demands for labour including safety critical personnel, as well as supporting GRCL’s own current and future rail projects in the Midlands and North of the UK. GRCL holds a Full Principal Contractors Licence and is a leading UK provider of design and build services to clients in the rail and transportation sector. With its head office in Hertfordshire, the company undertakes projects throughout the UK; the opening of the new midlands hub, on 3rd April 2017, allows project managers direct coverage of contracts across this region of the country. It is also a milestone for the company due to the city of Derby’s significance to the rail industry. The Roundhouse at Derby is the world’s first and oldest surviving railway roundhouse. It was originally developed in 1839 by four rival rail companies, including North Midland Railway (NMR) for whom George Stephenson and his son Robert were engineers. The Midland Railway became one of the country’s prominent railway companies with lines throughout Derbyshire, up to Carlisle in the North (including the country’s highest station at Dent) and to the south with its London terminus at spectacular St Pancras. From 1873, the Midland Railway Locomotive Works, known locally as “The Loco”, became a major manufacturer of locomotives and rolling stock units. When the railways were nationalized in 1947, the Derby works became part of the BR Workshops. GRCL’s new office in Derby is a signal of its growth and success across its rail infrastructure sectors of operation, which encompass civil and structural engineering, E&P, signalling and building works – as well as its new exciting labour supply arm. The company has a great track record of achievements across the country and is no stranger to the Midlands area, by virtue of its significant contribution to the East Notts Resignalling project, which was completed at the end of last year. 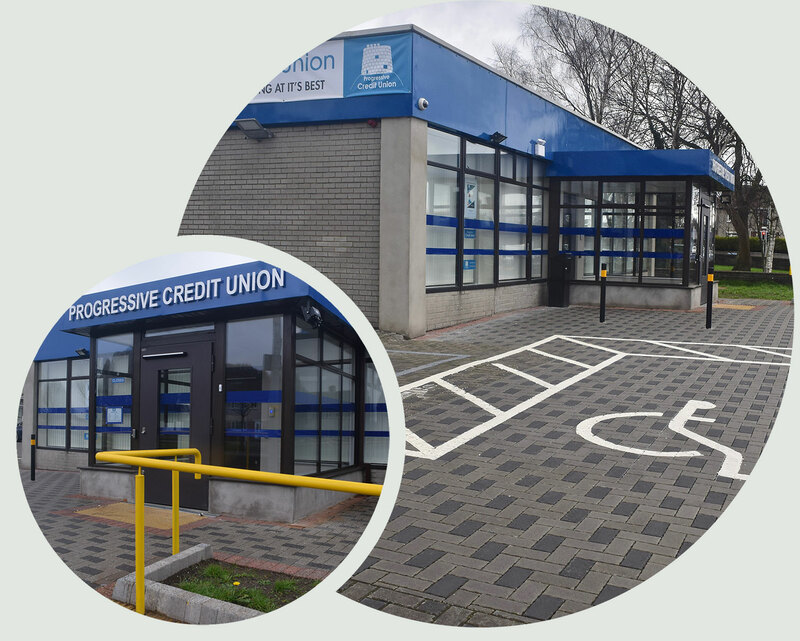 Global Rail Services is pleased to confirm that the building works at the Progressive Credit Union Building in Dublin has been successfully concluded. The refurbishment project involved constructing a new entrance to the front of the building together with enhancements for fire safety and disabled access to the external areas. Internally, further works were required to enhance the building for fire safety and disabled access together with improving the work environment and the long-term maintenance requirements of the building. The project required Global Rail Services to complete all works within a fully operational office environment. This required careful segregation of the works, a detailed schedule of planned activities and close liaison with the many stakeholders that use or come into contact with the building. Works were completed and handed over to a delighted client in March 2017. 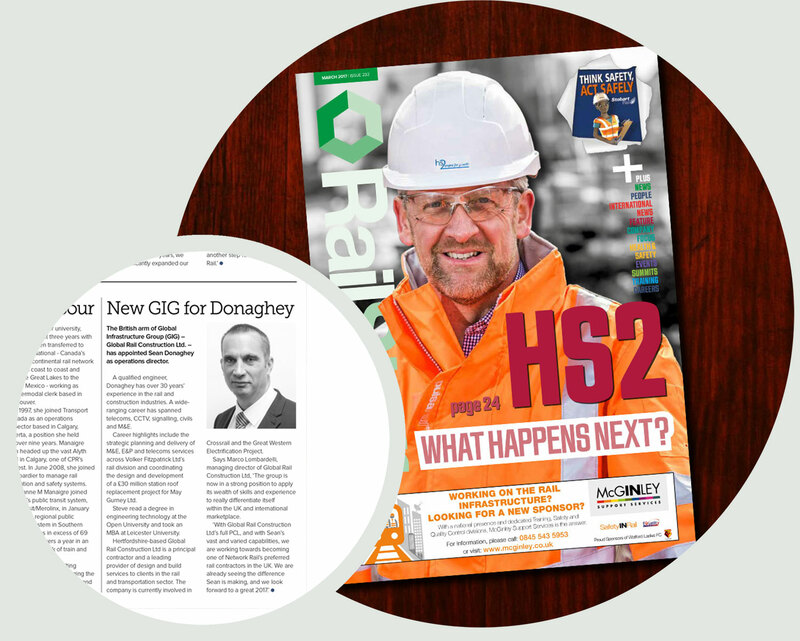 RailStaff magazine has publicised a feature on the recent appointment of Sean Donaghey at Global Rail Construction Ltd. The article, on page 10 of the publication, announces Sean’s role as Operations Director for the UK arm of the Global Infrastructure Group and goes into some detail about his 30-year, multi-disciplinary career. Sean has gained substantial operational experience of the rail, construction and power industries, working on high-profile projects including the design and development of the £30 million station roof replacement for May Gurney Ltd. 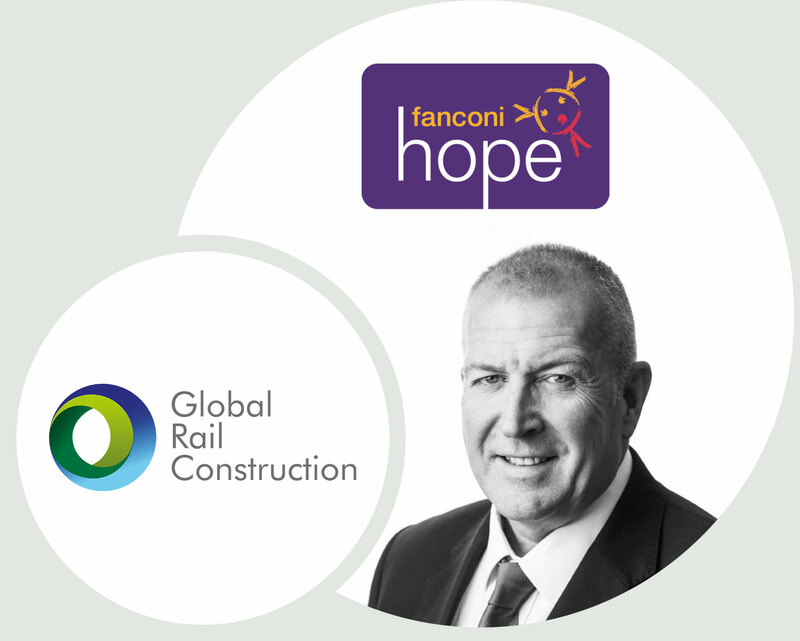 Global Rail Construction Ltd. was delighted to welcome Sean on board and was pleased that this significant appointment was featured in the rail industry’s leading ‘people’ publication. This coverage further promotes the growing presence of the wider Global Infrastructure Group, whose international operations cover the UK, Irish and Australian Rail, Transport and Infrastructure markets. 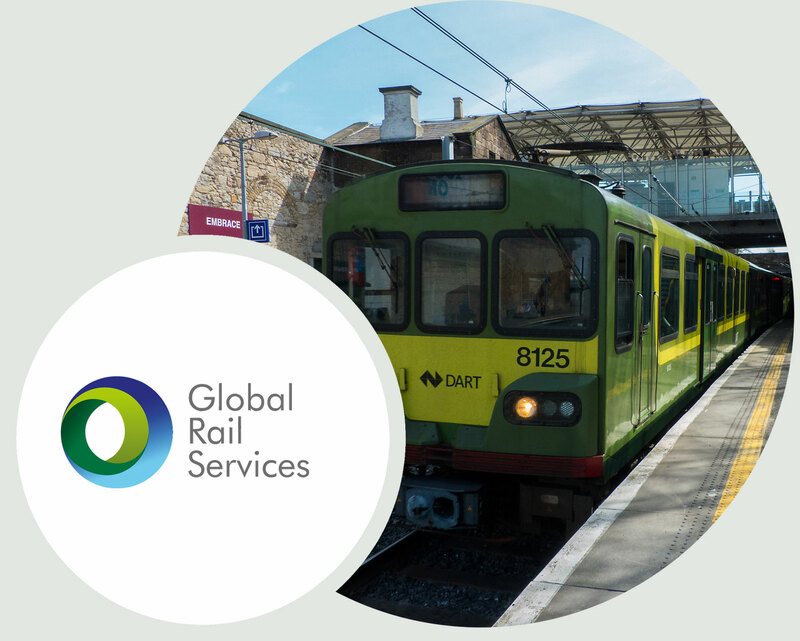 Global Rail Services, the Dublin based provider of multi-disciplined contracting services throughout Ireland, has just commenced GSM-R Package 2d. The overall objective of the project is to install telecoms towers and monopoles to facilitate the roll out of the GSM-R project Phase 2. Package 2d specifically relates to the eight remaining sites within the greater Dublin and North East Leinster areas. 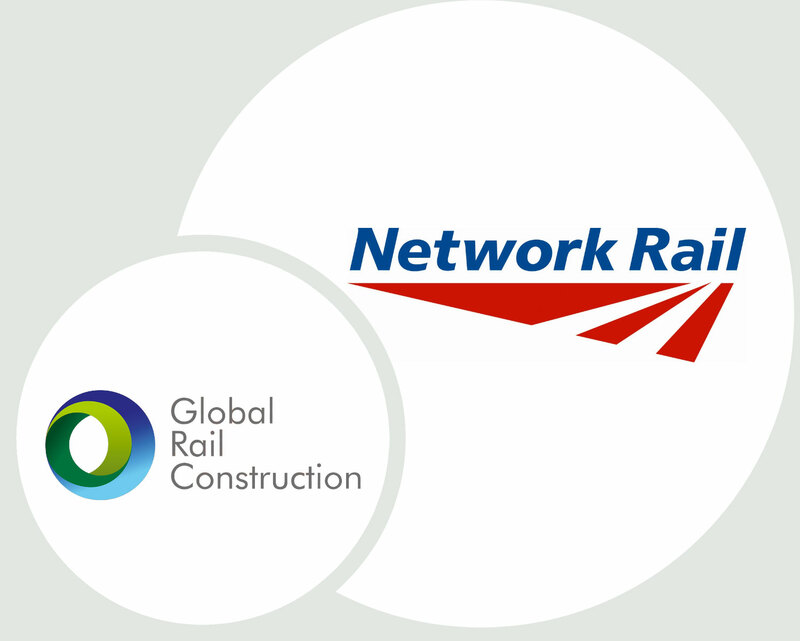 Global Rail Services is providing a fully project managed service for the complete Civil Engineering and Mechanical and Electrical scope of works, and is working closely with its sister company and telecoms specialist GRA Networks, to deliver the contract requirements. Crane lifts to install equipment shelter and tower sections. Works are due for completion late spring 2017. Global Rail Construction (GRCL) is pleased to announce that it has been awarded the next two signalling installation phases at Banbury Depot. 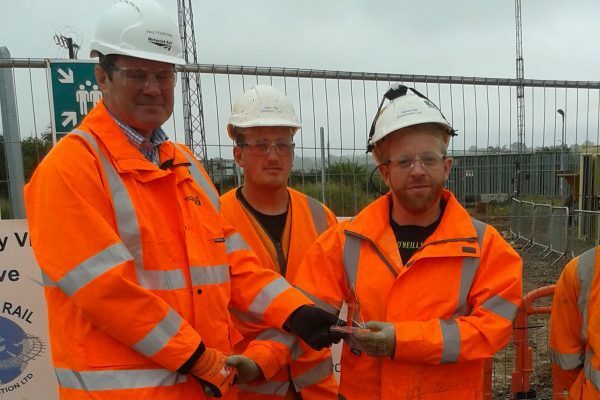 Having already successfully delivered the first phase of the signalling installation works at the depot and also been the first signalling organisation in the UK to install and commission a Tiefenbach points machine with associated back-drive – Global Rail Construction is delighted to secure further works. The full scope of works included the full installation and commissioning of four points machines, three B Switches, a brand new Control Panel, along with the associated and necessary cabling and wiring. 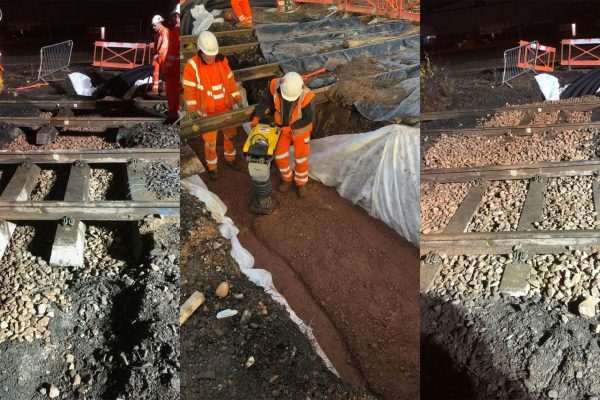 The previous works were undertaken during railway line blockages in the depot and required close and appropriate stakeholder engagement with the Banbury depot staff. With parts coming from Europe, logistics management was vital. Global Rail Construction even took to flying over to Germany to obtain the necessary materials to ensure timely delivery and completion of the signalling installation works. Working closely with design and testing partner Fenix Signalling, the project was commissioned on time. 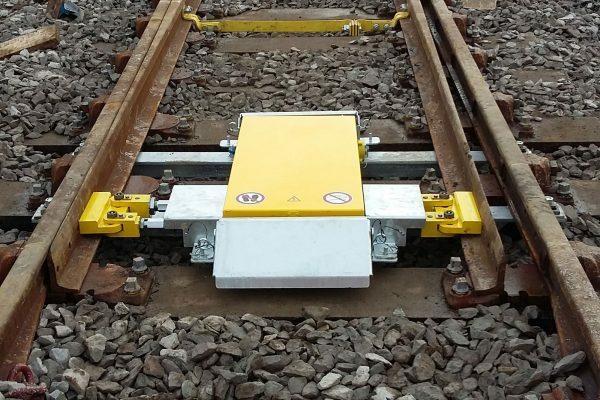 “Global Rail Construction has considerable experience in delivering complex turnkey railway signalling projects and has an extensive portfolio of successfully commissioned projects. 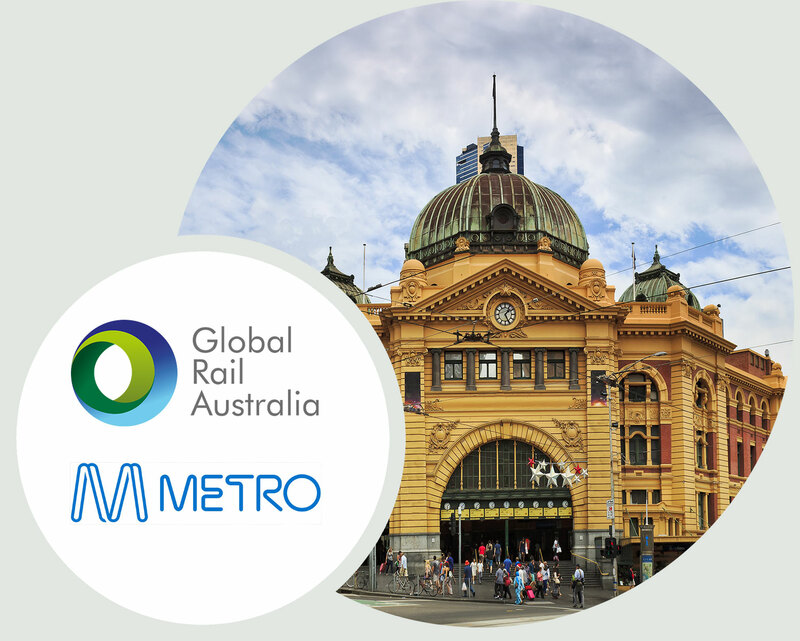 Global Rail Australia is delighted to announce the award of a minor services vendor panel agreement with Metro Trains Melbourne (MTM). This framework award follows two successful years of multi-disciplinary project delivery with MTM, including projects such as the MORN Platform Shelter Project and Caulfield Canopy Works where a positive testimonial was given by MTM for Global Rail Australia’s railway project management skills. 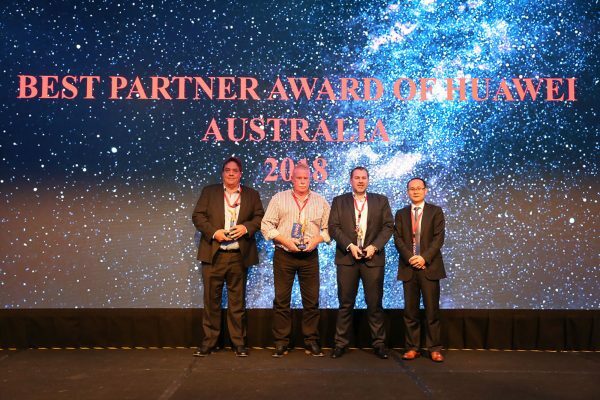 They also cited the high quality end product delivered, which culminated in Global Rail Australia delivering completed sites free of any defects. MTM is the operator of the Melbourne metropolitan rail network and operates a fleet of over 200 six-carriage trains running on a network consisting of 16 lines, more than 200 stations and over 800 kilometres of track. This framework will allow MTM to engage Melbourne based Global Rail Australia on a multitude of railway infrastructure works. “Global Rail Australia has proven experience in delivery of the most exacting projects across a diverse range of service sectors. Global Rail Services (GRSL), has just completed infrastructure works on behalf of ESB Networks, the electricity supplier that provides nearly 2.3 million customers throughout Ireland with a safe and efficient power supply. The purpose of the project was to provide a new ESB power connection to the new Courthouse in Drogheda. The works completed, under Global Rail Services national trenching and ducting framework, is part of ESB’s investment to the electricity network, increasing reliability and performance of the nation’s power network. 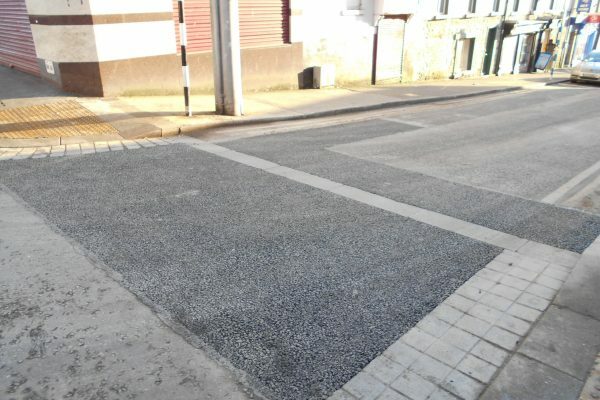 The specific works at Dominic Street in Drogheda, involved a huge amount of stakeholder interface and advance planning for GRSL and encompassed a series of road and pavement closures, traffic management, permits and licencing – all to the satisfaction of the ESB and Louth County Council, whilst the infrastructure contractor effectively managed both the public and its own direct labour workforce. The scope of works included the open cut excavation of a new power route through Dominic Street, Drogheda to a depth of nearly one metre below the existing road surface and the installation of 2 number 125mm ducts on a bed of sand. The ducts were then backfilled with lean mix concrete 75mm above the top of the duct and compacted. 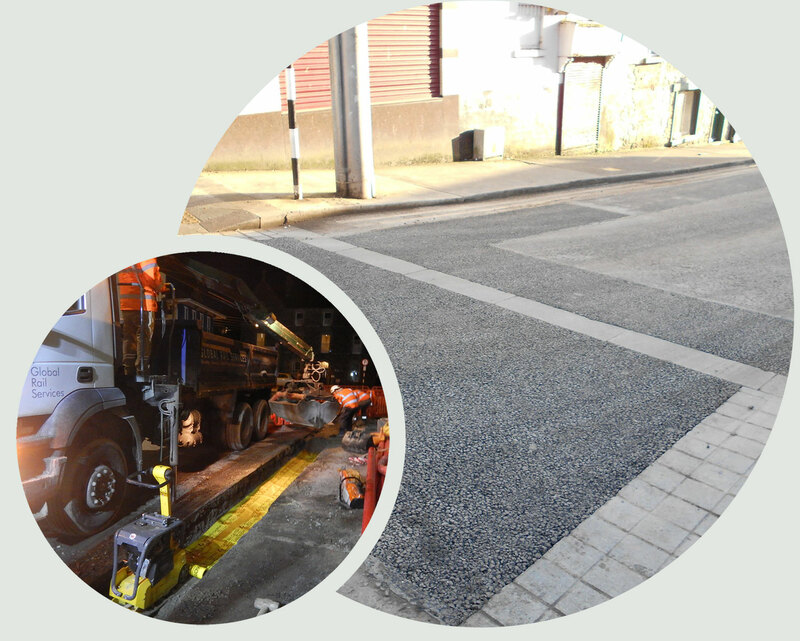 Following ESB’s cable installation, the trench and road surface was then permanently reinstated in accordance with the purple book and in compliance with the conditions set out in the road opening licence issued by Louth County Council. The project had tight deadlines and a narrow window of opportunity, which GRSL managed well to complete the project successfully. ESB were very satisfied with the works delivered and complemented the team for a job well done. Global Rail Services are pleased to announce that it has just secured the Roxboro House renovation project from Iarnród Éireann (Irish Rail). 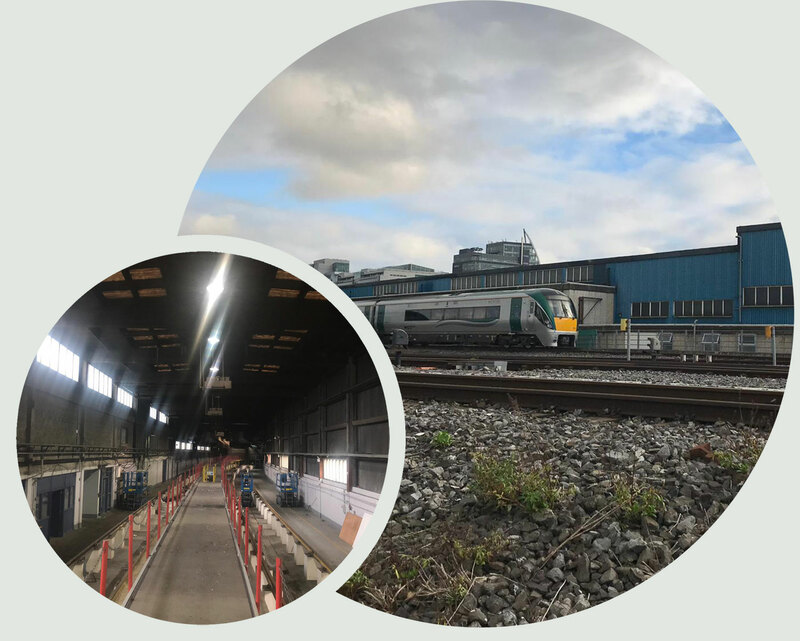 This prestigious multi-disciplinary building project, involves the specialist rail building contractor, fully refurbishing an existing two storey building, which is situated on the Iarnród Éireann (Irish Rail) railway works site to the north of Colbert Railway Station in Limerick City. The two-storey structure, houses generally office accommodation and is currently in use. Global Rail Services will have to manage the extensive works with care, as parts of the building will remain in use and will be occupied during the works. The works will be completed in three phases and include; demolition of the existing lobby, new internal walls, full M&E fit out, full office fit out, installation of new internal doors, fit out of new canteen, new external security doors, new uPVC triple glazed windows, new external insulation to be installed, new roof construction, repairs to existing roof and chimney, new foul and surface water drainage connections, new SVP’s, RWP’s and gutters, full internal and external painting and new external lighting and a CCTV system. 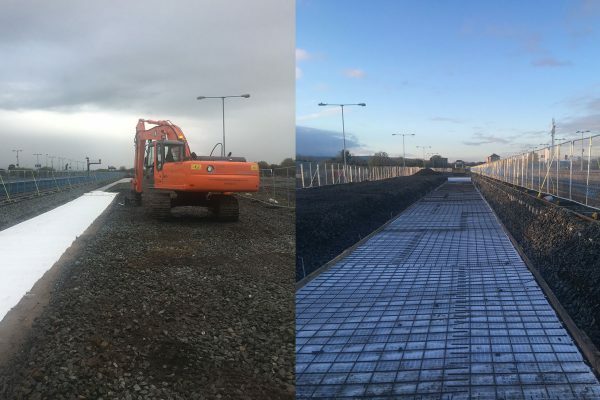 Rail infrastructure contractor Global Rail Services, is progressing well with accessibility works at three railway stations on behalf of Irish Rail, having been awarded the project in August 2016. 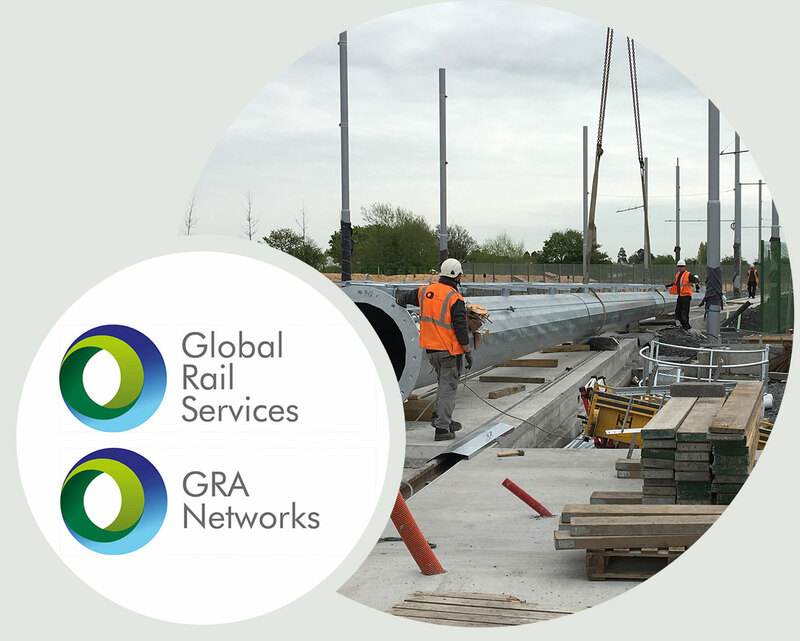 Customers at Rathdrum, Mullinger and Leixlip Louisa Bridge Stations will soon be benefiting from Global Rail Services’ extensive experience in delivering construction solutions that enhance and improve their passenger experience. The project is well on its way to completion, with key project milestones being consistently met and a high quality end product to match, Global Rail Services is certainly hitting the right notes in terms of managing and delivering the full suite of stakeholder expectations. The works include complex in-situ civil engineering works, temporary works, roads and pavings, as well as rail engineering activities in respect of upgrading station platforms and railway pedestrian access. The Group used its full infrastructure contracting experience to manage and deliver the interface between the highway and railway authorities. The works are due to be completed in a phased manner, with a final completion date in February 2017. 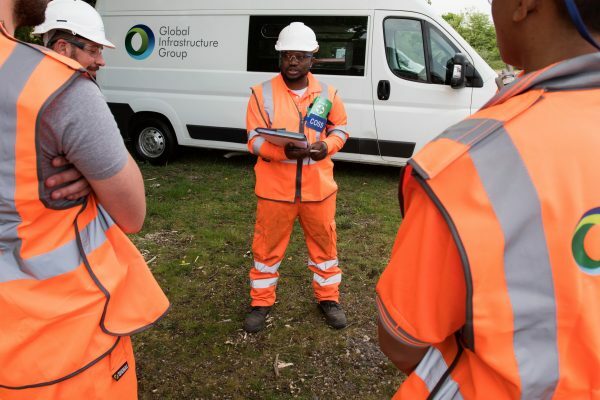 To ensure that each milestone is achieved, Global Rail Services has prepared detailed programmes and schedules, providing a dedicated and co-ordinated approach to project management throughout the works. Liaison with myriad stakeholders, along with a collaborative approach to these works, have paved the way for a professional delivery that is meeting and exceeding expectations. Procurement of long lead items and contract approvals has formed an integral part of the project success to date. Global Rail Services has used its rail engineering experience in delivering multi-disciplinary rail works to manage these proactively, to the delight of the client. 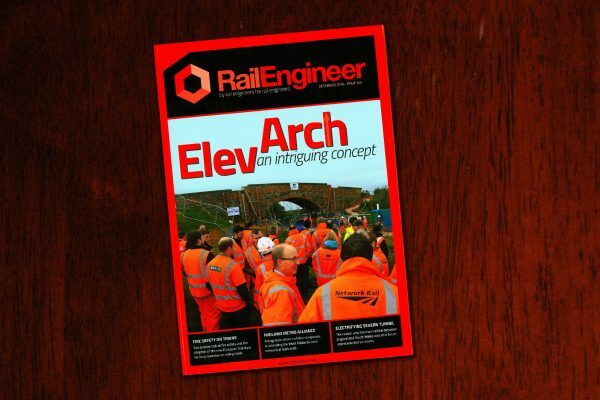 We are delighted to report that much of our great project work has been summarised as part of a double page spread in December’s edition of Rail Engineer magazine. 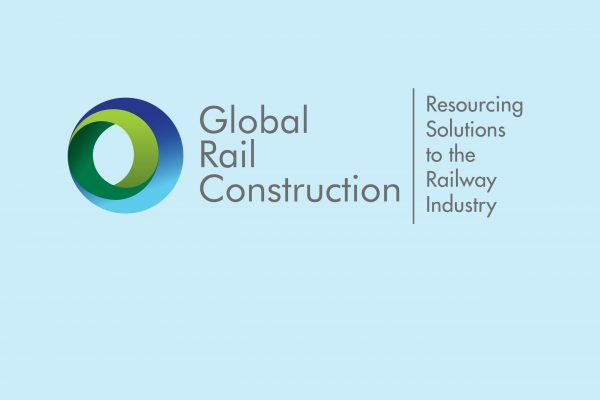 Global Rail Construction Ltd. (GRCL) is part of the Global Infrastructure Group and is a leading UK provider of design and build services to clients in the rail and transportation sector. The company is a principal contractor for UK mainline and metro railways across a number of disciplines, which include signalling, mechanical, electrical and power (MEP), civil and structural engineering, maintenance, renewal, and provides a fully tested and commissioned service, on both Network Rail and Transport for London controlled infrastructure. Offering either sector-specific services, or a fully managed turnkey solution across a range of activities including project management, construction and civil engineering design, Global Rail Construction specialises in the design, installation, commissioning and testing of railway critical infrastructure. 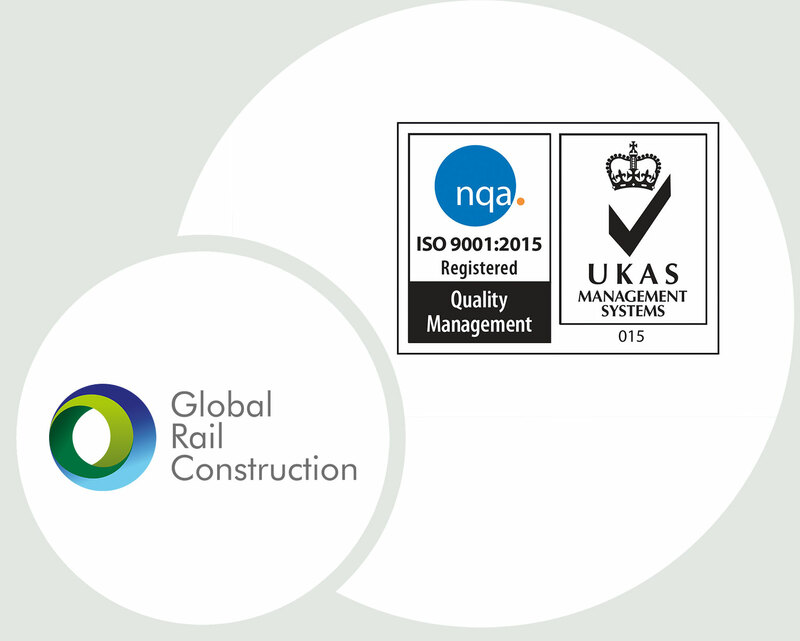 Global Rail Construction’s in house expertise and flexible management approach, based on decades of engineering and delivering solutions has resulted in us providing an award-winning service. 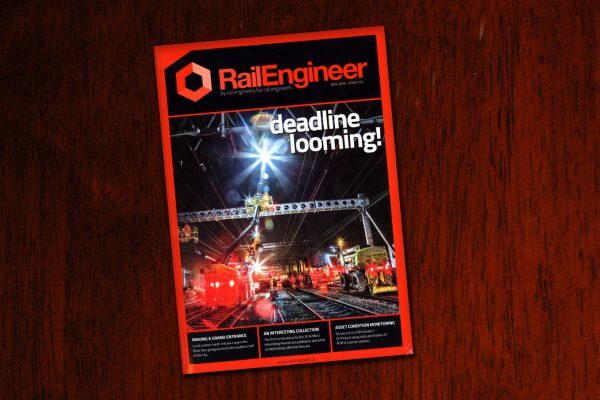 Global Rail Construction is currently delivering a range of electrification and re-signalling projects for a variety of clients from rail network operators through to major infrastructure organisations, and we are proud that our great UK-wide rail work is being recognised by the specialist media. 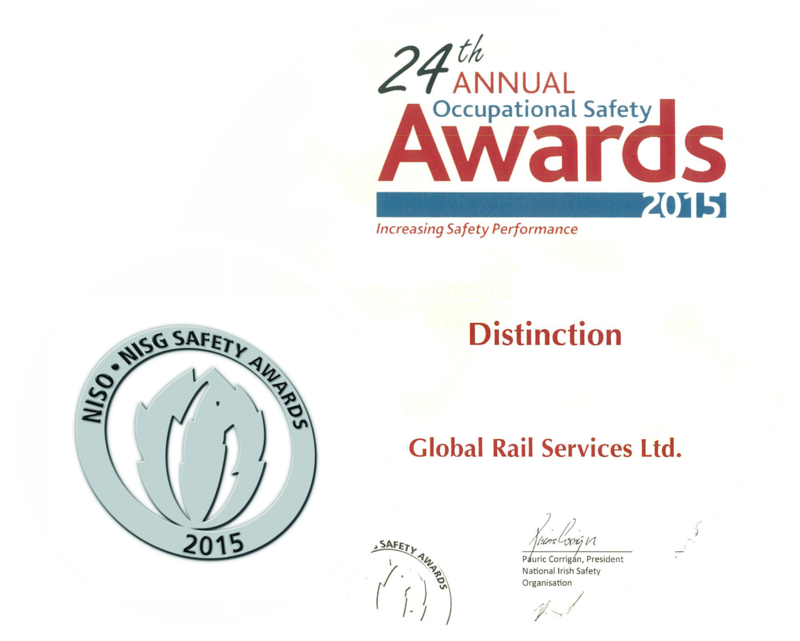 Global Rail Services is delighted to announce a second consecutive award of distinction for its positive impact to health, safety and wellbeing practices from the National Irish Safety Organisation (NISO). 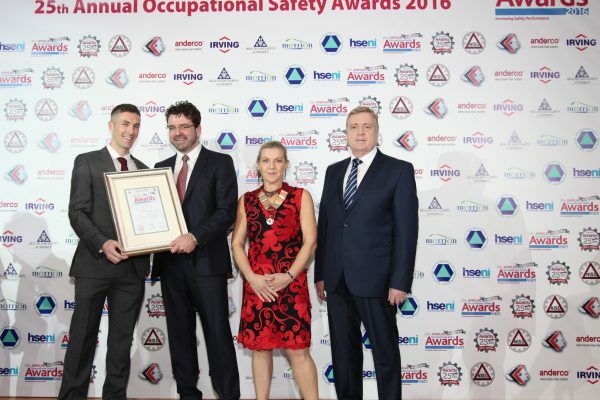 The National Irish Safety Organisation Limited (NISO) was set up to promote Irish workplaces as being among the safest and healthiest in Europe, and rewards excellence in workplace health and safety. 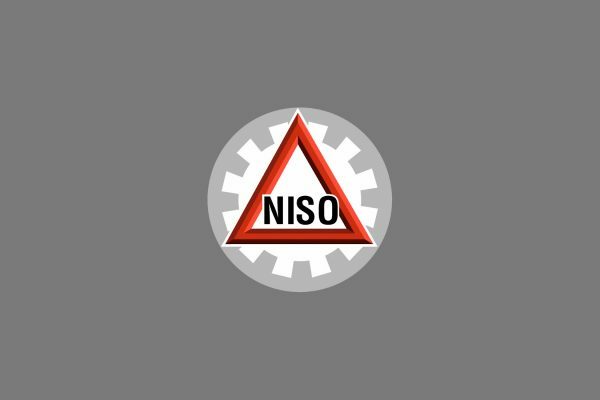 By promoting a safety culture through a series of events such as the All Ireland Safety Awards, NISO is able to credit those organisations which make a positive impact on the lives of their workers and the stakeholders they engage with. “The health and well-being of our workforce is central to our approach. We work continuously to improve our occupational health and safety management, which is fully accredited to the requirements of OHSAS 18001:2007. 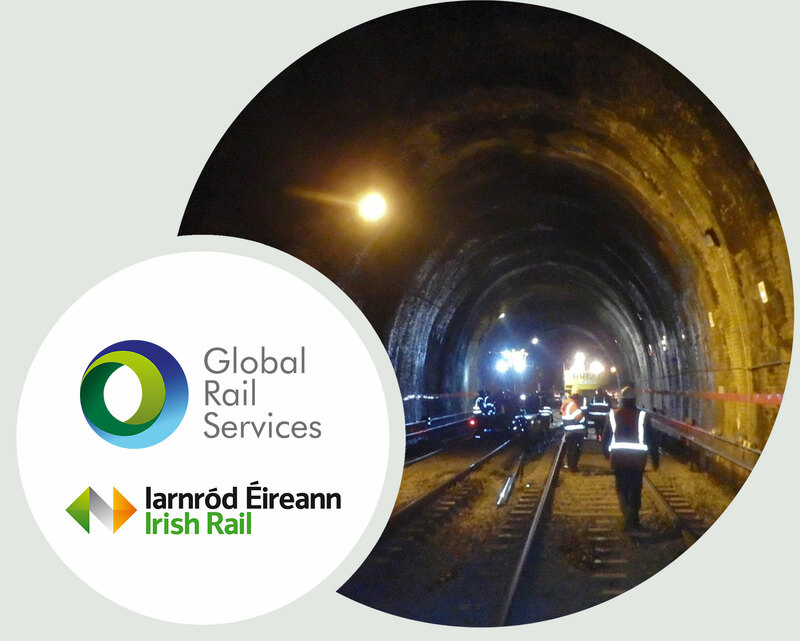 Irish Rail Infrastructure Contractor, Global Rail Services Ltd. (GRSL), has successfully completed its project works on behalf of Irish Rail. 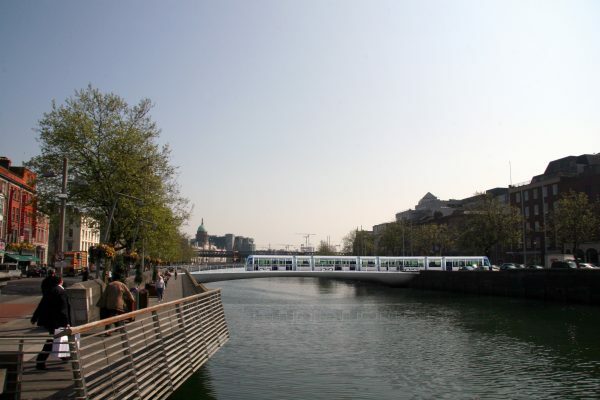 The large multi-disciplinary project – which was commissioned by the National Transport Authority – was part of providing a fourth direct route into Dublin city centre via Heuston Station. 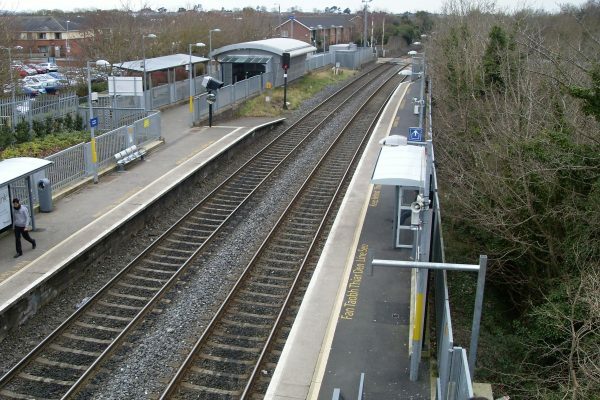 It involved upgrading a branch line serving as a direct connection to the Kildare commuter areas, both North and South of the city. GRSL works as part of the upgrade of the 735m long tunnel will now allow commuter trains to operate through it for the first time, and will improve the congestion around Kildare. The project was reliant upon GRSL’s multi-disciplinary in-house approach. Works in the tunnel include not only cleaning and repairing the masonry, but providing new signage, new lighting and new telecoms. 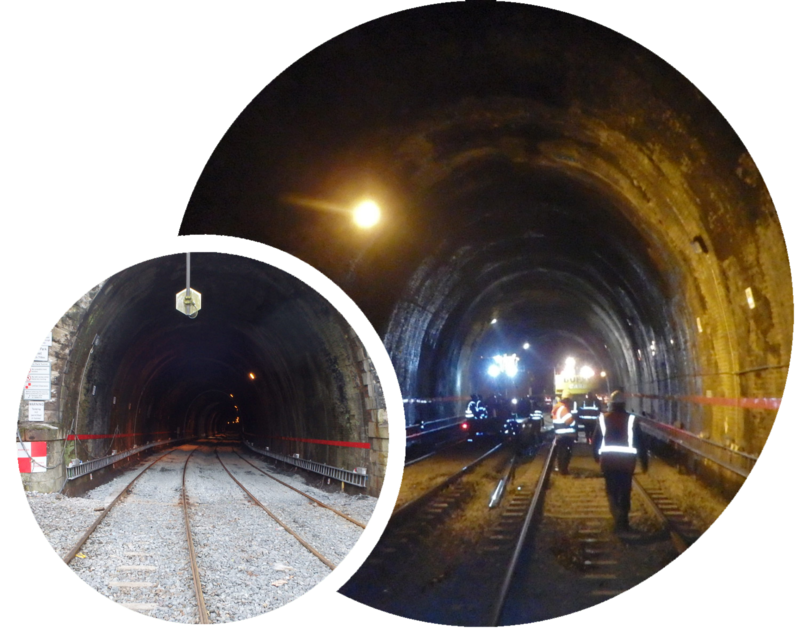 Separately, GRSL carried out site investigation works on the existing steep embankments leading to the tunnel. 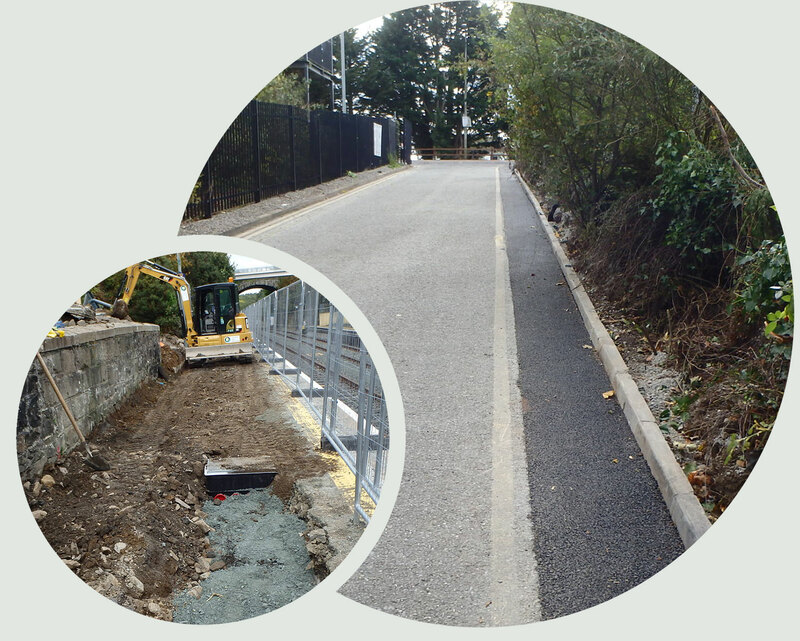 The project examined the stability of the existing embankments and recommended stabilising works required for the reopening to commuter usage. GRSL’s building division upgraded both Drumcondra and Tara Street stations; this included the creation of new ticket gatelines and a new lift shaft. “The challenges of working around a live railway environment have been met head-on by our professional project management team. “Meticulous planning and the experience needed working in a multi-stakeholder rail environment sets Global Rail Services apart. 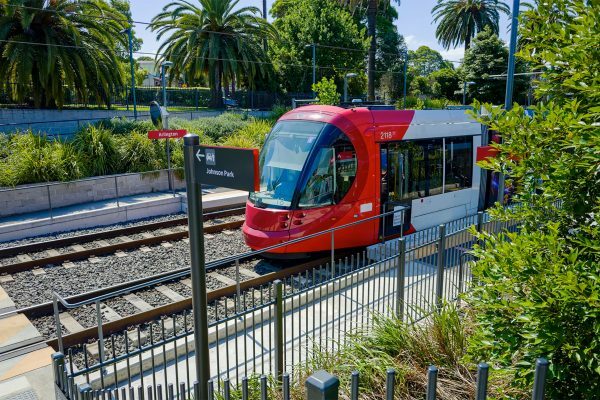 Global Rail Australia has been awarded a new contract with Metro Trains Melbourne (MTM) which involves the upgrade of the remote public address (RPA) systems on the Broadmeadows line as part of the PRIDE Local Hardware Upgrade Project. PRIDE (Passenger Real-time Information Dissemination Equipment) is an electronic timetable and announcement system consisting of the control system (Metrol), control stations, public address systems, PRIDE ‘talking boxes’ situated on each platform, and electronic information displays. to ensure the system is maintenance-friendly. Melbourne Trains Australia (MTM), known locally as ‘Metro’, operates a fleet of 407 three-car train sets on 837 kilometres (520 mi) of track. There are sixteen regular service train lines and one special events train line. The train fleet travels over 30 million kilometres (19,000,000 mi) and provides more than 228 million customer boardings each year, over 14,000 services each week and carries over 415,000 passengers each weekday. This project will see Global Rail Australia upgrading the existing remote public address system at 15 stations on the Broadmeadows line. The work commenced in November and is due to be completed in early December. Global Rail Australia Pty Ltd is part of the Global Infrastructure Group and is a leading Australian provider of design, construct and commission services for clients across a wide range of engineering and infrastructure industries including Mainline, Metro and Light Rail Systems and Utilities. This is the latest in a long line of projects undertaken for MTM. Global Rail Australia Pty Ltd. is moving though the gears, as the company works towards final completion of its contract at Caulfield Railway Station on behalf of MTM. The project, which is being cleverly phased in two sections, so as to minimise disruption – North and the South – is on target for its completion date later next month. The complexity of the project while working on a live station is illustrated through the multiple daily interfaces, including: electrical power lines and train power lines (OHLE), numerous service and utility providers, as well as local councils, passengers, road users, station staff and the local university campus. This has seen Global Rail Australia demonstrate its expertise in the safe management of stakeholders while executing works in a live railway environment. 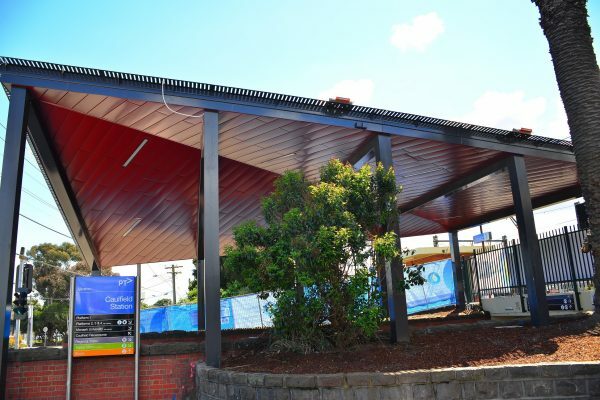 The works, which form part of the (Aus) $100m upgrade of the Frankston railway line, include the extension to the existing canopy coverage on Platform 1 and 4, and are progressing well, with the Southside works now complete. Global Rail Australia is fully responsible for the planning, supply, fabrication and installation of all the station works, which will significantly improve the commuter experience. 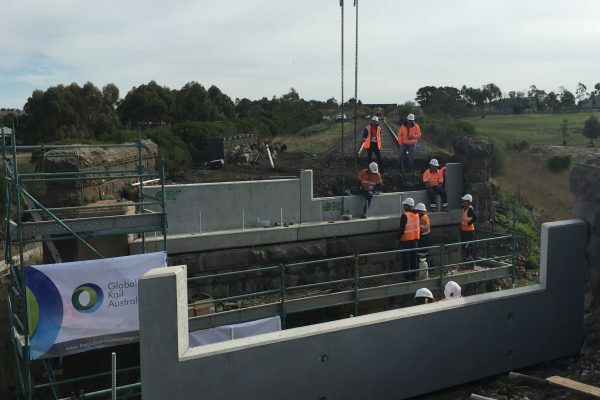 “As a preferred supplier to Metro Trains Melbourne, Global Rail Australia has hit the ground running with this complex railway construction project. The project, which involves multi-disciplinary activities in a live station environment, is being delivered to the highest quality and has a blemish free record to date. Global Rail Australia is part of the Global Infrastructure Group and is a leading Australian provider of design, construction and commissioning services for clients across a wide range of engineering and infrastructure industries. The company was selected as the preferred contractor on this project for its in-house capabilities, scale and supply chain partnerships. 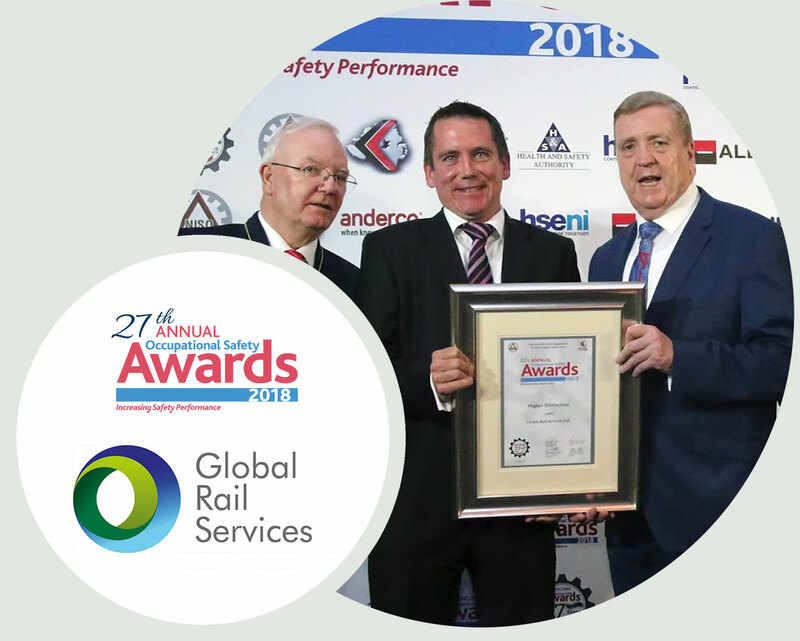 Global Rail Services is a long term M&E framework partner to Irish Rail and this new project award evidences the high regard for the quality of Global Rail Services work over several years. Global Rail Services are registered with the authorised Electrical Safety Supervisory Body (ESSB) and they are also certified and compliant with both The Energy Act 2006 and the Commission of Energy Regulation (CER). The Dublin based business, is also an RGI registered mechanical installer. “This continues to cement Global Rail Services as one of Irish Rail’s preferred M&E specialists. “We have a full compliment of staff to tackle the most complex of projects, either as stand alone projects or as part of a wider multi-disciplnary offering. 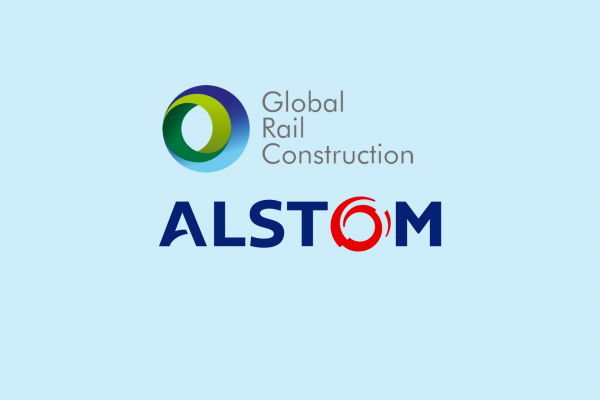 UK Rail Infrastructure Contractor – Global Rail Construction Ltd (GRCL) – are pleased to confirm the award of their first project for the Alstom Babcock Costain (ABC) Electrification Ltd joint venture. 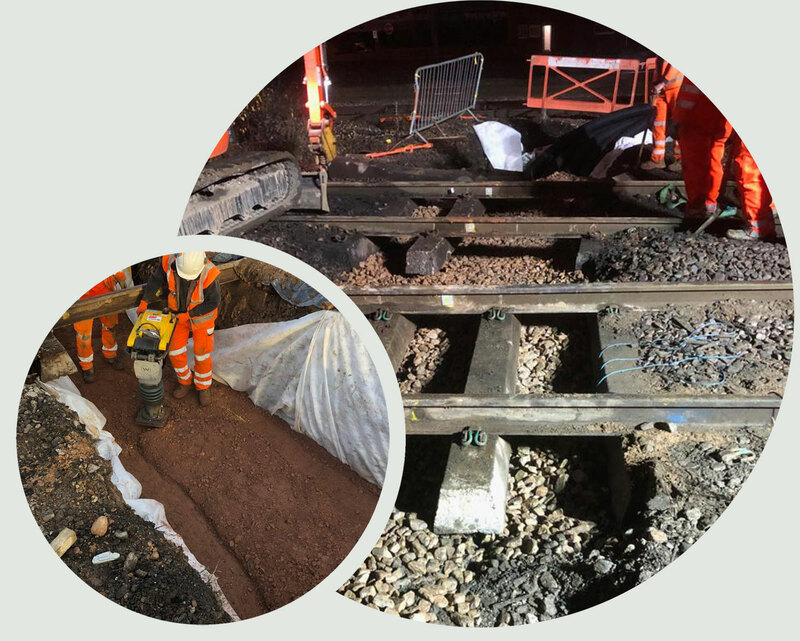 The project at Barnt Green – part of the Midland Mainline electrification works – comprises civil engineering works to provide and install new ducting through the station platforms, including the subsequent remedial works to the platforms to bring them back into full service. ABC as one of the largest electrification businesses in Europe, secured two significant UK Frameworks in 2014 covering Network Rail routes in Central (LNW South) and Western and Wales, which include a number of significant UK programmes to provide and upgrade electrification to the Valley Lines, Great Western Rail Modification (GWRM) and Bristol Patchway to Swansea routes over a seven year period. Electrifying key UK rail routes will mean faster, greener, quieter and more reliable journeys for thousands of passengers. More seats than diesel trains and superior performance will give journey-time savings. 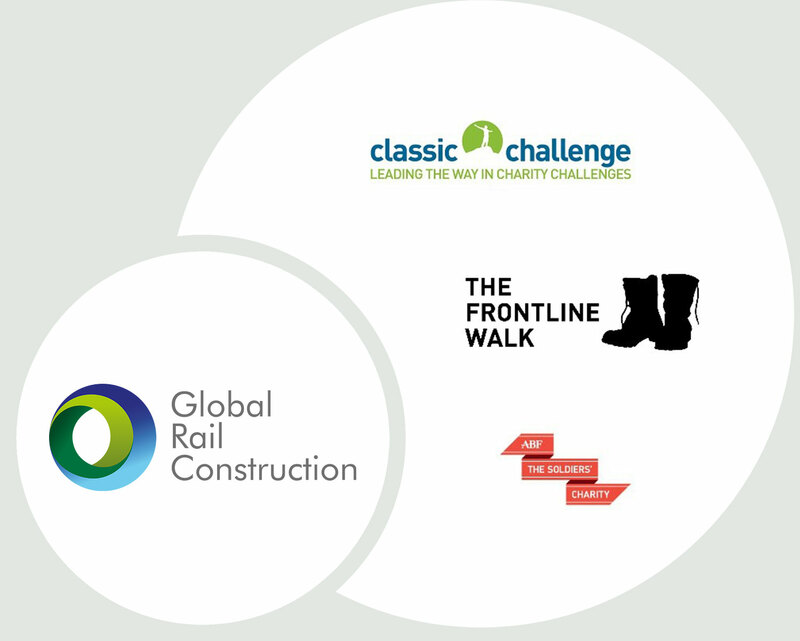 ABC was formed in 2012 to support Network Rail in meeting these challenges. The works involve detailed planning and co-ordination of works activities, of which GRCL will combine their engineering and delivery expertise, to meet the requirements of this complex, multi-faceted scheme, which demands experience and know-how. GRCL are delighted to have the opportunity to work with a client of such size and industry standing and look forward to effectively delivering these works. 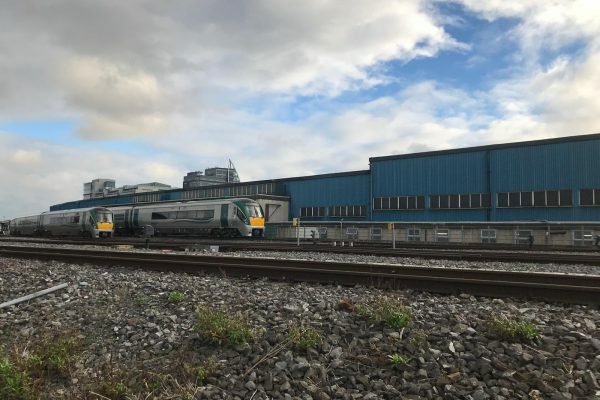 Global Rail Services, the Irish infrastructure-contracting arm of the Global Infrastructure Group, are on track with their civil engineering and building works for Irish Rail. 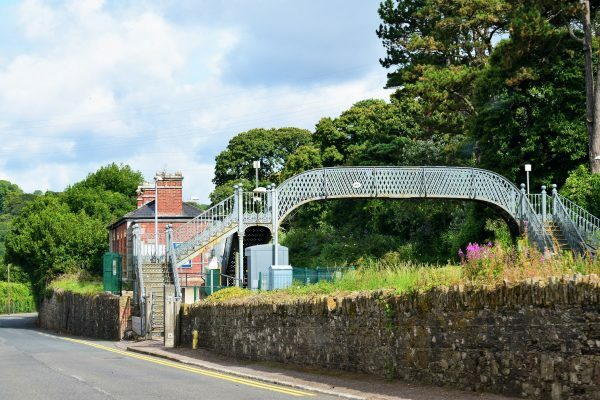 The major improvement works at three stations – on the Dublin to Rosslare lines at Rathdrum and the Dublin to Sligo lines at Mullingar and Lexilip Louisa Bridge – will further enhance the passenger experience for commuters. 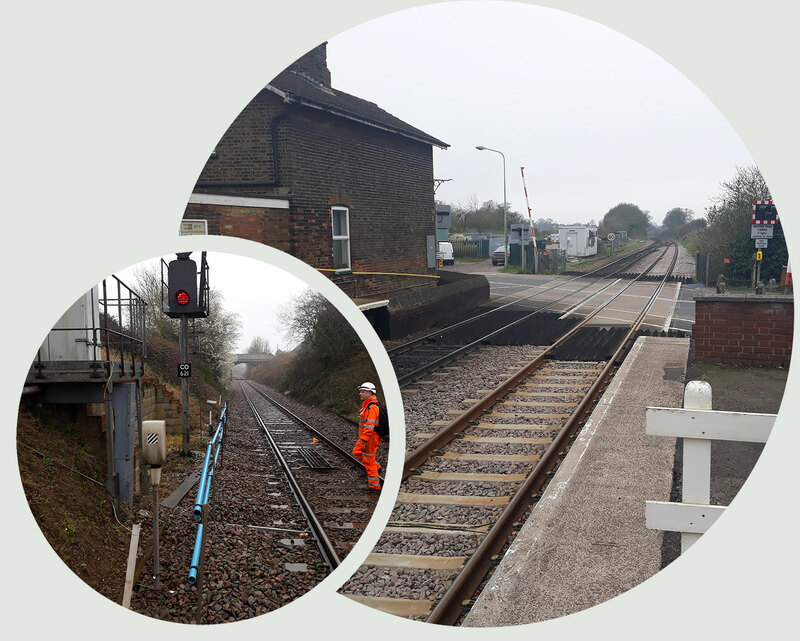 The scope of works include the installation of new footpaths, footbridges, widening of road entrances, new kerbs and ramps, upgrading of handrails, new lighting columns, ducting and chambers, new signage and platform reinstatement works including new platform markings. Global Rail Services are working with long-term client Irish Rail, to further improve and enhance the accessibility in and around the stations. The team is meeting daily challenges, as the works are being completed in a fully operational station environment. Global Rail Services as an experienced railway contractor are meeting these head-on and delivering a fully co-ordinated programme of activities that keep disruption to the absolute minimum. Mitigation measures include, separating the access areas from work areas with temporary partitions to protect members of the public from materials and equipment. The three concurrent sites are currently on schedule for their completion date later this year. 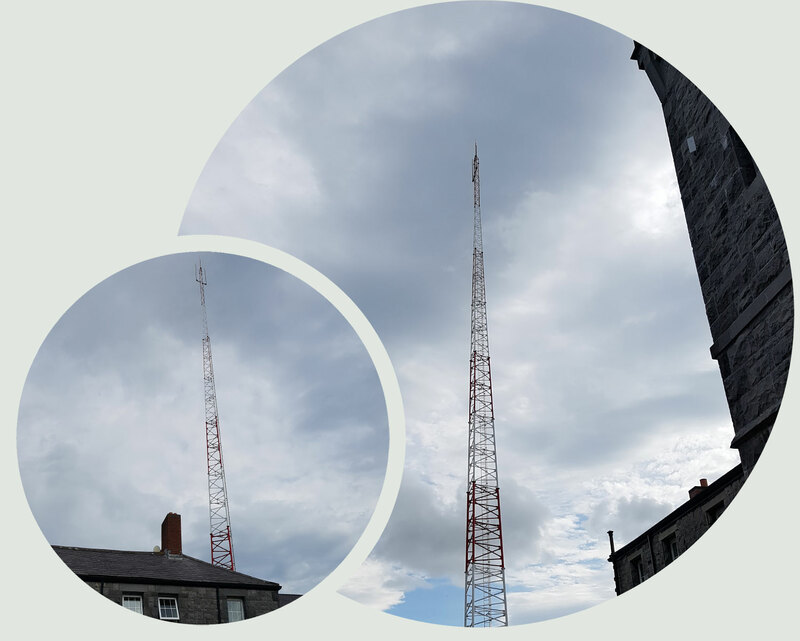 GRA Networks, the telecommunications specialist based in Ireland and Australia are pleased to annouce the successful completion of our antenna installation work on behalf of Newstalk Radio. The station which brings an exclusive talk based format sharing the best in opinions, analysis, entertainment and sport, had previously shared its transmission with Ireland’s national television and radio broadcaster RTE, however, approached GRA Networks to create an independent operation. 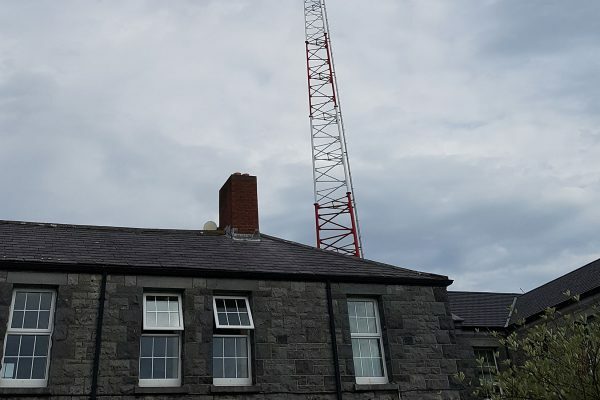 The scope of works involved the installation of Skymast S.4Y Yagi antennas and the running of EC400 10mm Coax cable from each antenna to comms rooms across eleven separate sites throughout Ireland – from Achill Island to Holywell Hill, Donegal – all within a two week deadline. Due to the tight timeframe and the need to provide seemless intergration from the old to the new to maintain a fully operational radio news service, GRA Networks colloborated closely with Newstalk, who accompanied GRA Networks each day, to ensure the swap over from the old system to the new system was undertaken with minimal impact to them. Newstalk were very complimentary with regard to the progress and work practice that GRA Networks’ crew displayed and sent their thanks to the team for completing the project on time. “We are very pleased to have completed these works successfully. The UK arm of the Global Infrastructure Group – Global Rail Construction Ltd – is pleased to announce that it has secured the civils package associated with the construction on 2No Sub-Stations as part of the Reading 10-Car Upgrade works, which form part of Network Rail’s wider £38bn investment through to 2019. The project supports the delivery of the High Level Output Specification (HLOS) capacity metric for London Waterloo, which indicates that it is necessary to provide capacity to accommodate an additional demand of 9,700 passengers in the three-hour morning peak. 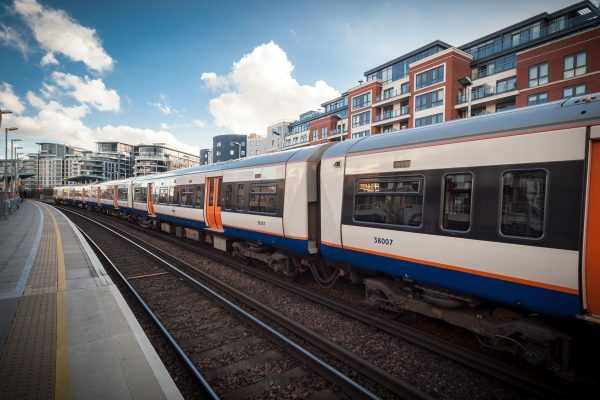 Global Rail Construction will supply traction power supply infrastructure to enable the operation of 10 car services on the Reading to London Waterloo and Aldershot via Ascot to London Waterloo routes. This will relieve overcrowding, particularly between Virginia Water and London Waterloo in the morning peak. The project will have major interfaces with the Reading and Ascot to London Waterloo Train Lengthening, which is carrying out work in the same area over the same timescales, the Feltham re-signalling project, a project that Global Rail Construction are currently delivering significant works for and, the Wessex capacity programme, which could overlap with possession requirements. The delivery of the significant capital investment on the Wessex Route in CP5 is complex; therefore an integrated programme between stakeholders will be produced, to manage the interfaces between various projects. The works commence in September 2016 and will run through to January 2017 and are contracted through HVMS – Network Rail’s current E&P framework contractor for the Southern Region. “The Wessex area has seen us delivering on many important Network Rail enhancements such as ASDO and Feltham Resignalling and this win is reward for our outstanding delivery record. “Our estimating team under the direction of Don Osborn, delivered another compelling bid and as a board, we are grateful for the efforts of the whole tendering team”. 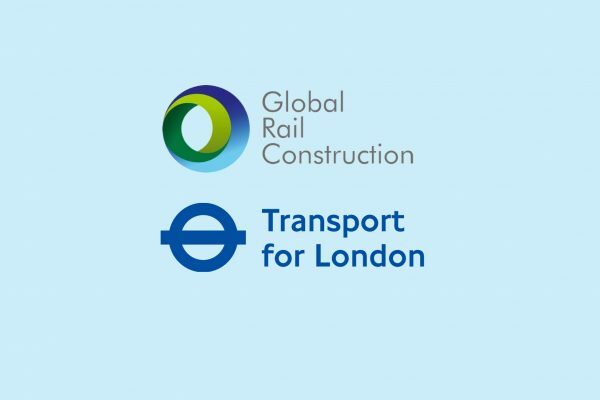 Global Rail Construction Ltd, the UK rail infrastructure contractor, has secured Lot 4 on behalf of Transport for London (TfL), a contract which forms part of its five-year Station Works Improvement Programme (SWIP). The company is a principal contractor for UK mainline and metro railways across a number of disciplines, which include signalling, mechanical, electrical and power (MEP), telecoms, civil and structural engineering, maintenance, renewal and provides a fully tested and commissioned service on both Network Rail and TfL controlled infrastructure. 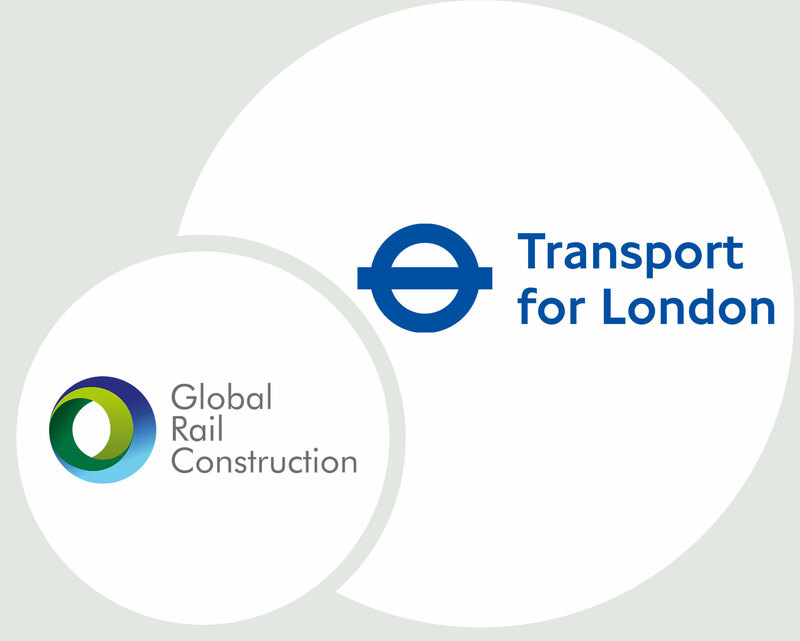 This represents the third success for Global Rail Construction from four lots tendered for, in conjunction with TfL’s proposed £330m stations upgrade programme framework, which will bring improvements to over seventy stations on TfL’s infrastructure. “Being able to offer either sector-specific services or a fully managed turnkey solution across a range of activities, including project management, allows Global Rail Construction to specialise in the design, installation, commissioning and testing of railway critical infrastructure. “Global Rail Construction’s in-house expertise and flexible management approach, based on decades of engineering and delivering solutions, has resulted in this further success. The framework agreement, which is for an initial five years, and could be extended by three more years, was let by TfL to give smaller specialist contractors greater freedom to value engineer and innovate. Global Rail Construction is expecting mobilisation for these works to commence shortly. 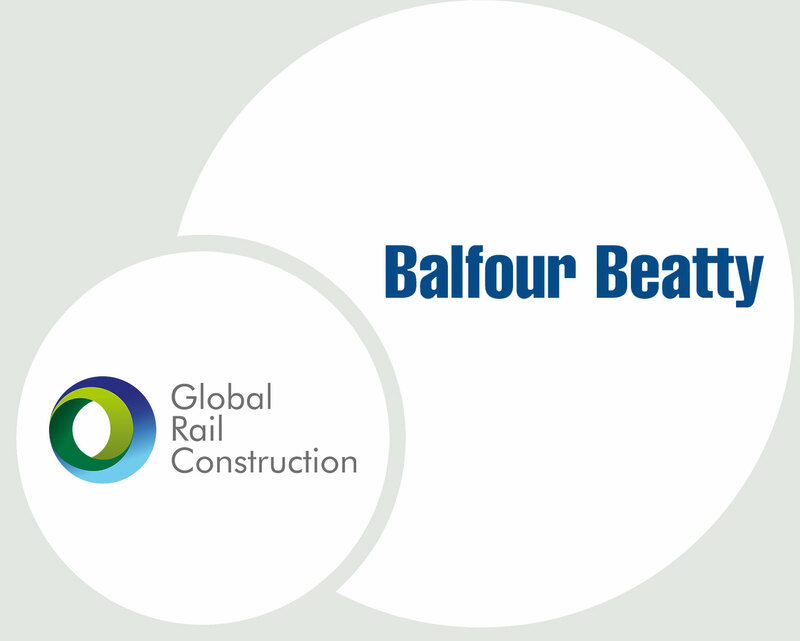 Global Rail Construction Ltd. is delighted to announce the continuation of its ongoing partnership with Balfour Beatty Engineering Services, with the award of Package 5A, which forms part of the sub-surface rail line upgrade on behalf of Transport for London. 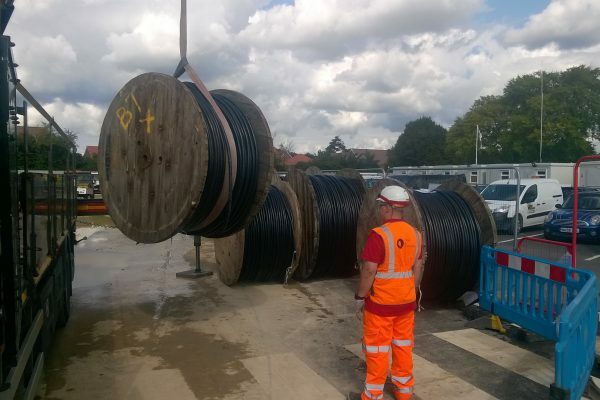 The full scope of the contract includes the design, installation, test and commissioning of 11kV and 22kV cables together with associated HV cable diverts and fibre optic pilot cables, and the decommissioning of four HV cables. 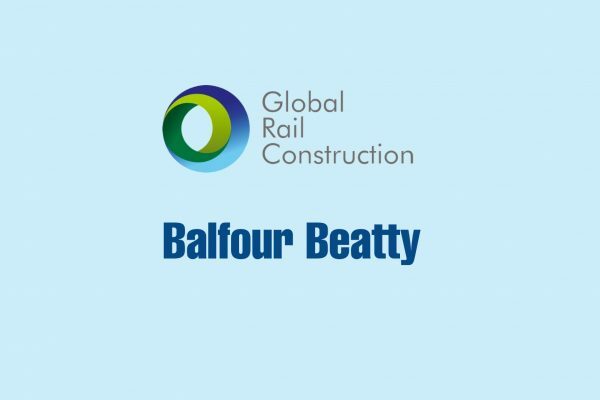 Global Rail Construction Ltd’s scope of works incorporates full material logistics, management and the installation of all necessary cable route containment from Neasden BSP through to Cobourg Street. The sub-surface rail line (SSR) power upgrade project primarily comprises the introduction of new rolling stock and signalling systems. As well as providing a greatly improved passenger environment that includes air conditioning, the new trains, coupled with the introduction of new signalling, will permit faster station-to-station running times and higher train service frequencies. 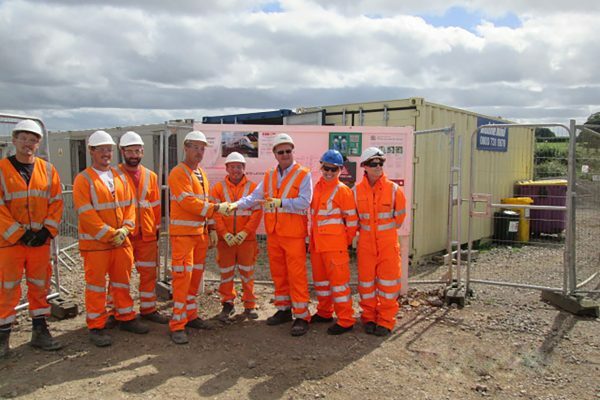 Global Rail Construction Ltd. has been awarded a second consecutive Network Rail Star Award for its exceptional approach to the management and control of health, safety, welfare and environmental practices at its sites on the Great Western Electrification Project (GWEP). One of the largest single infrastructure projects of its kind, GWEP will provide more reliable, greener and quieter journeys for thousands of passengers. Around 1,000 kilometres of railway will be electrified between London and Cardiff for the introduction of new Intercity Express trains by Hitachi. This major project will see Global Rail Construction Ltd. using its vast rail engineering experience to help deliver infrastructure works to bring GWEP into service, with most of the works being completed during the current control period. 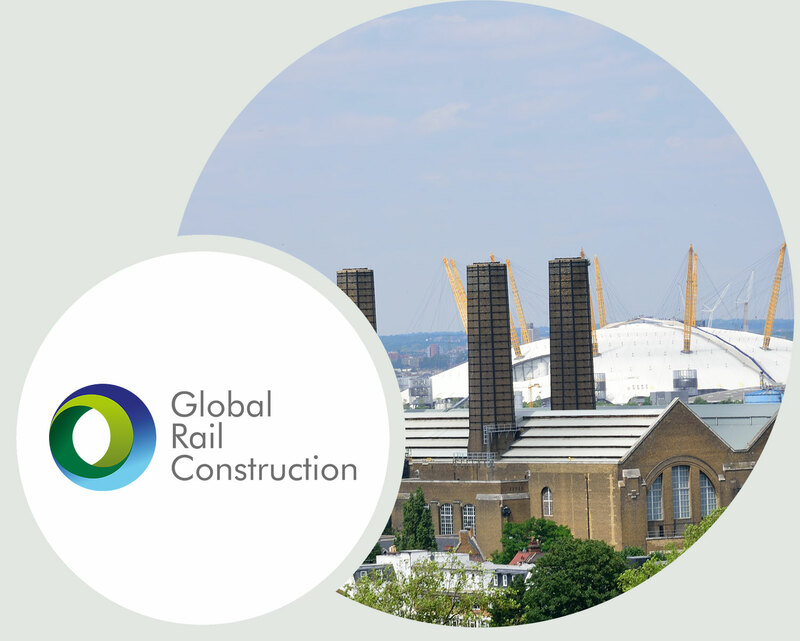 Global Rail Construction Ltd is part of the Global Infrastructure Group and is a leading UK provider of design and build services to clients in the rail and transportation sector. Owner and Managing Director, Marco Lombardelli, said: “This is testament to the operational cultures that we have developed, and working practices that our staff and supply chain have fully embraced, and this recognition is richly deserved. Having been issued a full Principal Contractors Licence, we intend to continue to work hard to ensure that we meet and exceed both our own and our clients’ expectations. Global Rail Services Ltd. – part of the Global Rail Infrastructure Group – has just been awarded the Luas Light Rail Cross City BXD Signalling, Electrical and Telecoms package on behalf of Efacec Portugal. Efacec is the Principal Contractor and responsible for the design, supply, installation and commissioning of the Control Systems for this new LUAS line, which has 13 stops and connects the current Green Line from St. Stephen’s Green through the city centre with the Red line at O’Connell St. Global Rail Services’ specialist contract includes a full railway systems installation and commissioning scope of signalling, electrical and telecommunications. The contract commencement date for planned works is September 2016 – and Global Rail Services is currently fully mobilising to meet this date. The project is due for completion at the end of 2017. GRA Networks has announced its appointment as the preferred supplier of construction services for Kona, on behalf of the Irish Defence Forces. and installation of a half-inch feeder cable, with cable management, on the tower to army communications room. GRA Networks is a multi-disciplined provider offering a comprehensive suite of services including design, construction, installation, commissioning and maintenance of both fixed line and mobile communications networks. As a full service telecommunications contractor, GRA Networks provides a comprehensive range of services from upgrading existing infrastructure, to building new mobile phone towers and other wireless network infrastructure. and provide future space for mounting additional passenger information display (PID) units for better communication of information to commuters. and contract completion and close-out. Global Rail Australia is part of the Global Infrastructure Group and is a leading Australian provider of design, construct and commission services for clients across a wide range of engineering and infrastructure industries. The company was selected as the preferred contractor on this project for its in-house capabilities, scale and supply chain partnerships. 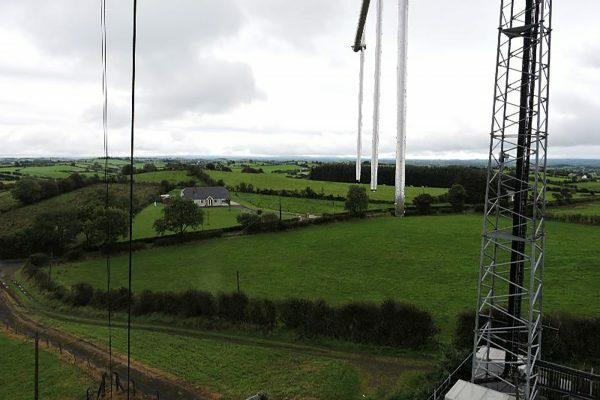 GRA Networks has completed the installation of a meteorological mast at a wind farm in Tievenameenta, County Tyrone. and torqueing of flange plate bolts to specification. GRA Networks is completing a project to reroute traffic and decommission transmission links for mobile communications company, 3. In 2015, 3 failed to regain planning permission for the SDH monopole in Glasnevin, Dublin, after the local authority called for its immediate decommissioning. 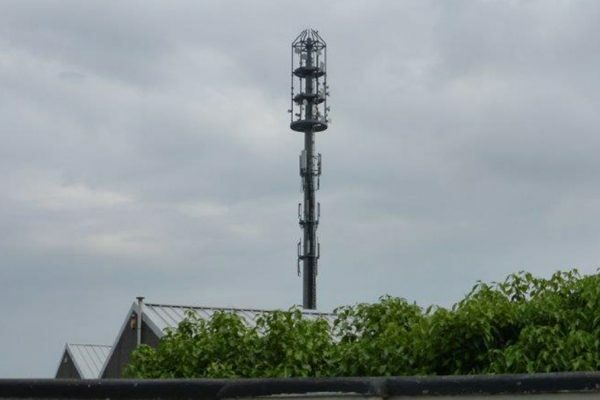 An Bord Pleanála, the independent statutory body, ordered that 3 remove the phone mast, despite warnings that it would cause major service disruptions for customers in Dublin, Louth and Meath. The 45-metre mast in the Dublin Industrial Estate facilitates mobile phone coverage and 2G, 3G and 4G internet services for 3 and Meteor customers in the area and farther afield. Local residents wanted the structure removed due to its “visually obtrusive” nature – a decision which An Bord Pleanála upheld. Glasnevin is a very important area for 3, serving a key section of North Dublin and carrying a lot of traffic via microwave dishes and fibre. 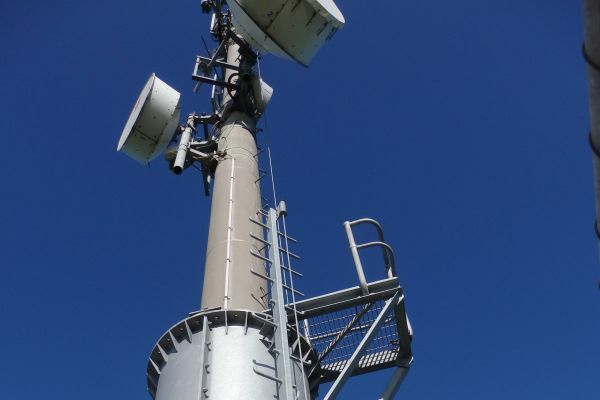 GRA Networks was contracted by the mobile communications giant to complete a package of works to re-route links on Site 34 and decommission links on the tower. This includes included carrying out line of sight surveys, interconnects, and the patching and rerouting of traffic at several sites around Dublin. and the re-route of several associated sites. 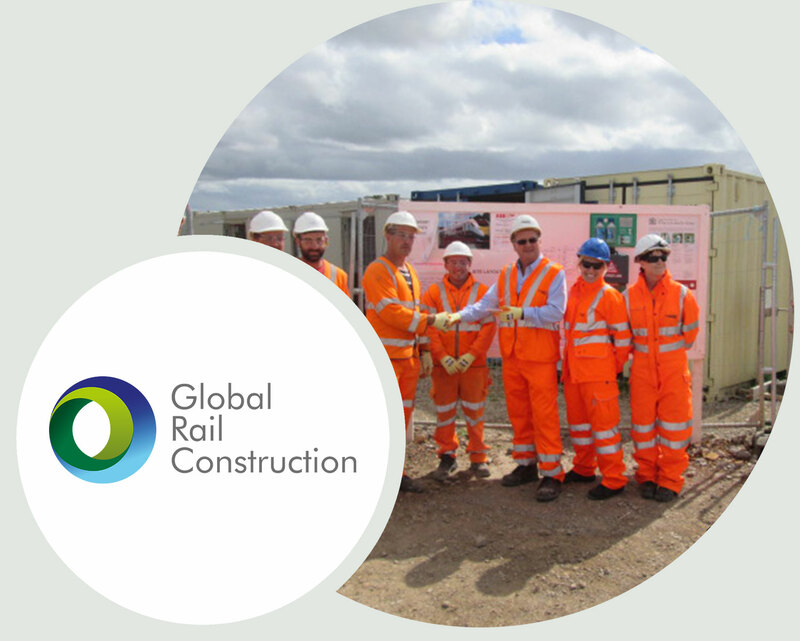 Global Rail Construction Limited has been awarded the Network Rail Star Award for their work sites on the Great Western Electrification Project with an impressive score of 91.6%. Network Rail’s STAR award programme recognises and rewards sites, work groups or compounds that meet and exceed high levels of health, safety and environmental risk control. A site must gain at least 90% to achieve a STAR award. 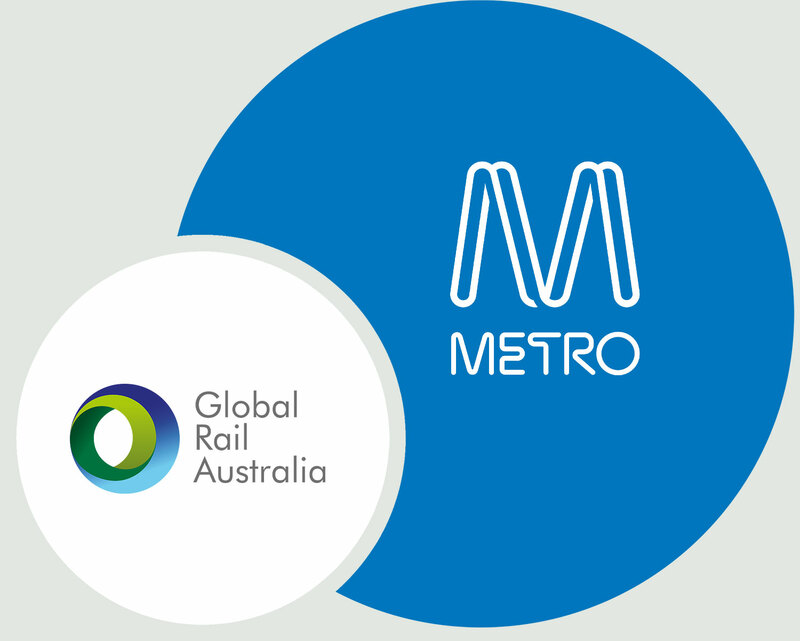 Global Rail Australia are delighted to announce the granting of our Commercial Builders licence Medium Rise. 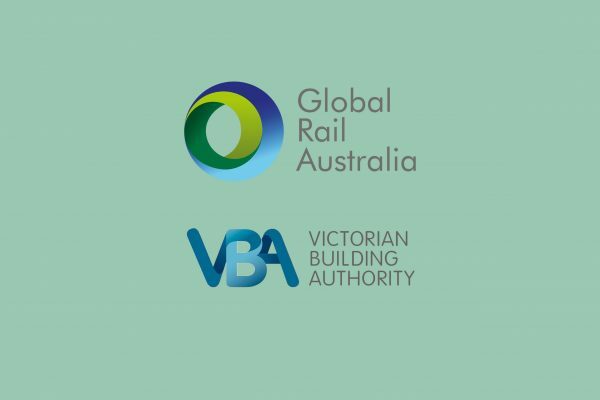 The licence which was given to CEO Ivan Holloway, will allow Global Rail Australia to build up to 25 metres in height and undertake bulk excavations up to a depth of 8 metres in throughout the State of Victoria. The work permitted additionally includes structural and non-structural fit out work for buildings up to 25 metres in height and also structural landscaping associated with those buildings. Global Rail Construction Ltd (GRCL) has been awarded a full status Network Rail Principal Contractor Licence – a key milestone for the UK railway infrastructure and systems contractor. This licence provides the company with the opportunity to act directly as a main contractor for Network Rail on the delivery of major railway infrastructure projects across the UK. After successfully being selected through Network Rail’s comprehensive supply chain selection process, and following a rigorous two-stage audit of GRCL’s systems and on site management, the Network Rail Principal Contractor Licence scheme assessed the competency and application of GRCL’s workforce, operating culture, processes, procedures and HSQE practices, concluding that it is fully assured to deliver works safely, and to the highest possible standard. 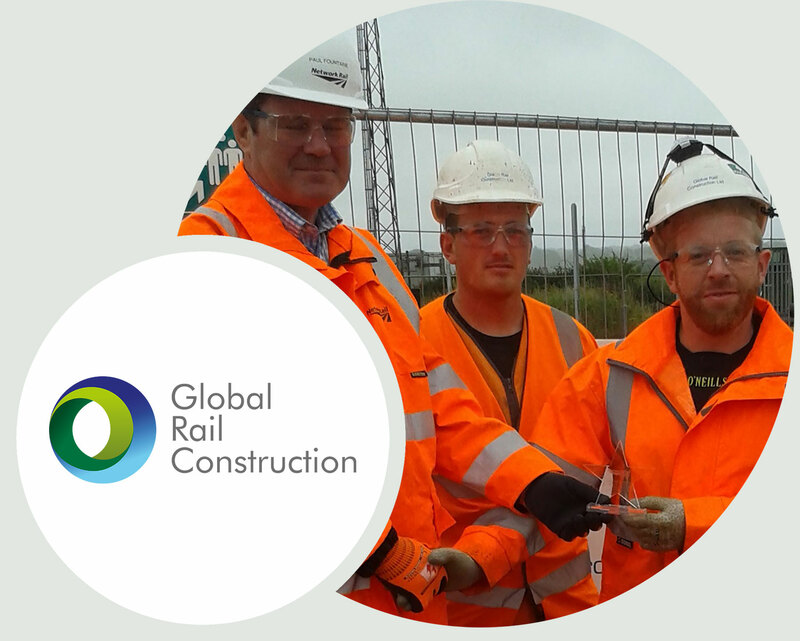 Global Rail Construction achieved a provisional licence in 2014, following a rigorous review of its procedures and the success of the works undertaken on a number of projects including the ASDO signalling project for Network Rail’s Wessex route. Managing Director of Global Rail Construction, Marco Lombardelli, said: “This outstanding achievement is testament to the combined efforts of the whole team since gaining provisional status. 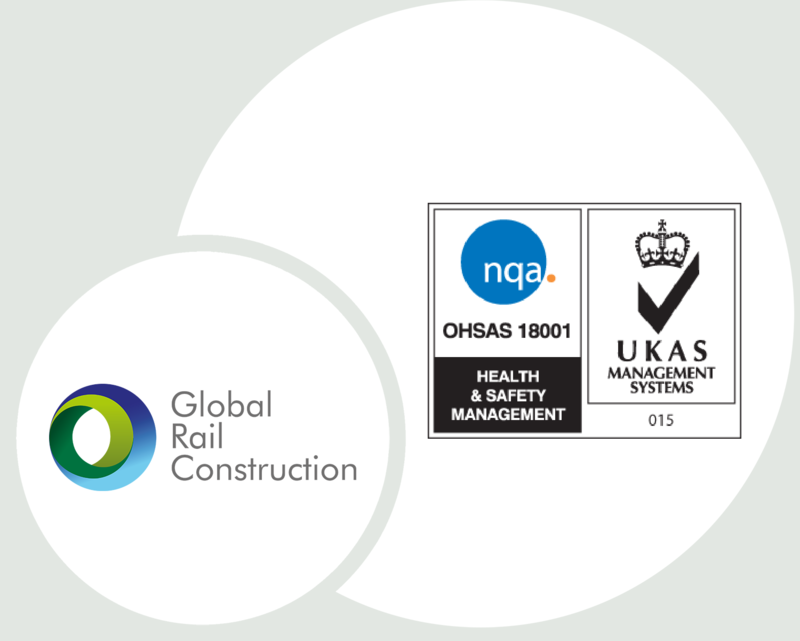 Gaining a full Principal Contractor Licence validates Global Rail Construction’s commitment to the control of quality and safety assurance, and demonstrates a culture of railway excellence that is the very cornerstone of our business. 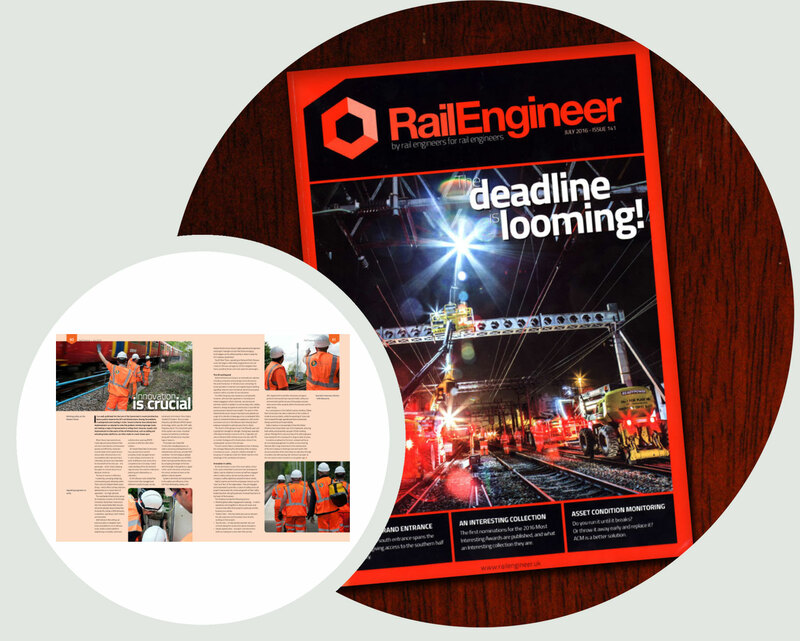 Global Infrastructure Group gained valuable press coverage this month through a double page spread in the July edition of Rail Engineer. 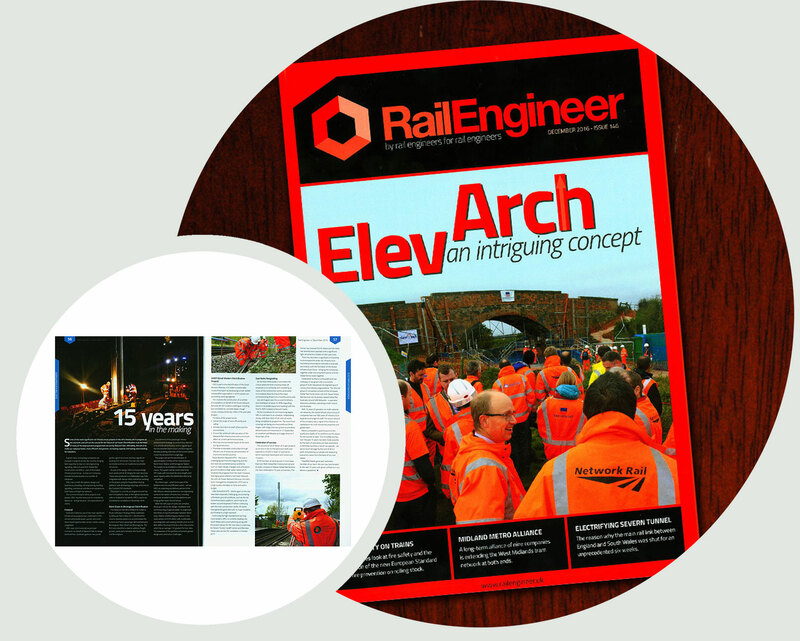 The article leads on the way railway infrastructure providers must employ innovation to add value for their clients, citing how the UK arm of the group – Global Rail Construction Ltd. – applied this to their recent ASDO project for Network Rail’s Wessex Route. The approach taken by rail engineering specialist Global Rail Construction Ltd. involved meticulous planning and high levels of collaboration to minimise disruption to the railway infrastructure. Credit is also given to Global Infrastructure Group’s strengths in collaborating with other contractors, suppliers and stakeholders, and its ability to understand the multi-disciplinary nature of rail projects. The second half goes on to describe Global Infrastructure Group’s recent period of growth and rebranding, to provide its public and private sector clients with complete clarity around its unique infrastructure offering in the UK, Irish and Australian markets. The publication was pleased to note the Group’s Safety Coaches programme, which will be of great interest and benefit to the industry. Lough Rynn Castle is one of Ireland’s most luxurious castle hotels, set on the shore of Lough Rynn, surrounded by over 300 acres of breath-taking scenery. Trip Advisor reviews boast of it being a ‘hidden gem’ but the only drawback for guests to this majestic hotel was the lack of Wi-Fi and mobile phone coverage. 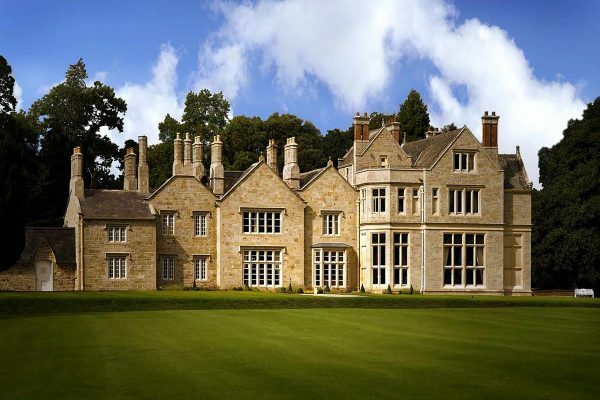 The black spot was targeted by Vodafone and Netshare Ireland and the work, which was awarded to GRA Networks, was executed promptly, efficiently and very discreetly so as not to cause disruption to any of the staying guests. General Management of the hotel expressed their delight to Netshare Ireland regarding the efficiency of the GRA Networks team and have noticed a significant improvement in their coverage. 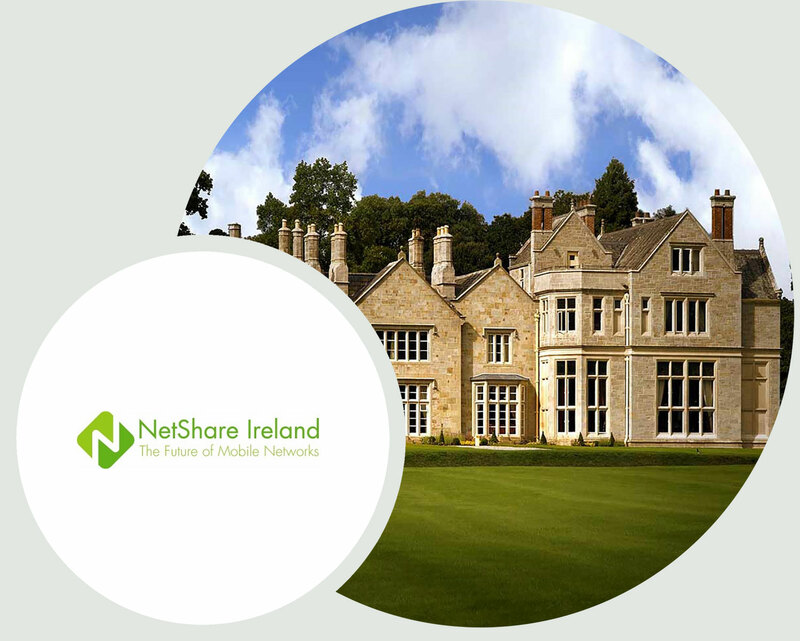 Off the back of this significant improvement, Netshare Ireland are using the Lough Rynn project success as an example to other hotels in remote locations around Ireland. 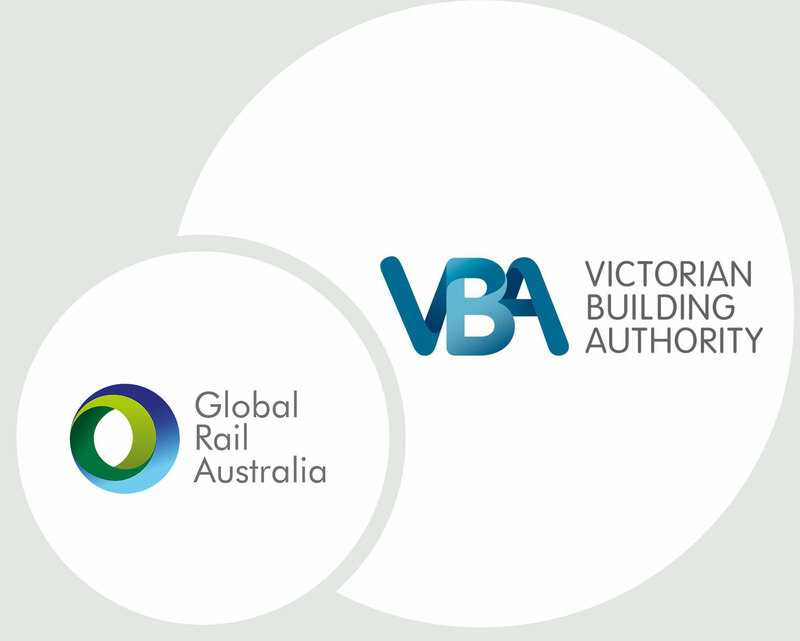 Global Rail Australia, have recently been appointed as Framework Contractor for construction services on behalf of Yarra Trams, Melbourne. The contract, which covers the largest operating tram network in the world, with over 250 kilometers of double track and 1763 tram stops, has an annual patronage of over 180 million. 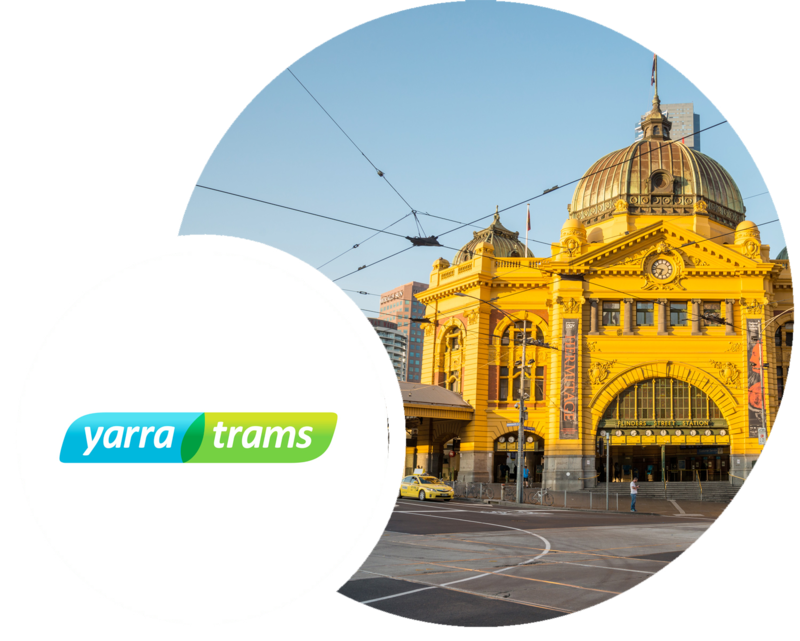 As an experienced railway provider, with offices and in-house engineering support directly from Melbourne, Global Rail Australia were seen as the perfect partner of choice to work with Yarra Trams on this year long framework. 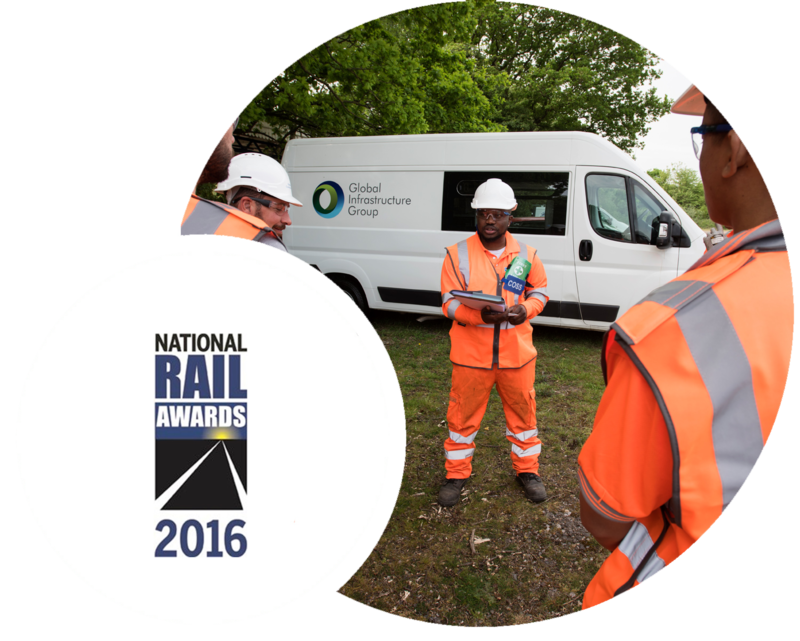 Global Rail Construction’s Safety Coach Initiative – has been shortlisted by a panel of experts for the National Rail Safety Award. As one of the most important National Rail Award categories, safety has always been high on both public and political agendas – and rightly so. 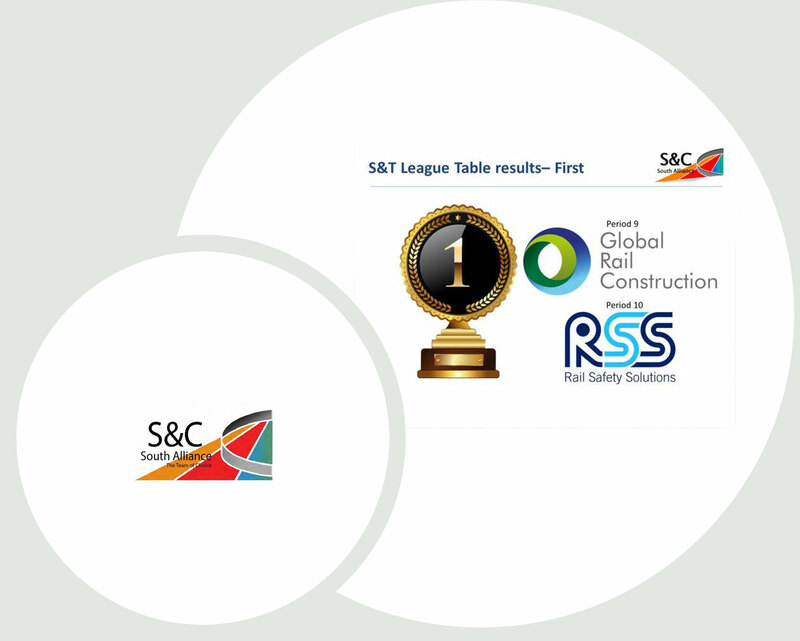 Having been shortlisted the judges were clear on Global Rail Construction’s tangible commitment to improving safety. 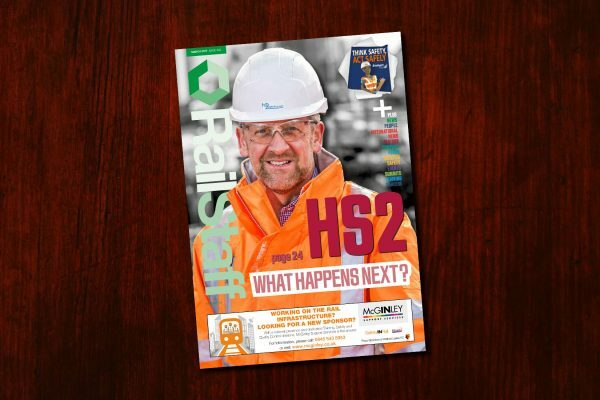 Global Rail Construction’s Safety Coach initiative has been instigated as a long-term measure and is part of an embedded culture of practices to influence both employee and supply chain behaviours. Just under a year ago, Global Rail Construction commenced its Safety Coaches initiative as part of its overall Behavioral Safety Management Programme. Safety Coaches are front line employees that act as the “Voice” and “Face” of the organisation. They are engaged and empowered to promote a culture of safety across all projects and provide the continued growth of our safety leadership team, values which are at the very heart of the business. 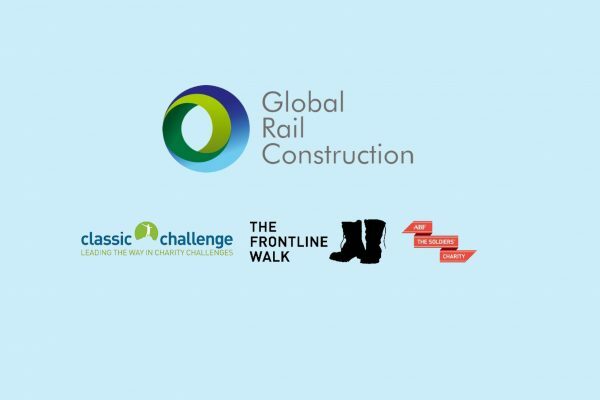 The next steps are to present to a further panel at the end of June, as Global Rail Construction look to further demonstrate their commitment to all railway stakeholders who come into contact with their day-to-day activities. 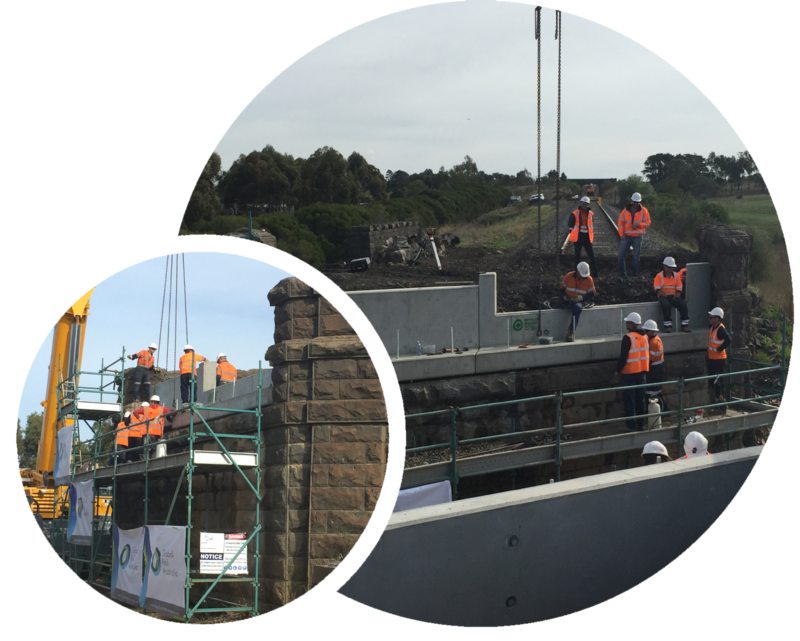 Having successfully secured the contract on behalf of regional train operator V-Line in August, to fabricate and install a new bridge superstructure in Victoria, Global Rail Australia completed the bridge installation works during a major railway occupation over a weekend shutdown starting on 19th May 2016. Taking possession of the railway on Friday morning, Global Rail Australia worked to a fully resourced hour-by-hour program, providing round-the-clock contingency arrangements in respect of weather, plant breakdown and resources to complete the works. Having already pre-fabricated the superstructure Global Rail Australia, were able to confidently strip out the existing life-expired structure, safe in the knowledge that the new bridge superstructure was within tolerance. Having established an excellent working relationship with V-Line on previous projects, the team were able to co-ordinate their activities with the client and minimise the impact of their operations on the client and their stakeholders. Providing a full turn-key solution allowed Global Rail Australia to act as the single point of responsibility throughout, managing staff and specialist suppliers to ensure that the track was re-instated and the railway was fully handed back on time at the end of the occupation on 22nd May 2016. 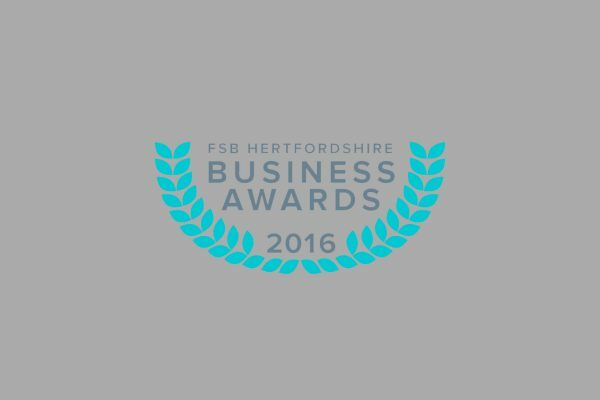 Hot on the heals of their other award success, Global Rail Construction have been nominated as finalists for the FSB Hertfordshire Business Awards. Their nomination for the Green Award reflects the company’s sustainable approach to business in terms of reducing or removing the harmful impact that its products and/or services have on the environment; the business has also been selected as a finalist for Welwyn and Hatfield Business of the Year. Global Rail Construction place a lot of importance on the role they play in their local community and this nomination, which highlights the businesses outstanding initiative, as well as sound management practices, also focuses on our boldness and imagination as a local enterprise. These awards further demonstrate Global Rail Construction’s on-going and sustainable growth, which provides a platform for our long-term commercial success. 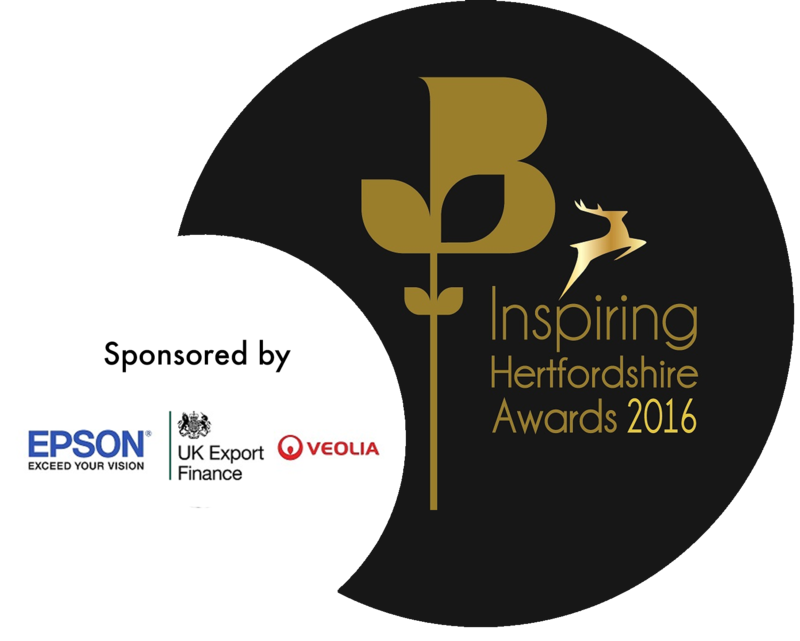 Global Rail Construction, having recently entered three categories at this year’s Inspiring Hertfordshire Awards, have been nominated as a finalist in all three for Business of the Year, The Environmental Award and also Achievement in International Business. The Business of the Year award recognises demonstrable levels of growth and our robust plans for sustainable financial performance, whilst the Environmental Award has noted to date our responsible business practices in relation to the environment, community and people – aligning with our business core values. Finally, the Achievement in International Business nomination recognises the successful trade of the wider Global Infrastructure Group of companies. A representative from the Award category sponsor plus two independent judges presided over each entry and after a fiercely fought completion Global Rail Construction were shortlisted for these prestigious awards, awards that recognise the importance of the business in the Hertfordshire region. Neville Reyner, Chairman of the Hertfordshire Chamber of Commerce Board, also moderated the entries. 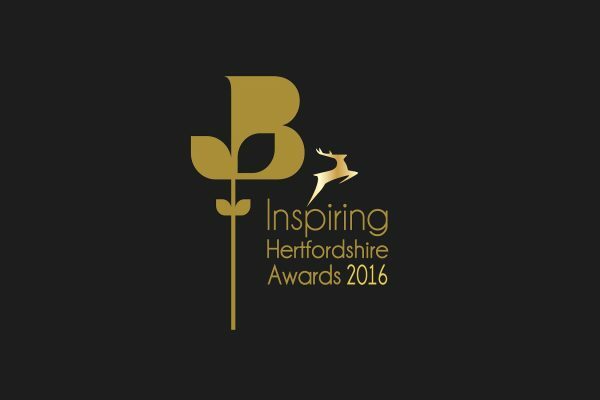 The full list of finalists is available at http://www.hertschamber.com/2016-finalists. 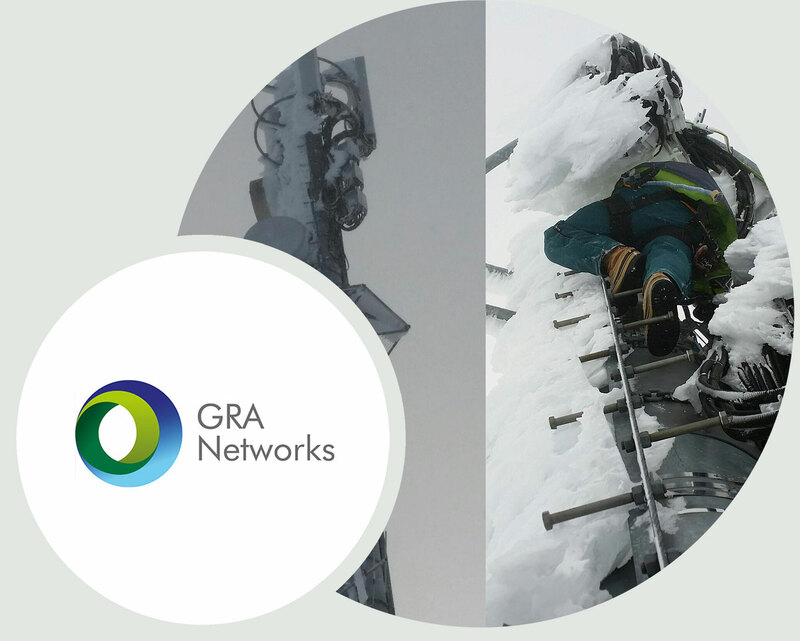 Irish Rail as part of their rail network communications upgrade works, have awarded GRA Networks works as part of the 2-3 year phased roll out of GSM-R – which is the international wireless communications standard for railway communication and applications. 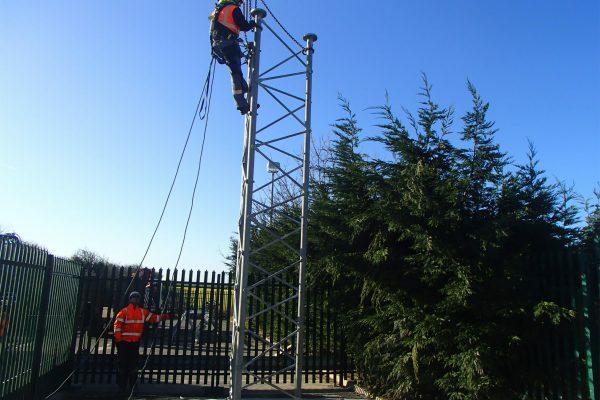 The system, which is used for communication between the train and railway regulation control centres, requires GRA Networks to install a series of Relocatable Equipment Buildings (REB) and telecoms towers. 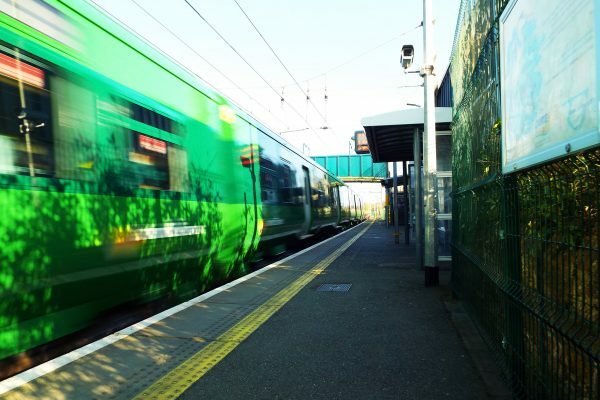 The system on installation, will guarantee Irish Rail performance speeds at 310mph, without any communication loss and the system can transmit both data and voice. 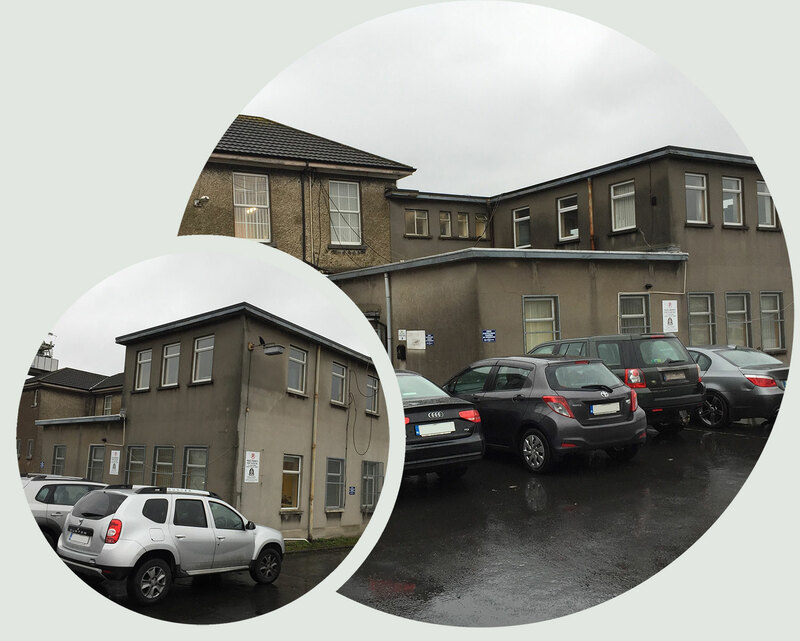 Working to a phased completion program, GRA Networks have completed sites at Jonesborough, Limerick, Gormanston and Rush and Lusk and their multi-faceted team are providing to be a safe, secure and collaborative working partner. Phase 2 has now commenced, as GRA Networks look to continue to reach the heights expected – by delivering works on time and to the required budget. Global Rail Services project works on behalf of the National Transport Authority, are heading towards the completion date of Autumn 2016. The large multi-disciplinary project – which has been commissioned by the National Transport Authority – is part of providing a fourth direct route into Dublin city centre via Heuston Station, by upgrading a branch line that will serve as a direct connection to the Kildare commuter areas – both North and South of the city. Global Rail Services upgrade of the 735m long tunnel, will allow commuter trains to operate through it for the first time and is fundamental to addressing the current deficiencies around Kildare. The project is reliant upon Global Rail Services multi-disciplinary in-house approach. 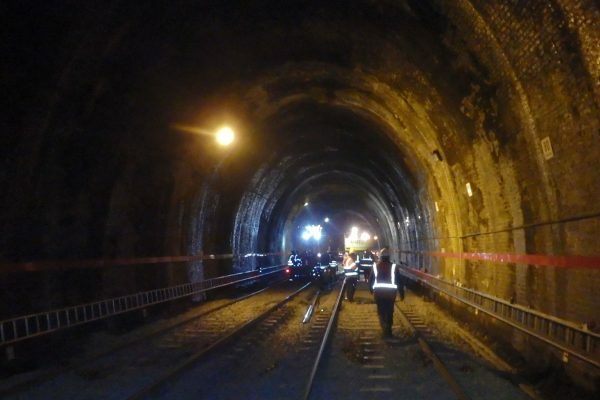 Works in the tunnel not only include cleaning and repairing the masonry and providing new signage, new lighting and telecoms are also required. 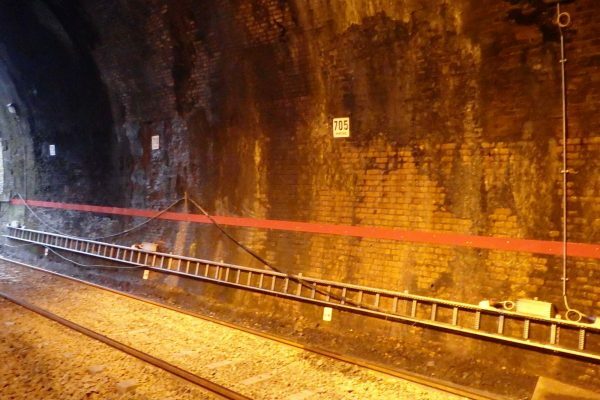 Separately Global Rail Services carried out site investigation works on the existing steep embankments leading to the tunnel. The project examined the stability of the existing embankments and recommended stabilizing works required for the reopening to commuter usage. 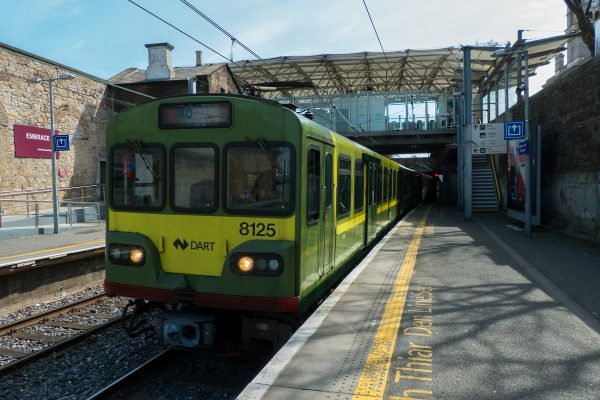 Not to be left out, GRSL’s building division have also been busy preparing for the new passengers, by upgrading the both Drumcondra and Tara Street stations. Works include new ticket gatelines and a new liftshaft. The project challenges around working in a live railway environment have been planned professionally by the experience rail team, allowing the project to stay on track for its completion date. 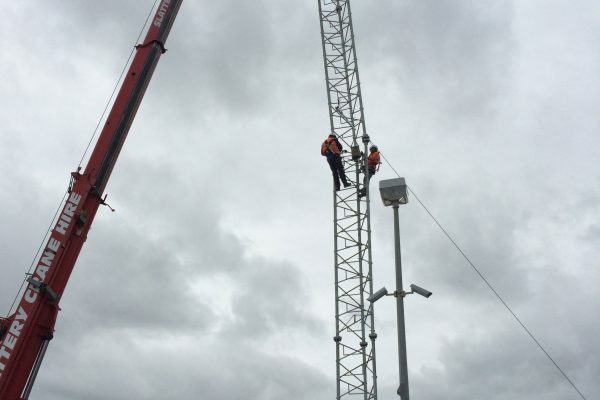 GRA Networks, have recently completed work on a new Vodafone Greenfield transmission site in Caroline Springs, Melbourne. 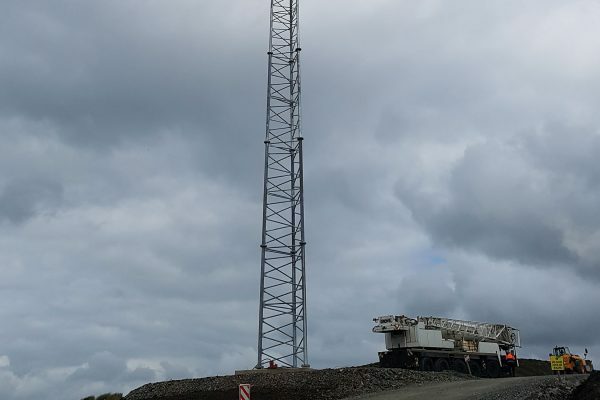 GRA Networks who also operate from a base in Dublin, Ireland, have successfully concluded the work, which involved the installation of a new 30m monopole, along with the supply and installation of a new ROAM headframe. 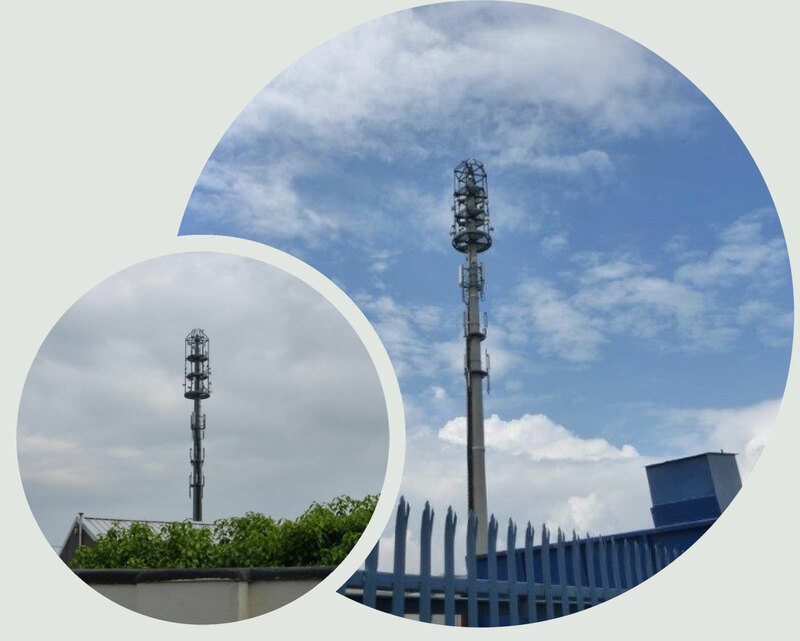 The telecoms equipment installation included six panel antennas, eighteen RRU’s, eight fibres, along with all the associated Huawei BTS equipment including the installation of a new TX microwave link. 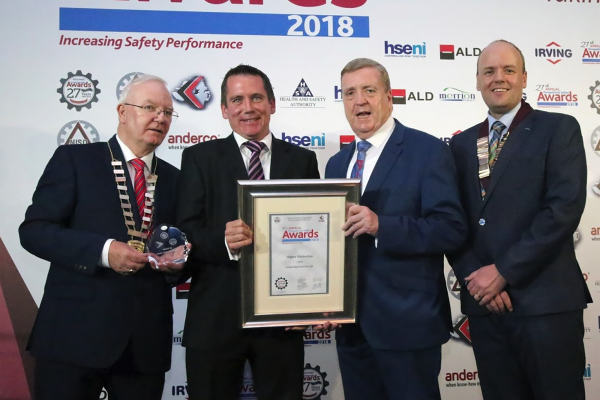 By promoting a safety culture through a series of events such as the All Ireland Safety Awards, the National Irish Safety Organisation (NISO) are able to credit those organisations who make a positive impact on the lives of their workers and the stakeholders they engage with. 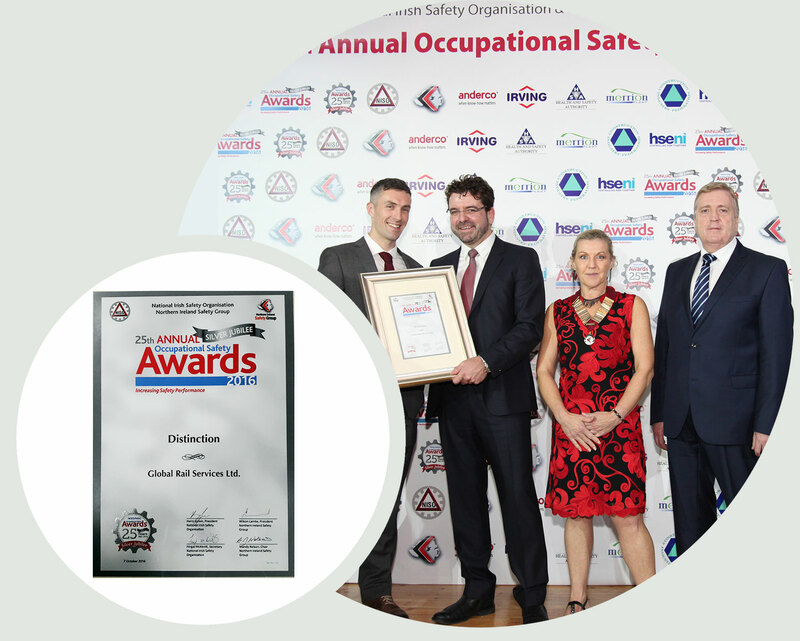 With health and well-being central to their approach, Global Rail Services were commended for their continuous improvement in occupational health and safety management. This performance is achieved through the implementation and maintenance of an occupational health and safety management system which meets and is fully accredited to the requirements of OHSAS 18001:2007.